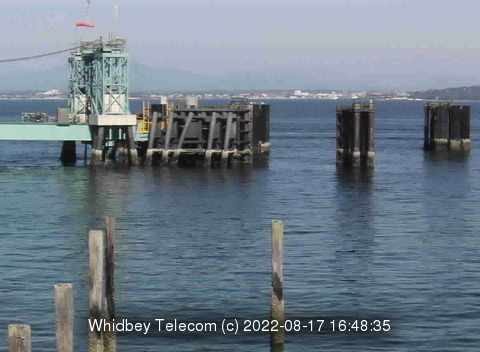 Links are for specific camera images. 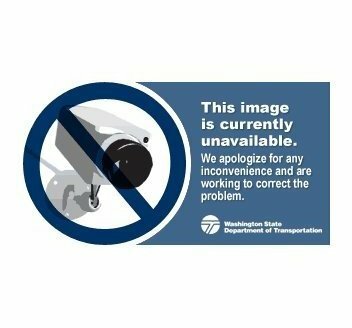 Please remember to check your route on the Travel Alerts page. 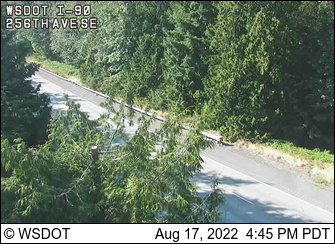 Main north-south route through western Washington which runs in its entirety from Canada to Mexico. 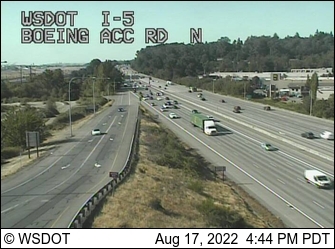 Major Washington cities include Seattle, Tacoma, Vancouver, Olympia, Bellingham and Everett. 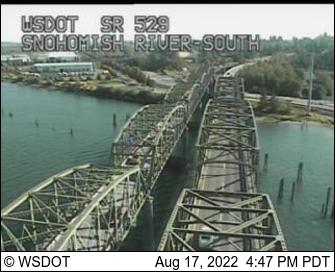 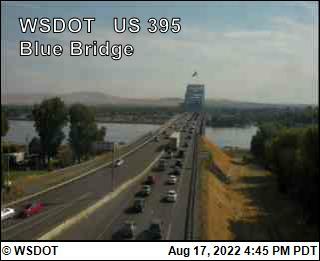 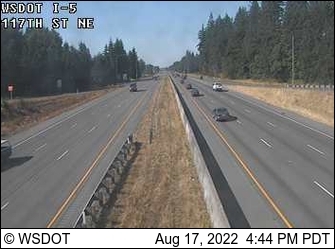 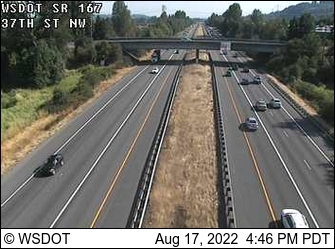 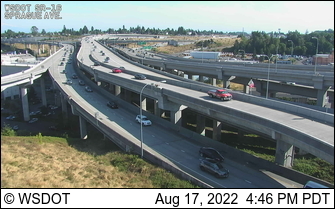 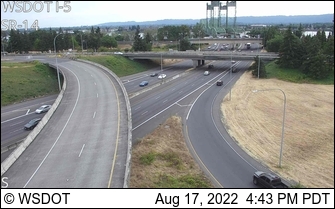 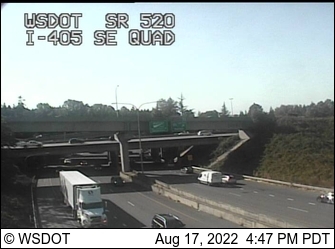 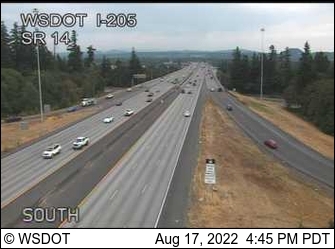 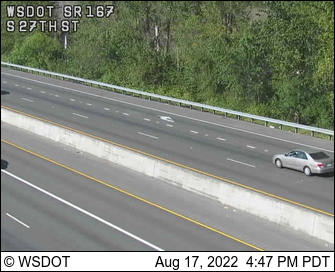 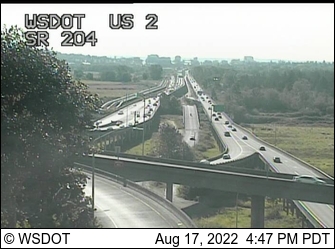 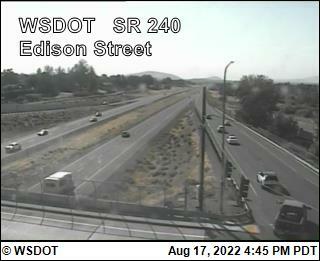 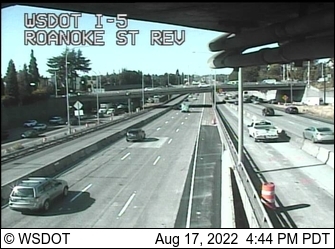 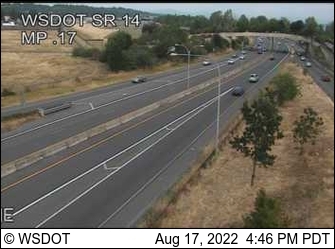 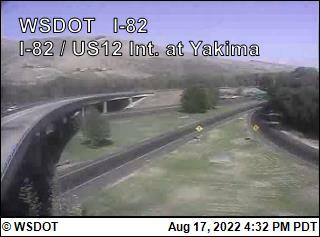 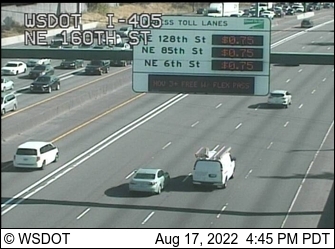 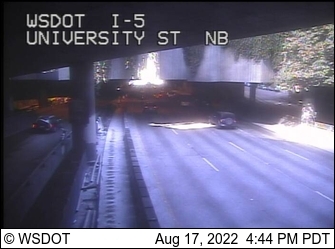 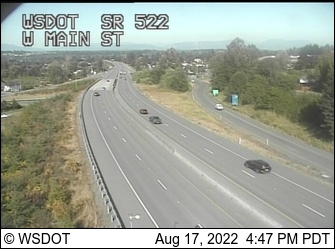 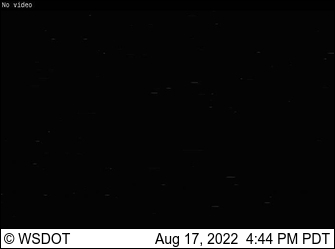 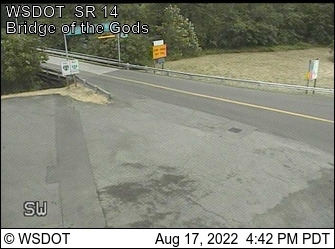 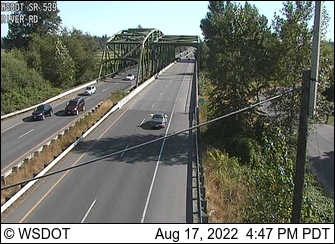 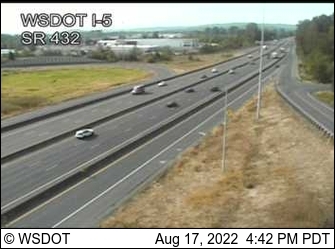 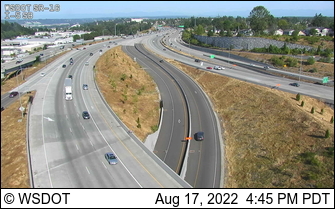 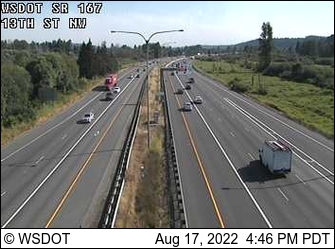 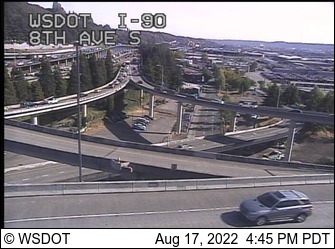 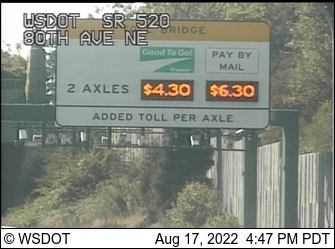 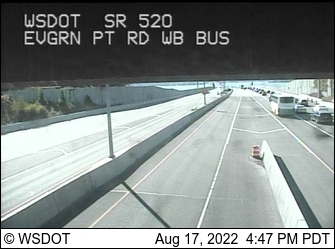 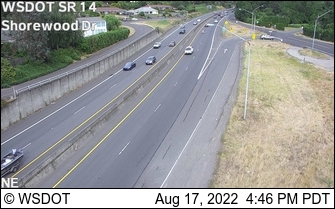 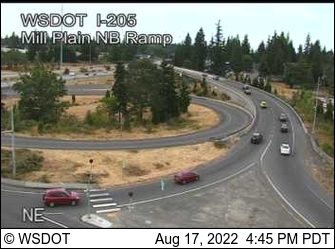 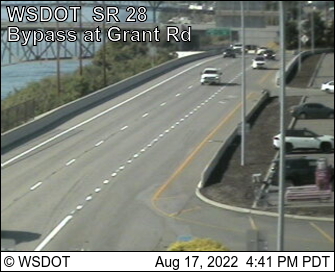 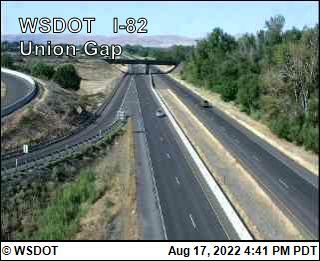 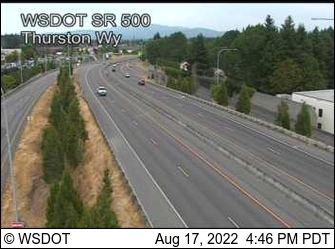 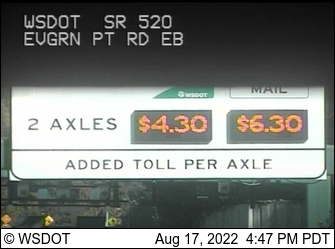 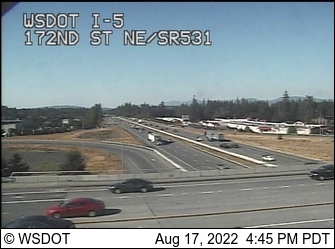 Splits off I-5 north of Vancouver and provides a bypass east of Portland. 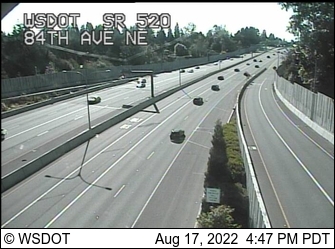 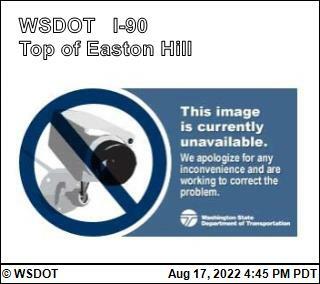 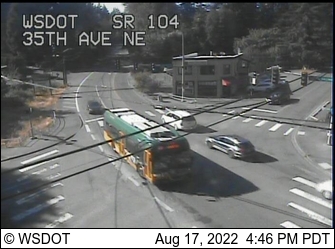 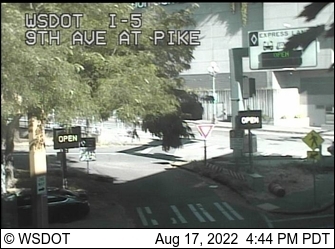 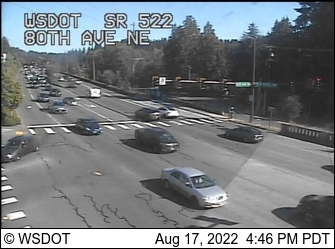 Runs north and south east of Lake Washington between Lynnwood and Tukwila through Bothell, Bellevue and Renton. 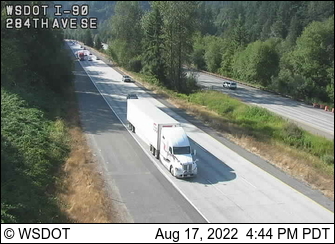 Main east-west route across Washington runs from Seattle over Snoqualmie Pass through Ellensburg over the Columbia River at Vantage and beyond Spokane where it continues into Idaho and all the way to Boston, MA. 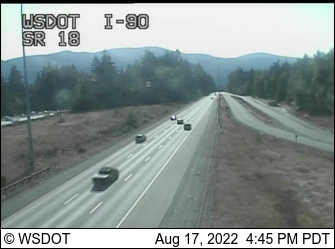 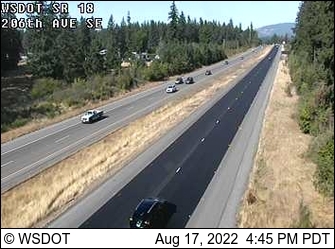 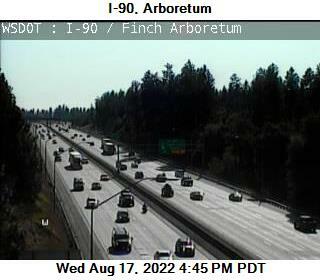 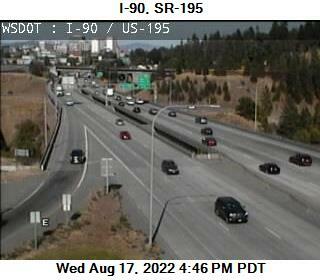 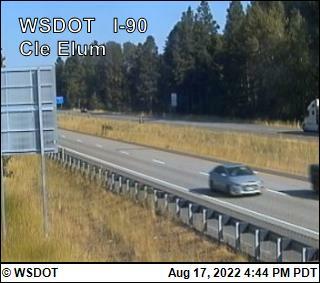 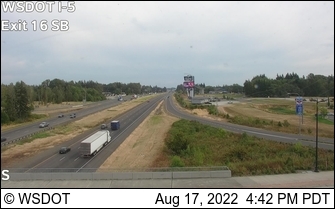 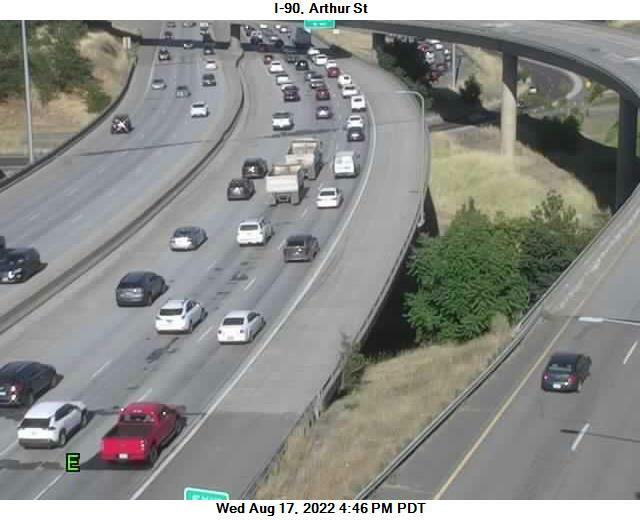 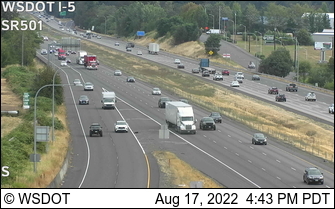 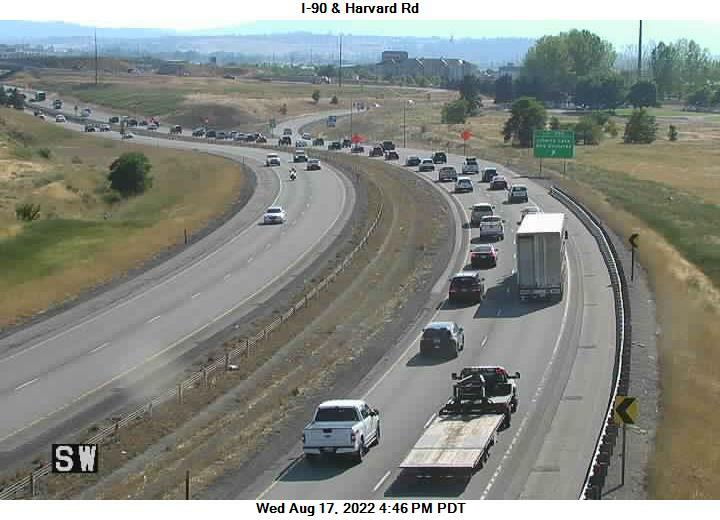 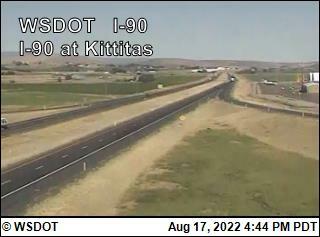 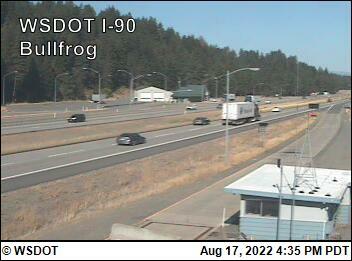 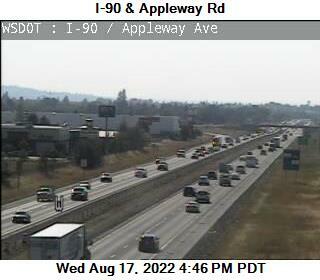 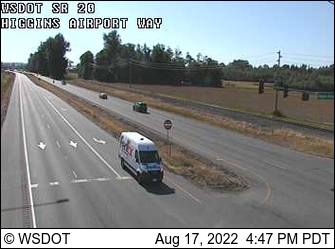 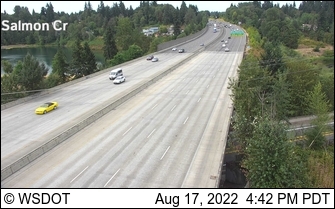 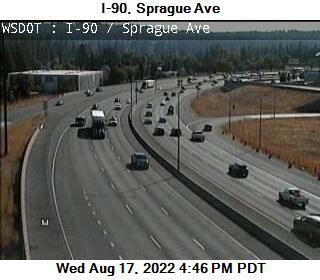 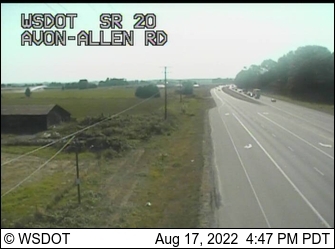 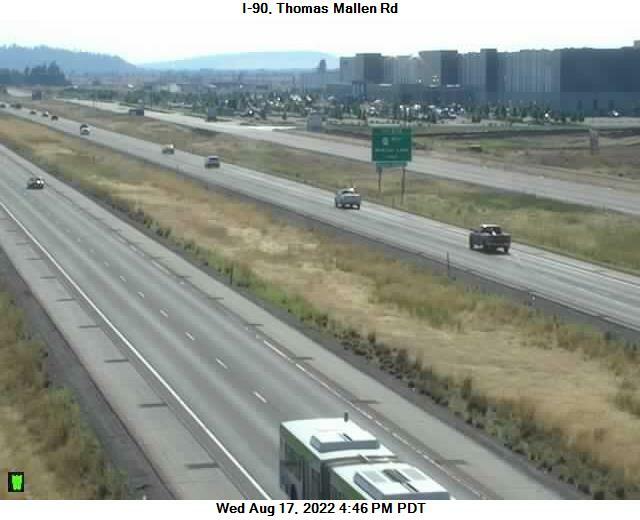 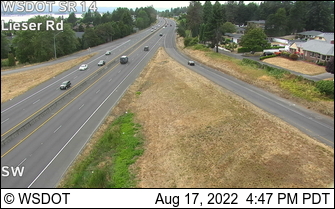 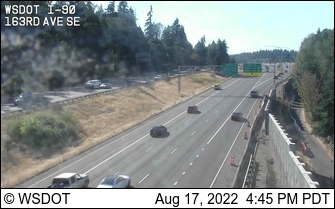 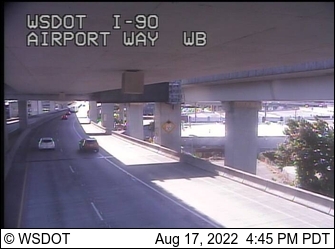 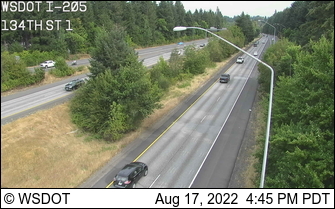 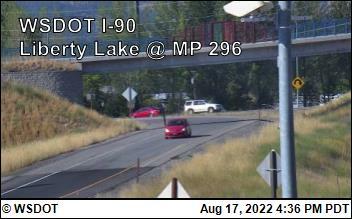 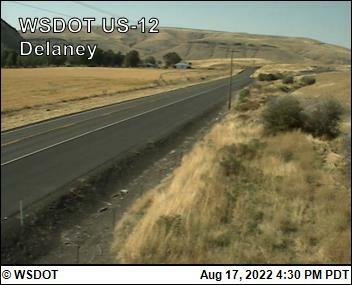 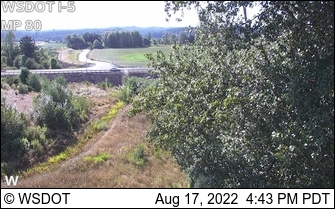 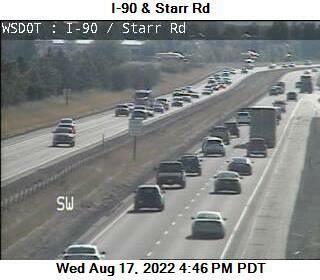 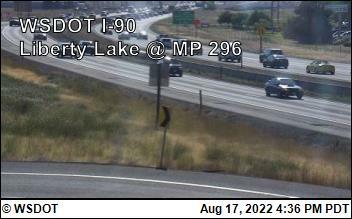 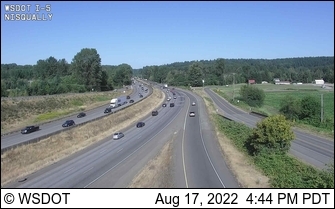 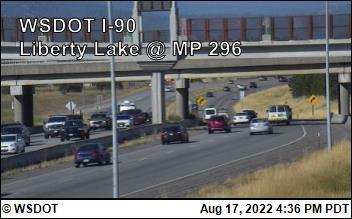 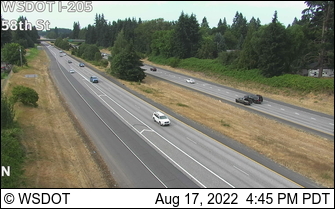 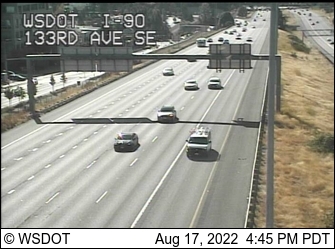 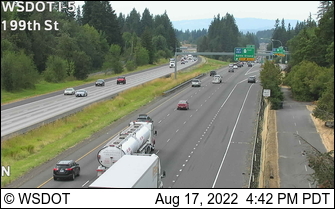 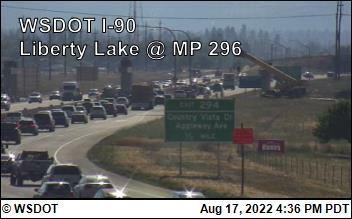 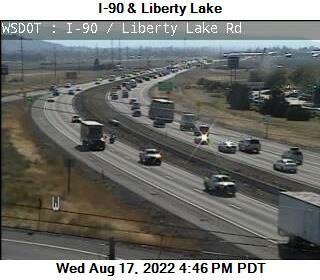 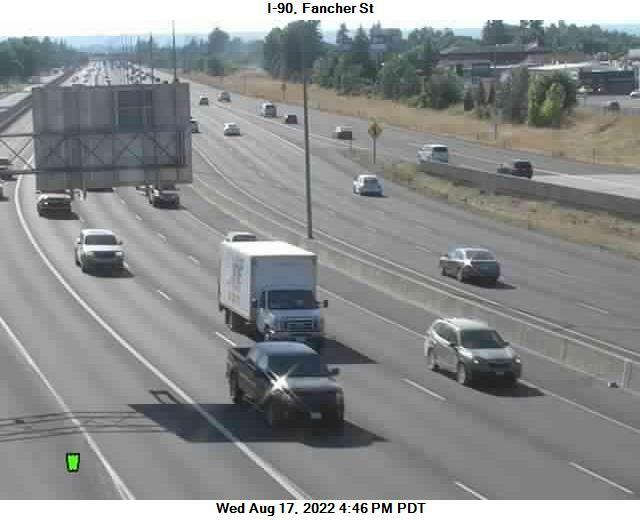 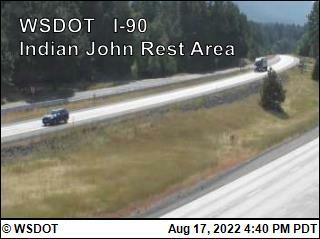 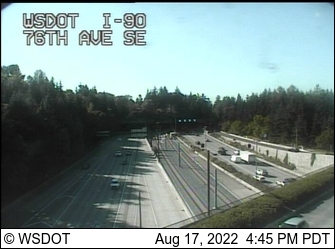 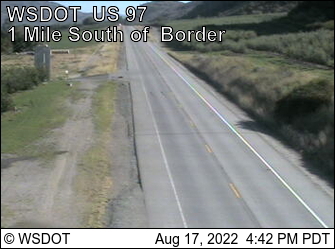 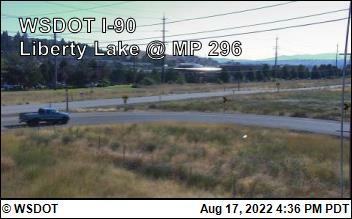 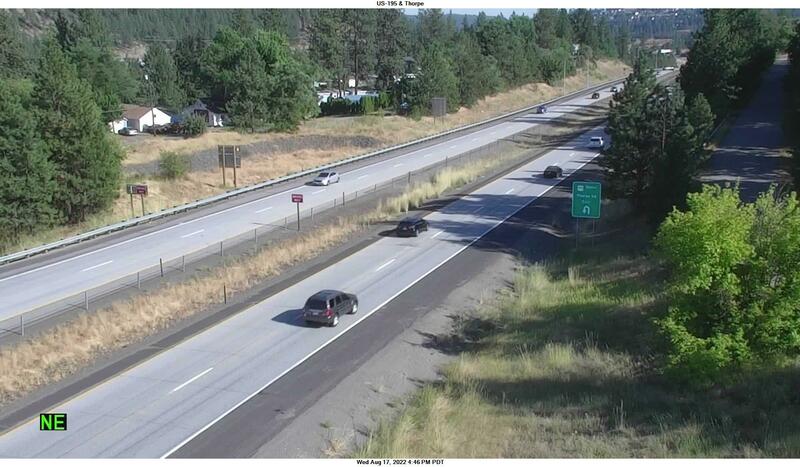 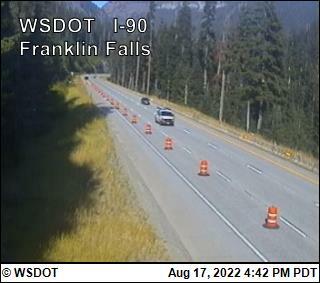 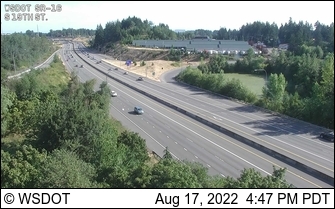 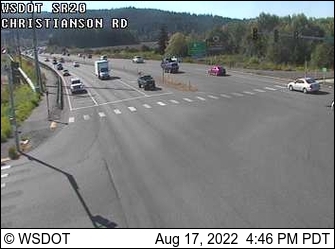 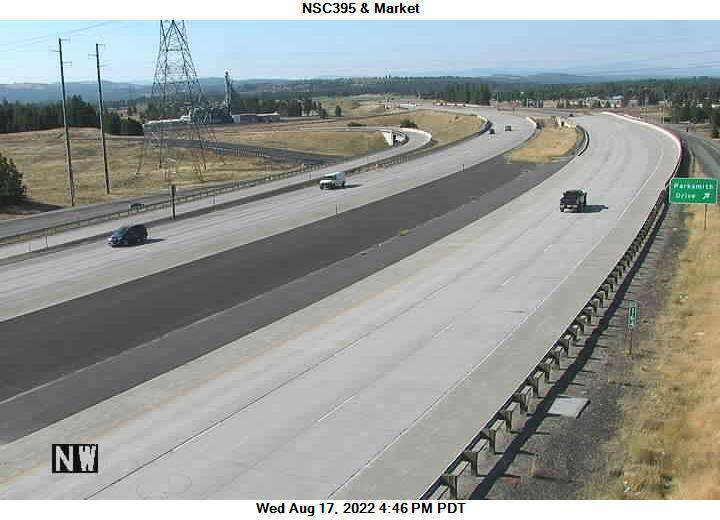 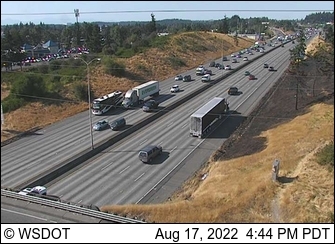 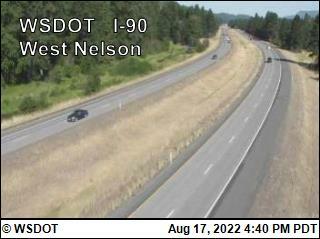 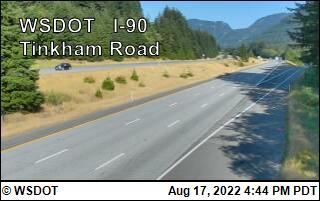 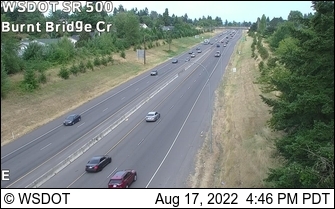 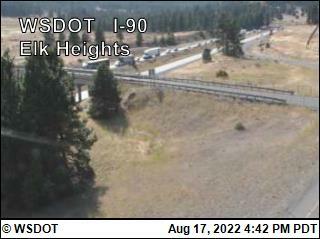 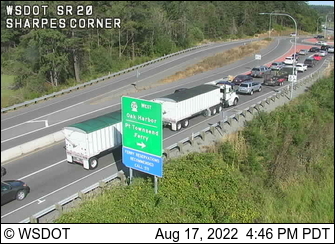 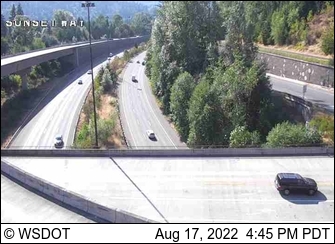 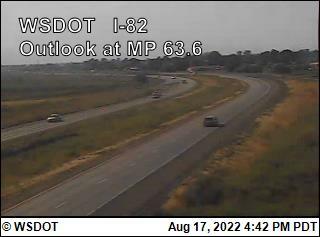 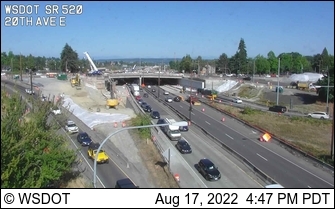 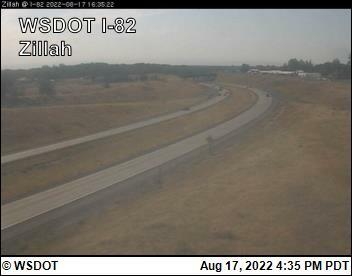 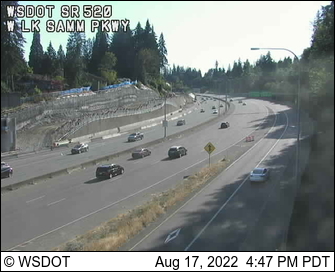 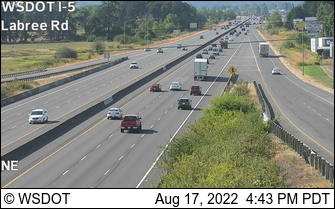 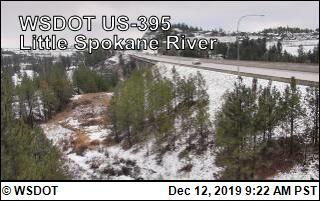 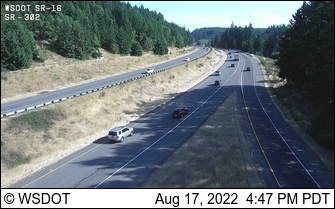 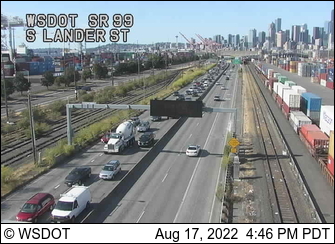 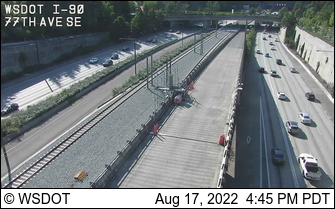 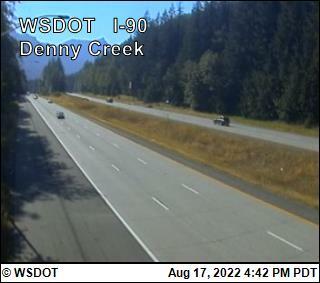 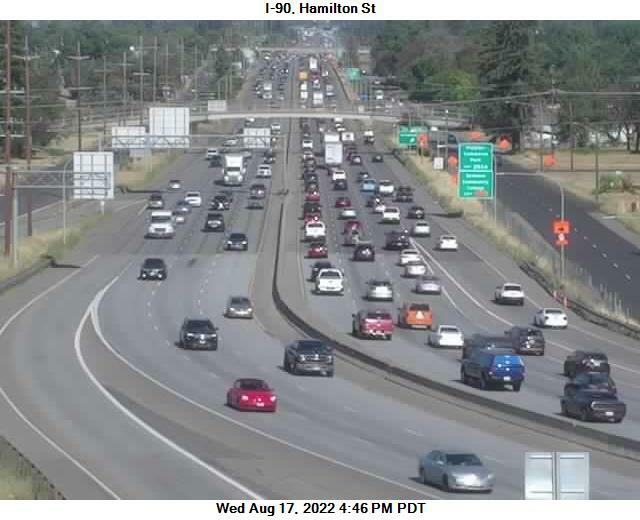 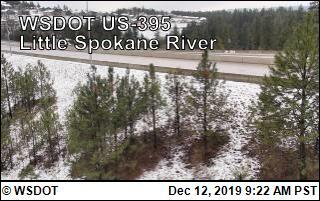 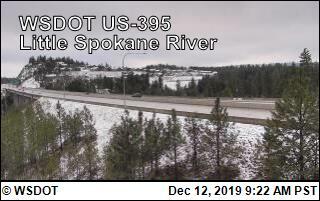 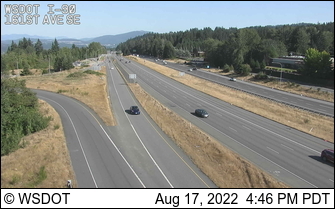 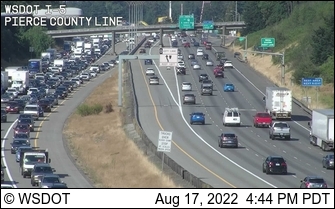 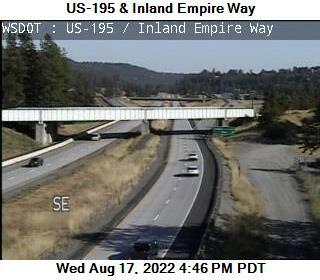 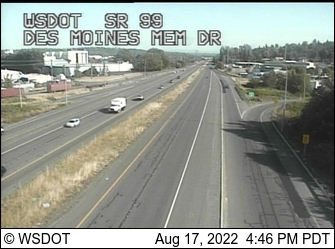 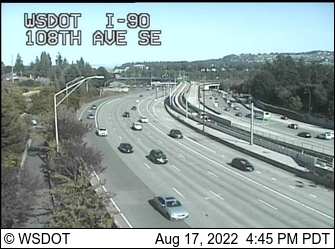 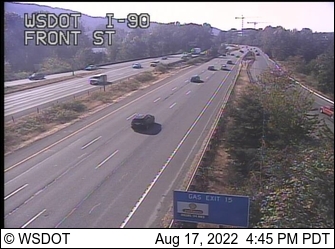 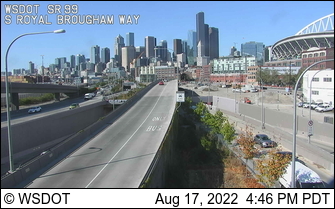 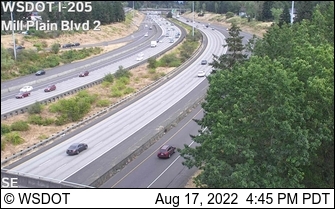 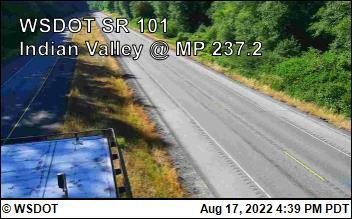 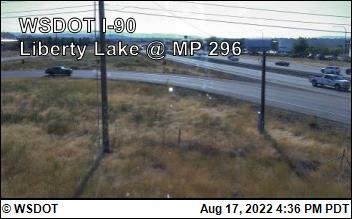 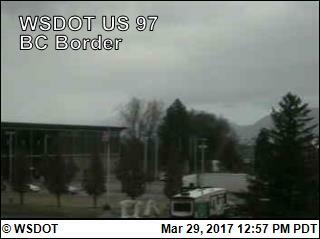 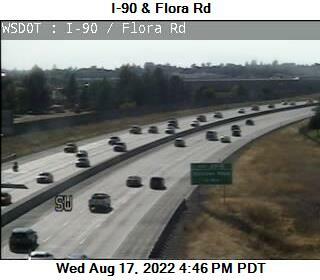 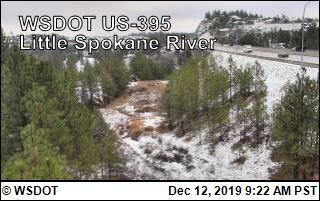 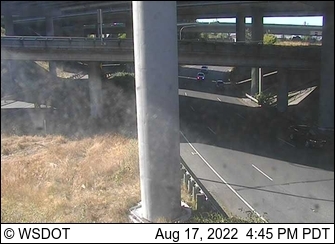 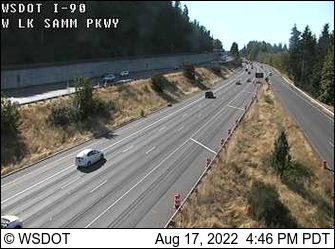 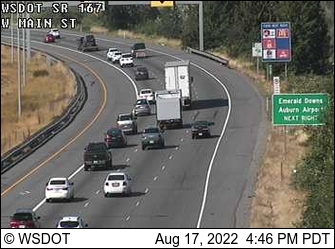 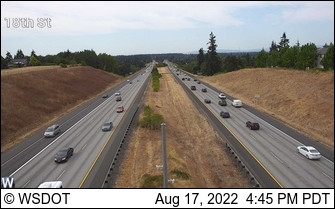 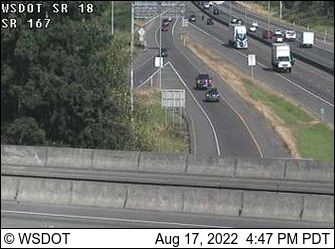 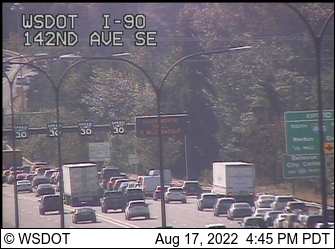 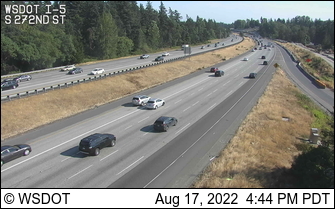 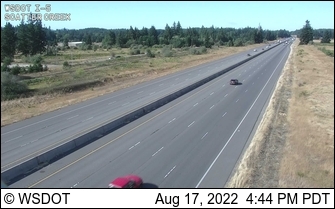 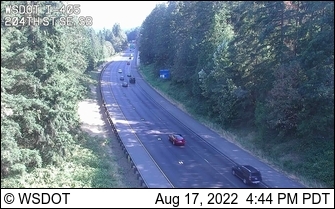 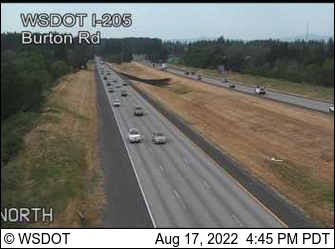 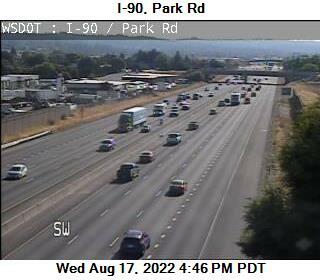 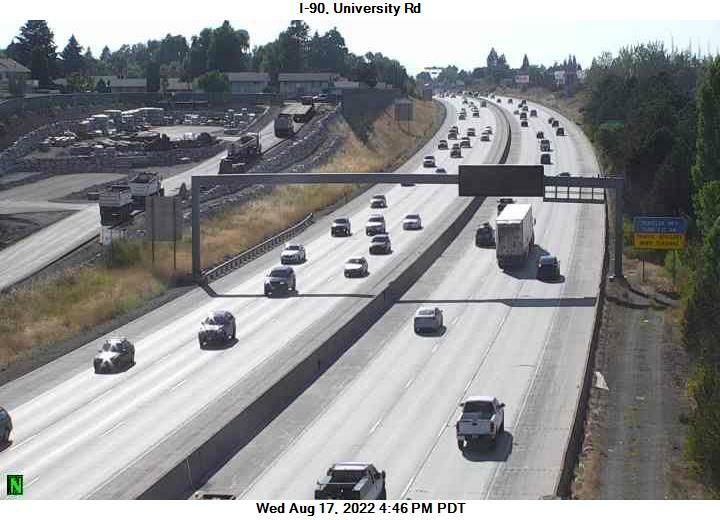 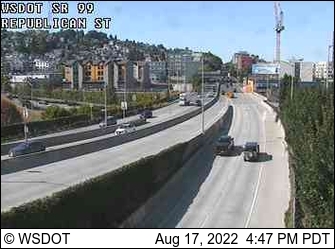 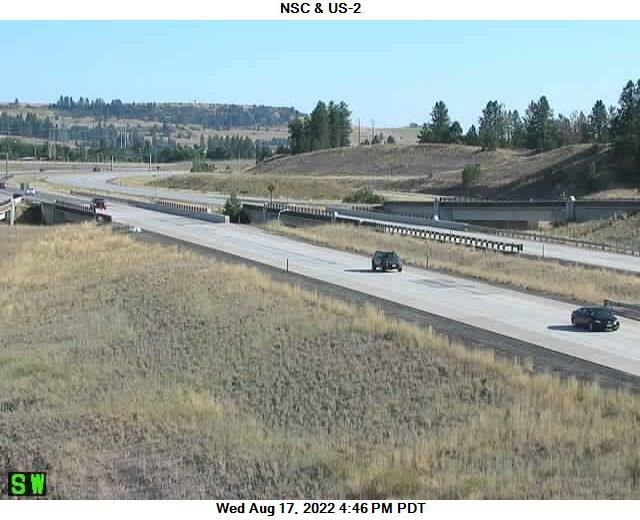 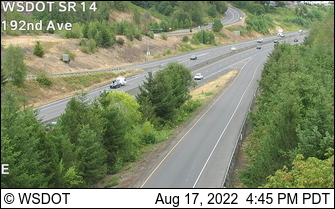 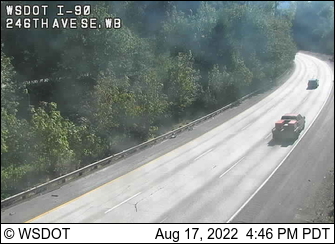 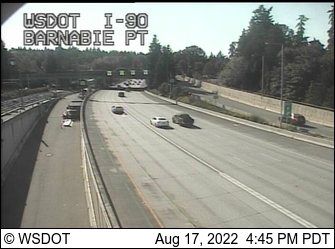 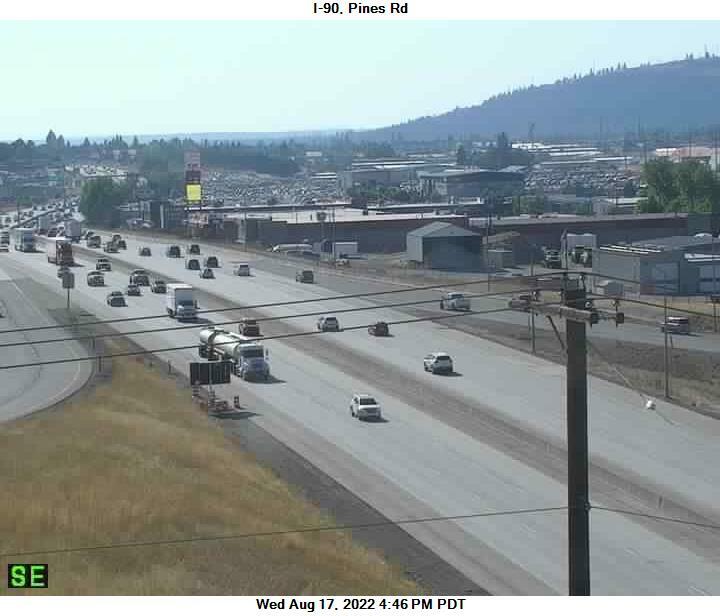 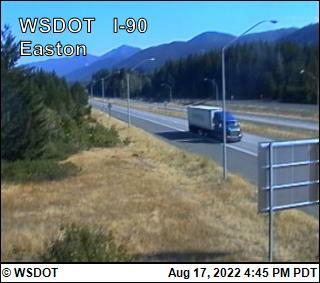 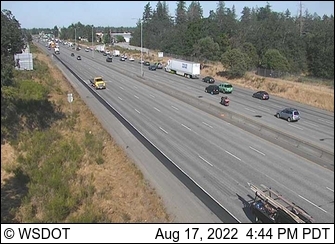 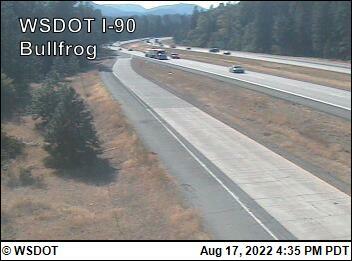 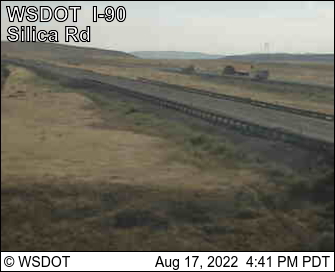 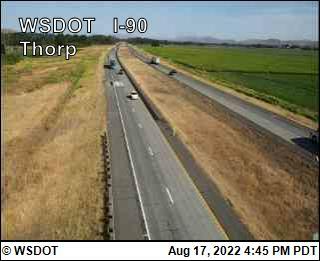 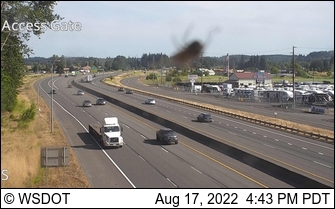 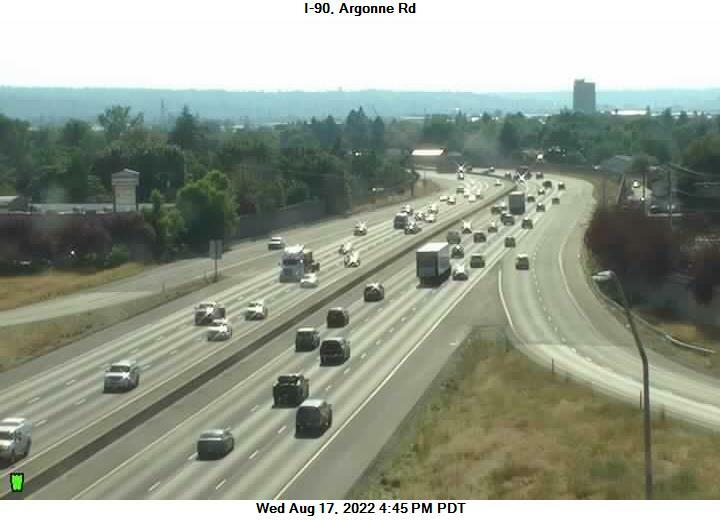 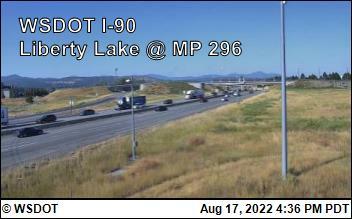 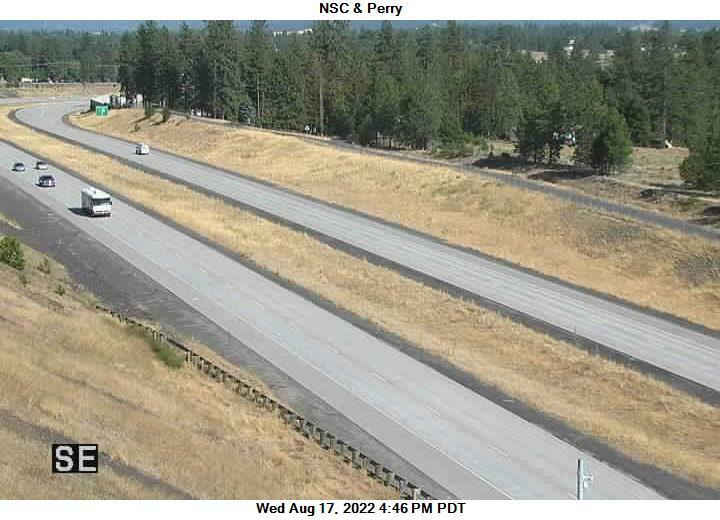 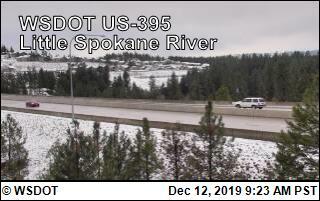 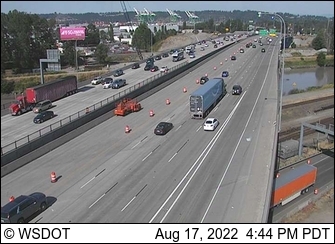 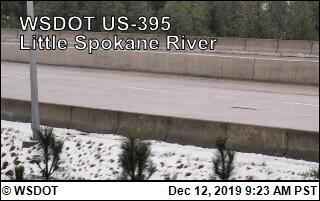 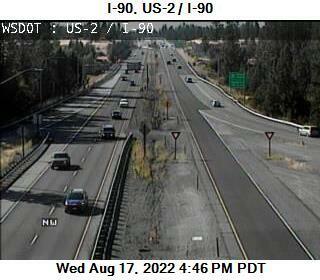 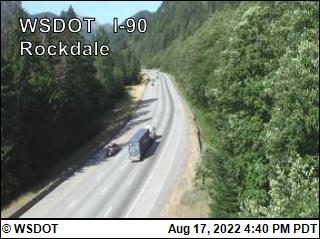 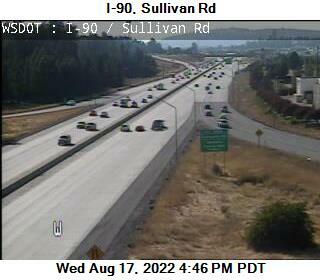 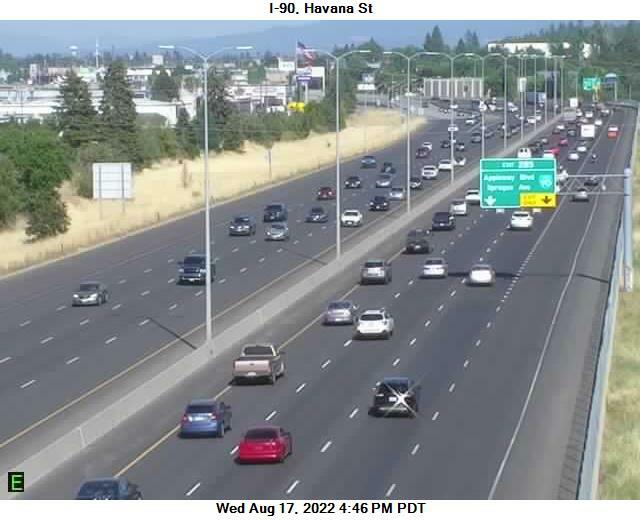 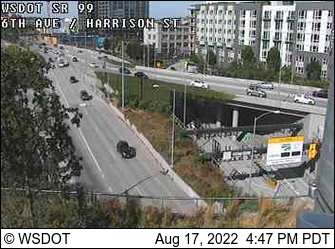 I-90 at MP 274: Thomas Mallen Rd. 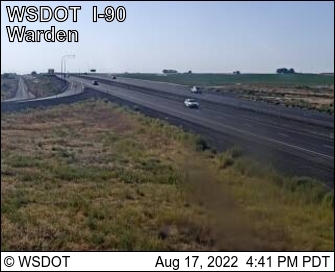 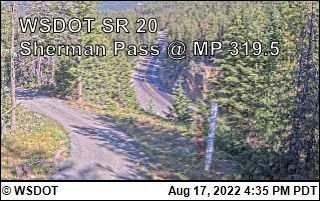 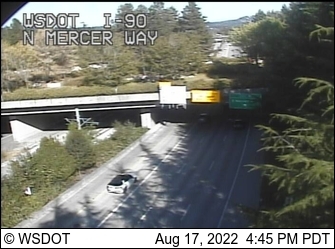 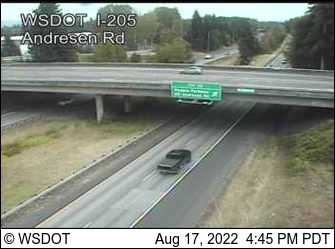 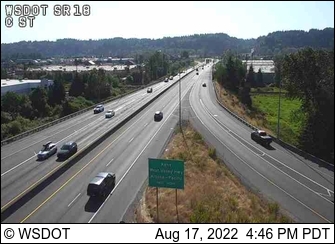 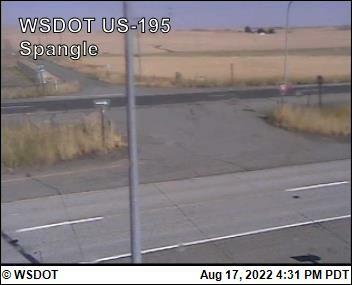 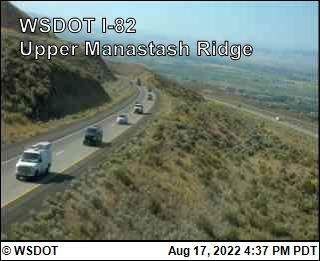 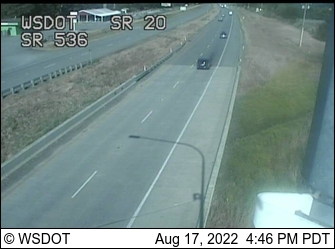 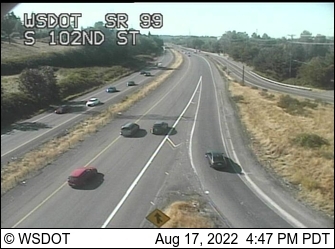 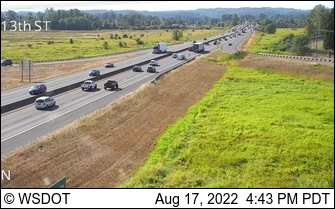 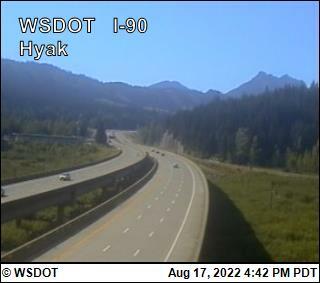 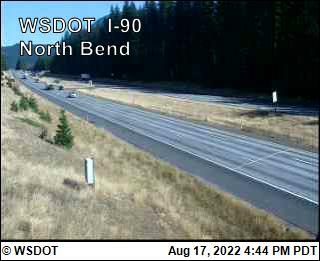 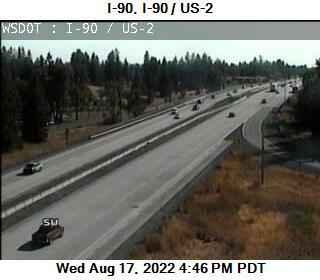 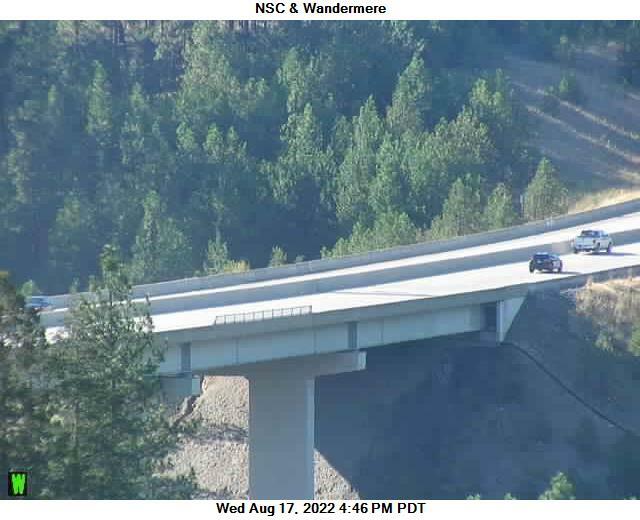 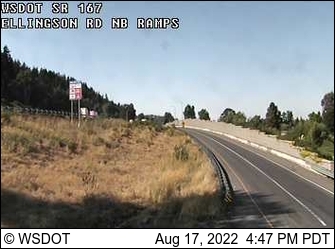 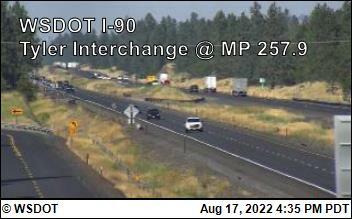 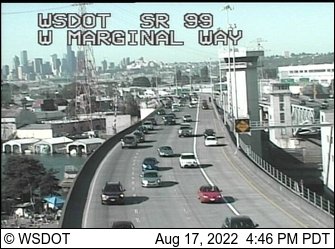 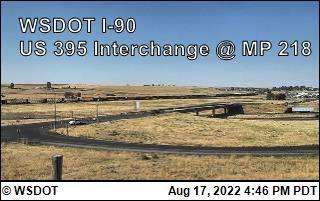 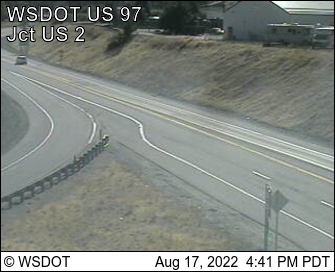 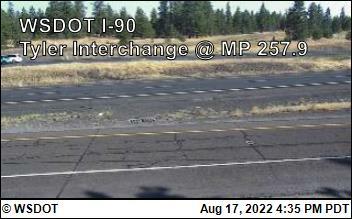 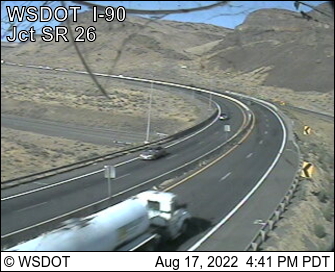 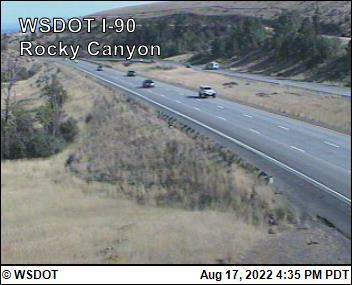 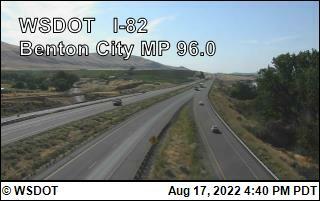 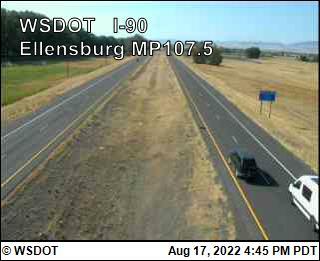 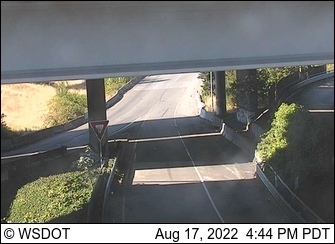 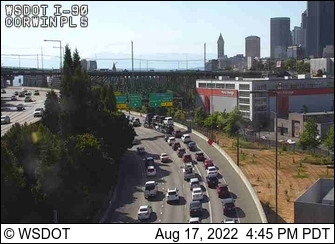 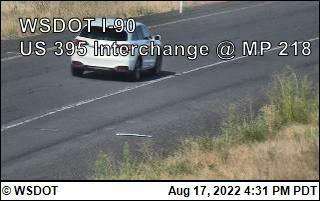 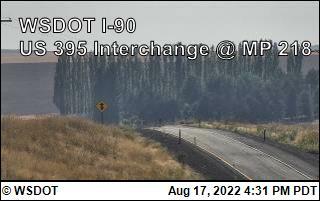 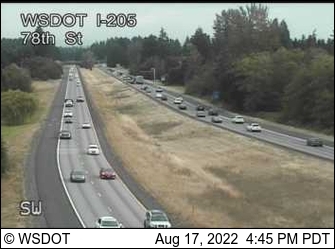 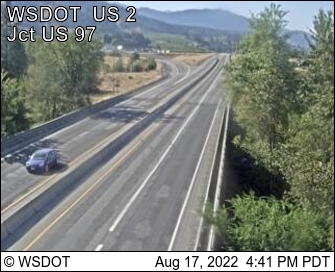 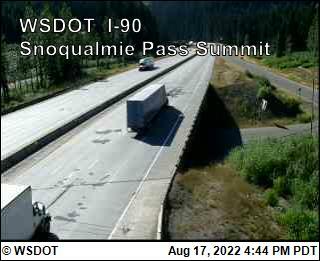 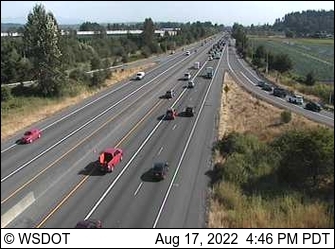 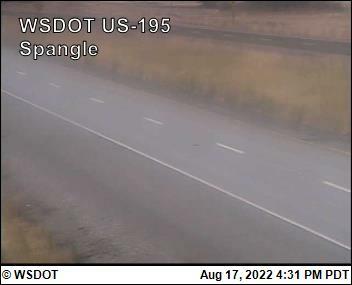 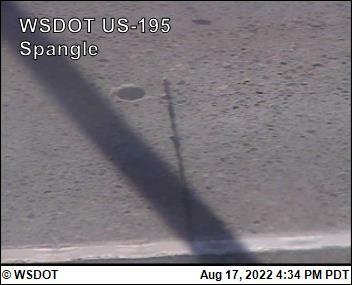 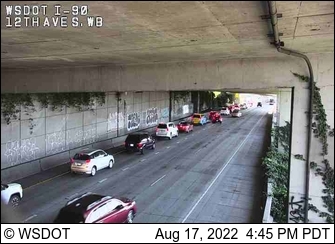 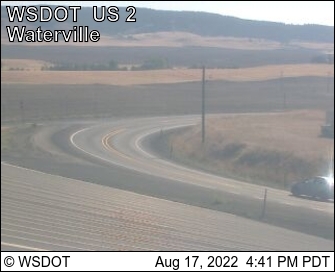 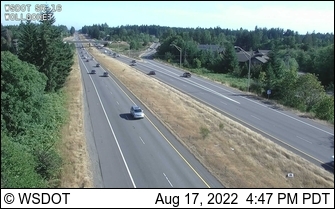 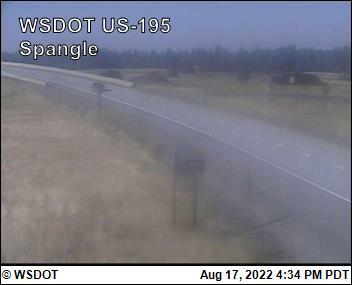 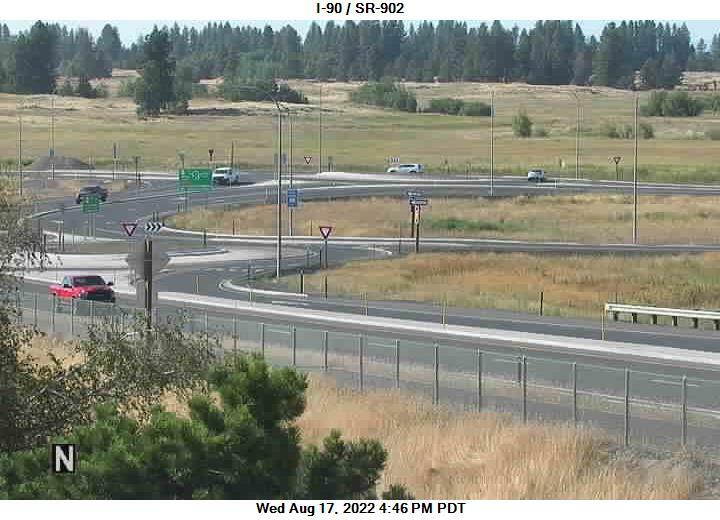 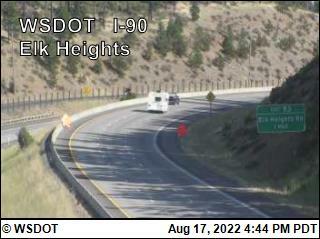 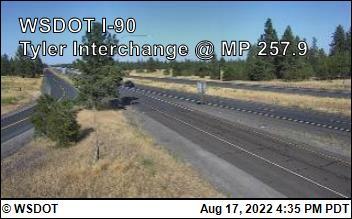 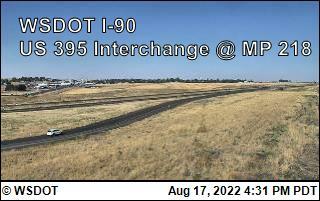 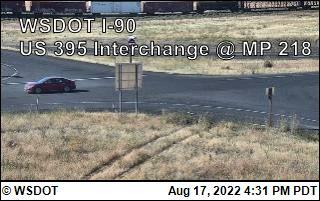 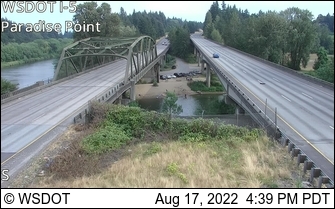 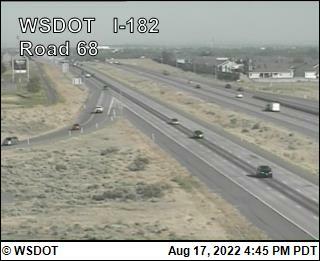 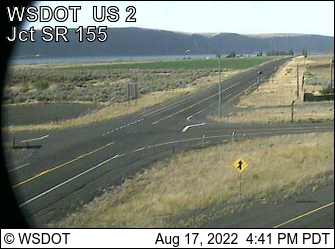 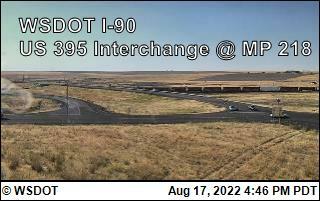 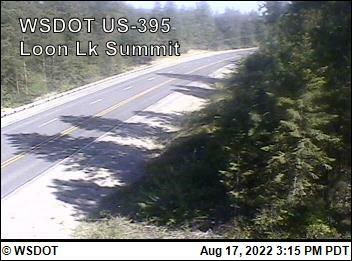 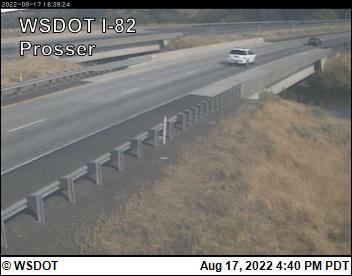 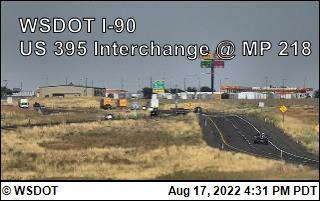 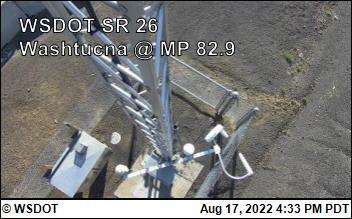 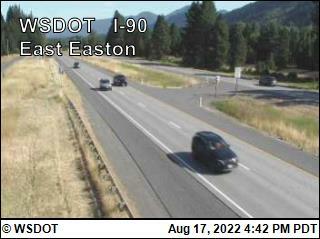 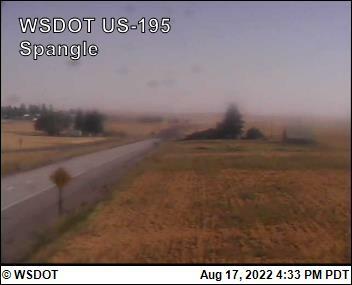 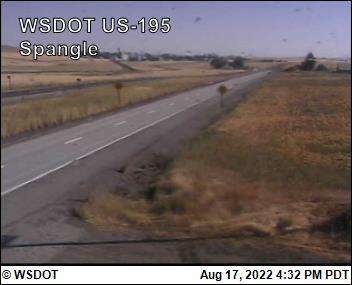 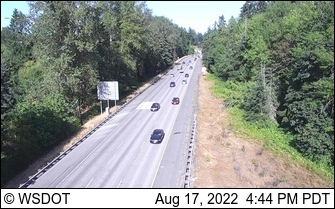 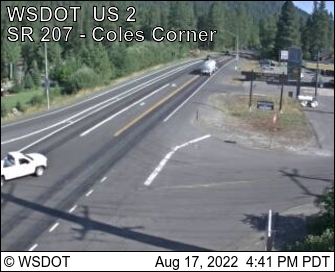 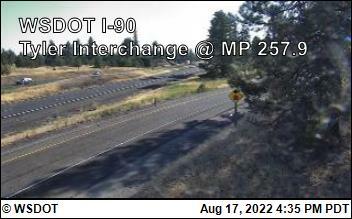 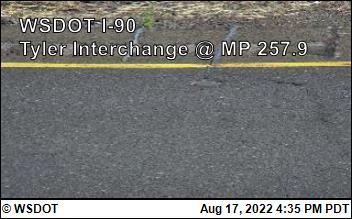 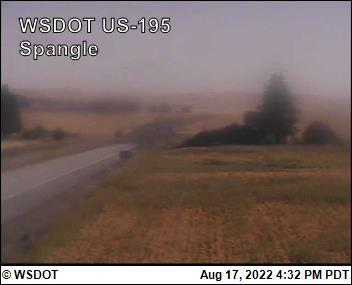 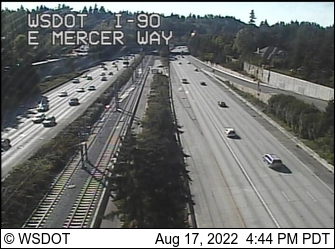 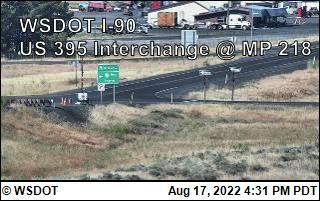 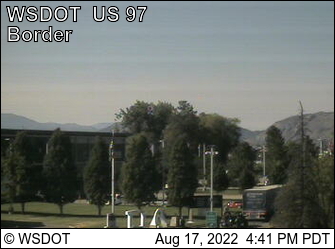 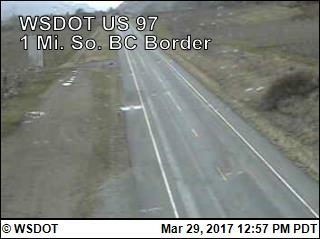 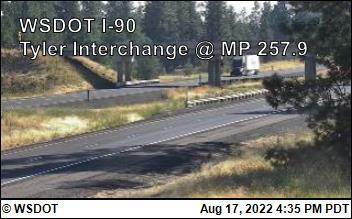 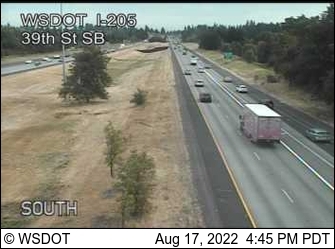 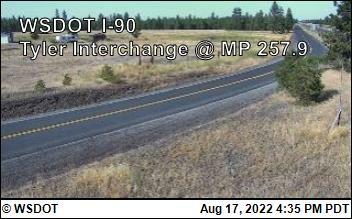 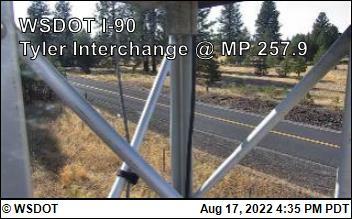 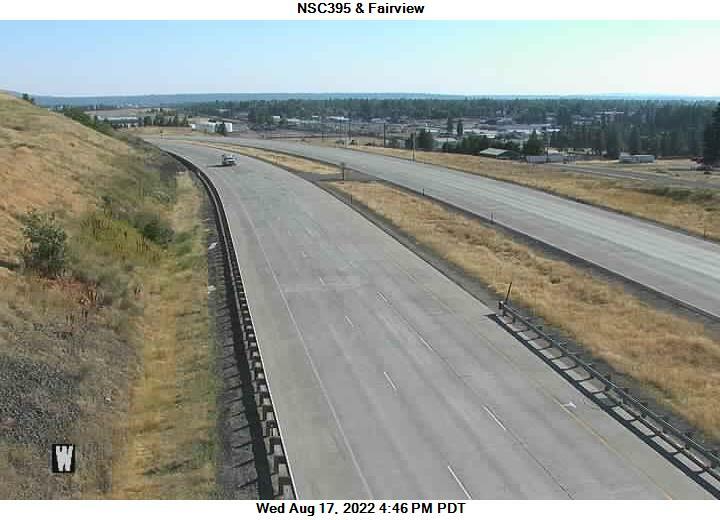 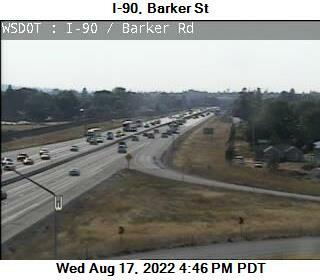 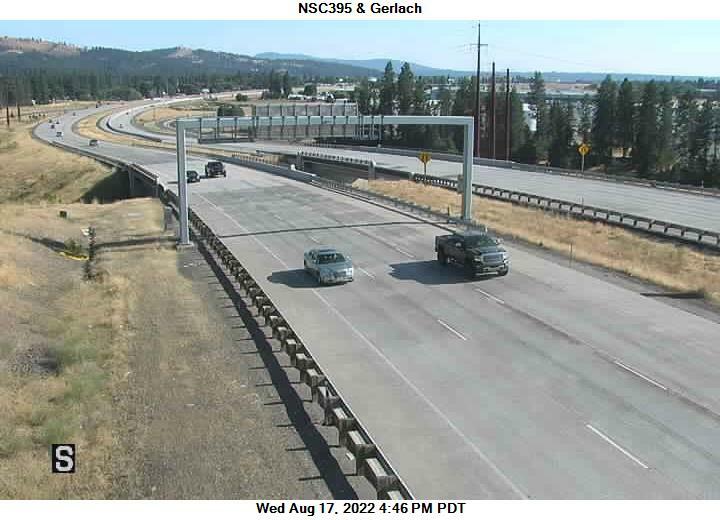 I-90 at MP 276.2: Geiger Rd. 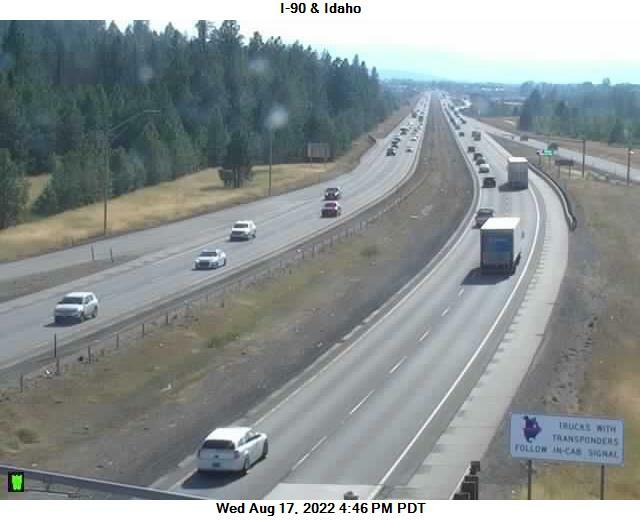 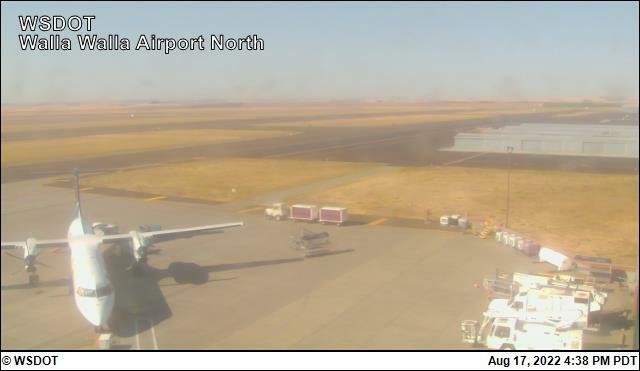 Offers travel between Ellensburg, Yakima, Sunnyside and the Tri Cities (Richland, Kennewick, and Pasco) into Hermiston in Oregon. 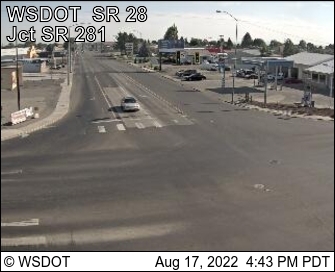 I-182 is the primary route from I-82 into the Cities of Richland and Pasco of the Tri-Cities. 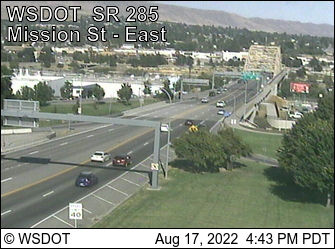 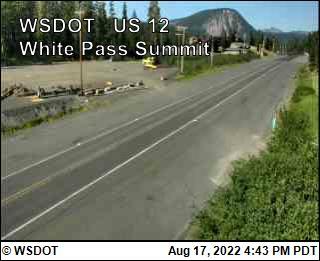 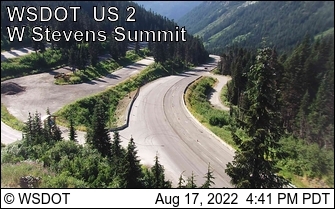 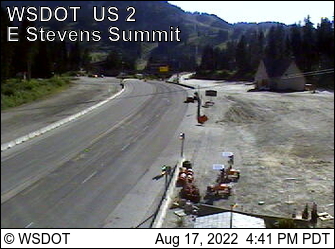 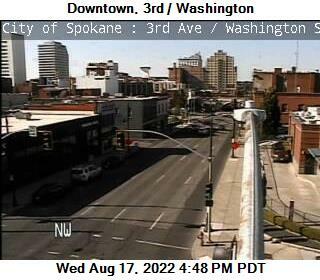 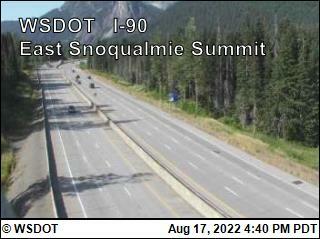 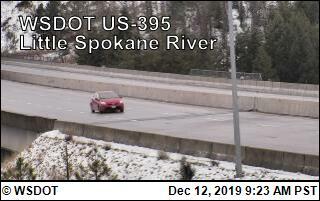 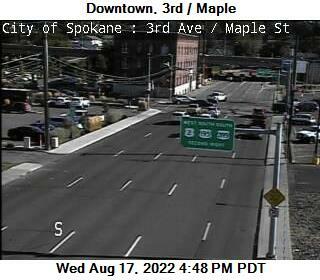 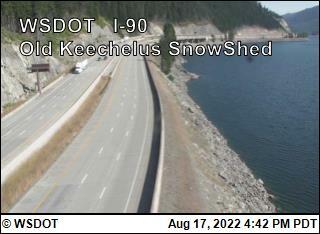 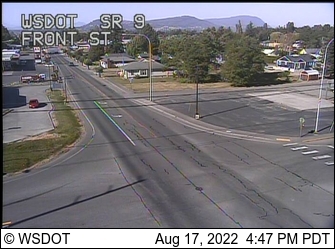 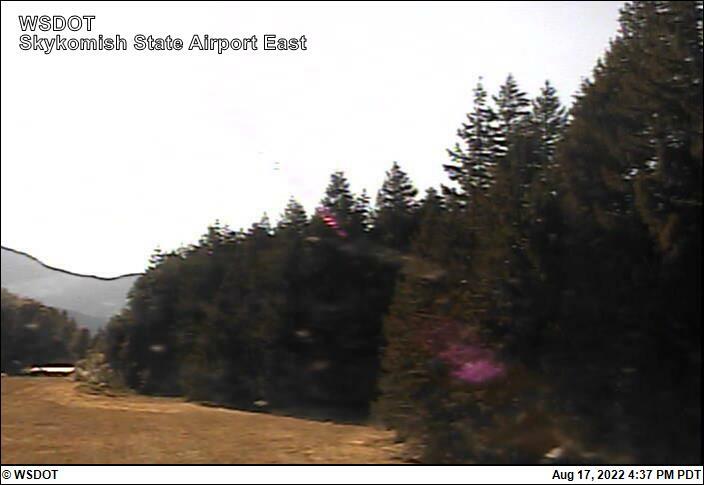 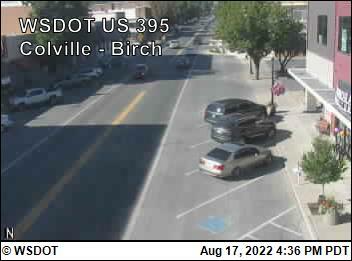 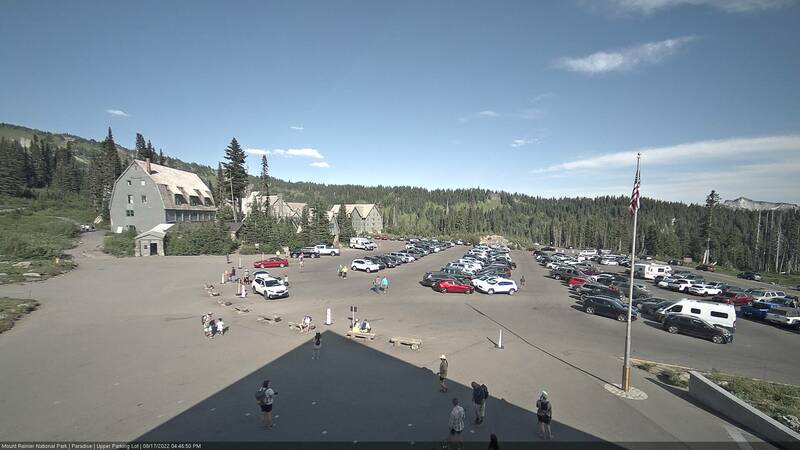 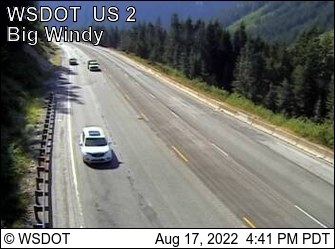 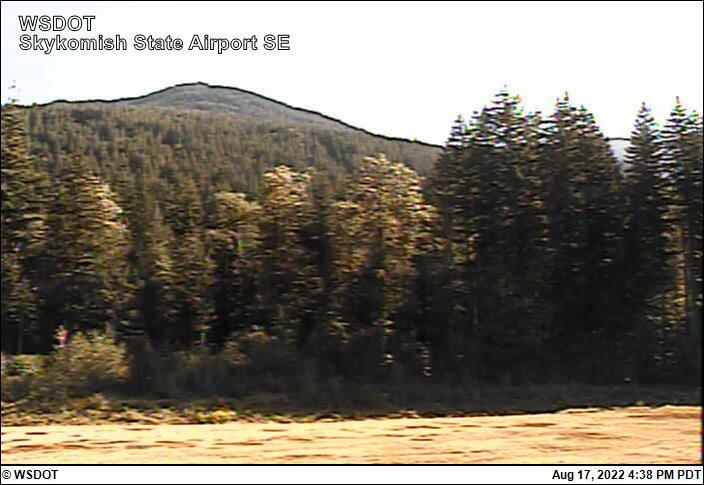 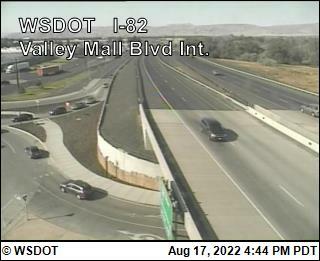 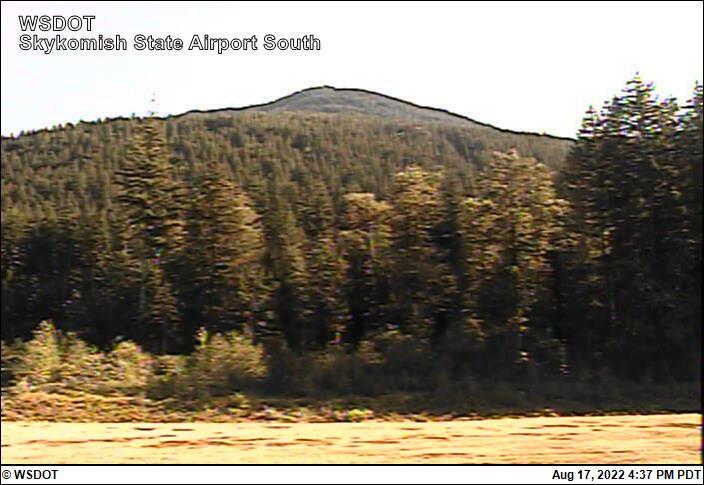 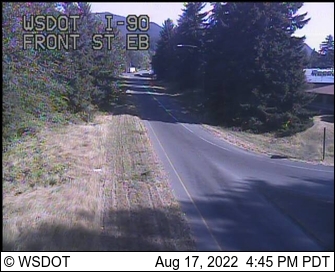 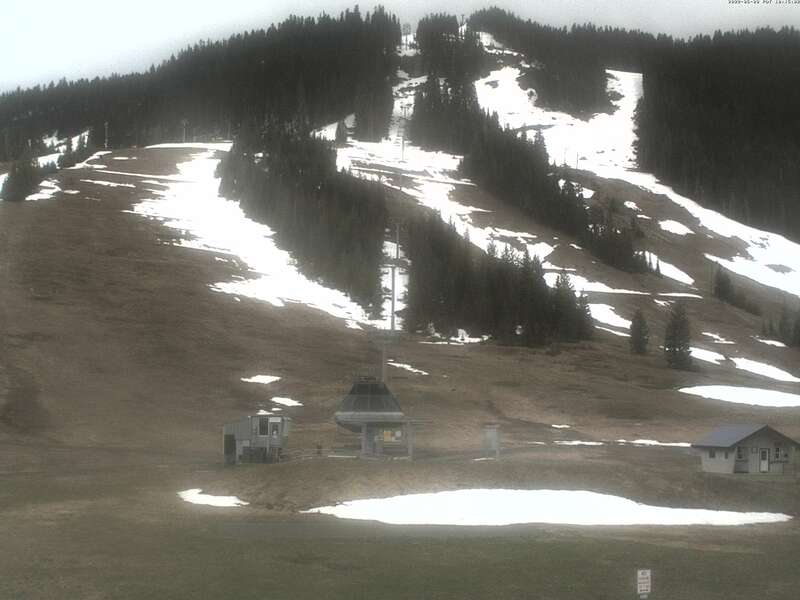 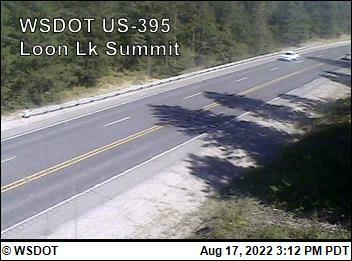 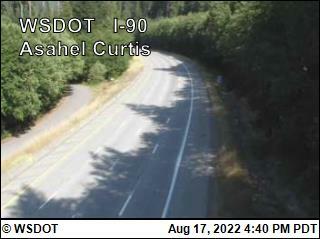 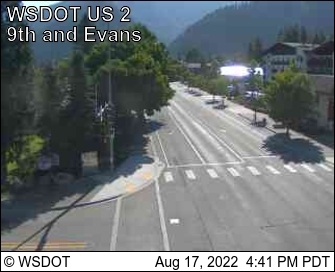 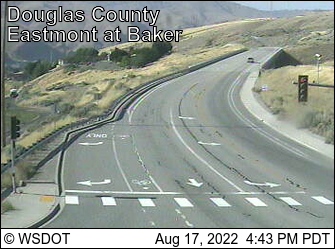 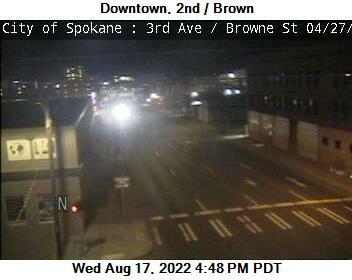 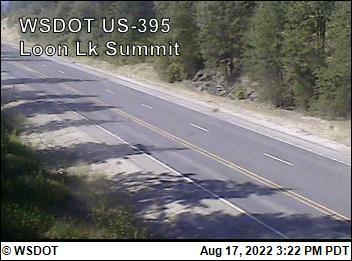 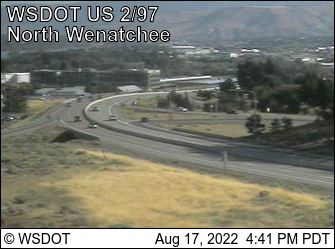 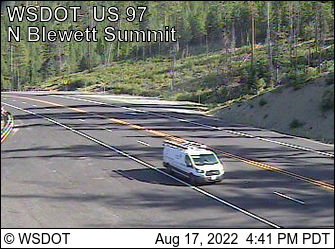 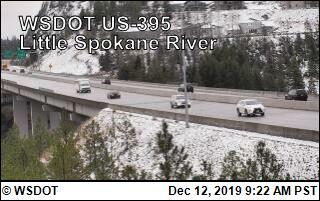 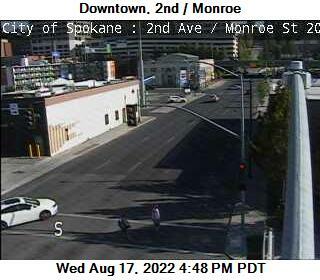 Travels between Everett and Spokane over Stevens Pass via Monroe, Wenatchee, Coulee City and Davenport. 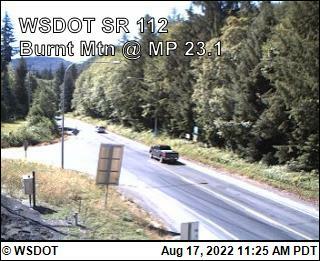 US 2 at MP 127.8: US 97 I/C E. End Odabashian Br. 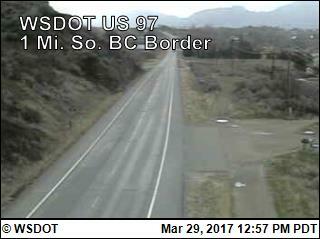 An east-west cross-state route that travels through many rural areas. 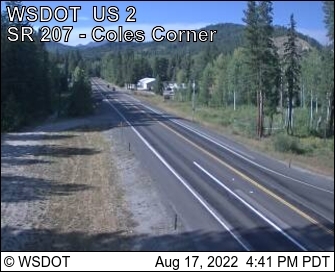 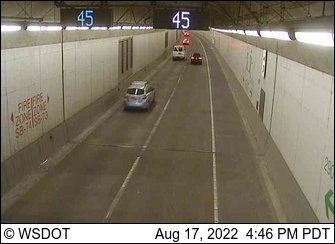 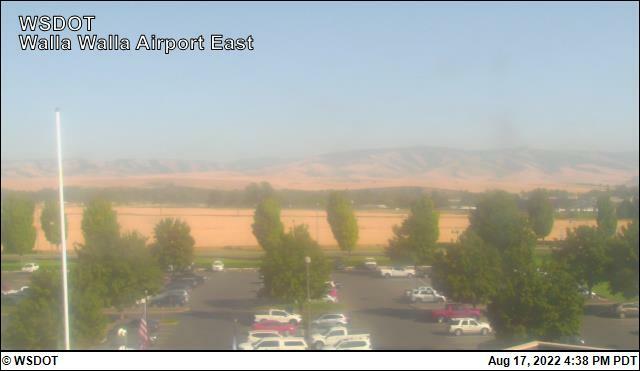 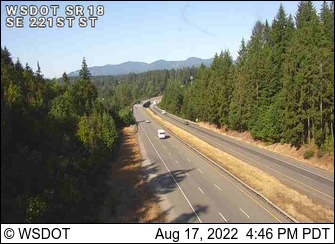 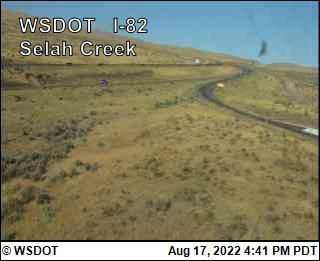 From the west coast at Aberdeen travel southeast to Chehalis and Mossyrock, over White Pass through Yakima, the Tri Cities and Walla Walla then east to Clarkston and into Idaho. 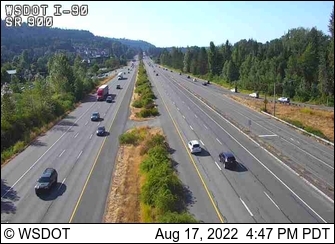 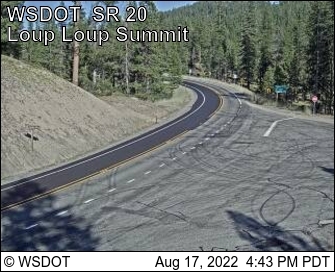 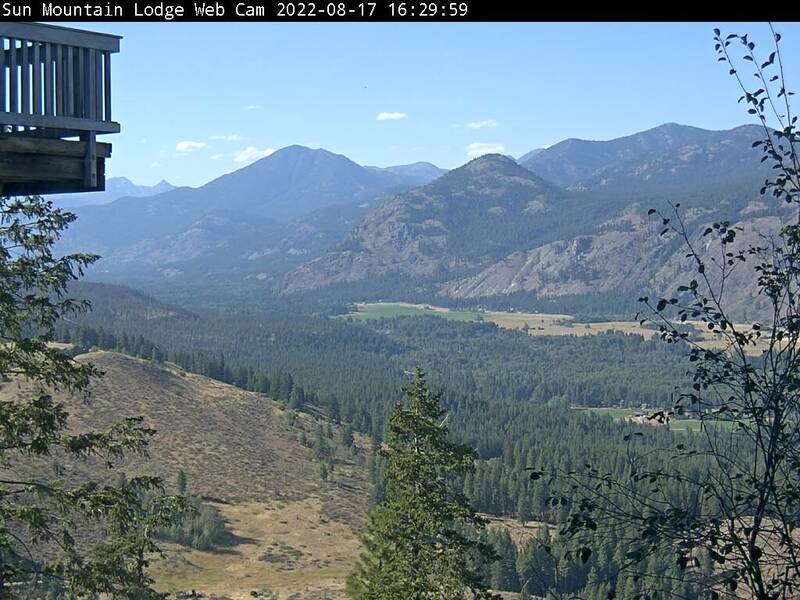 A north-south route through the center of the state including Chelan, Wenatchee, Leavenworth, Blewett Pass, Ellensburg, Yakima, Toppenish and Goldendale. 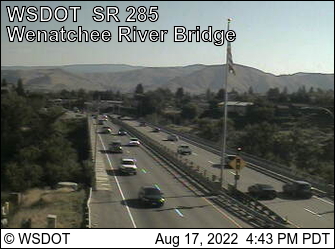 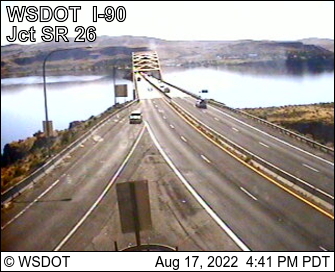 Runs the west side of the Columbia River between Chelan and Wenatchee. 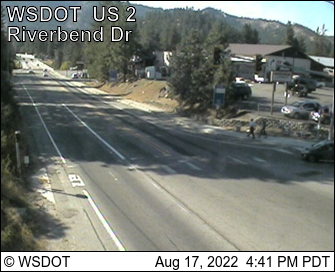 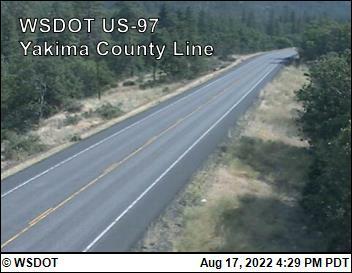 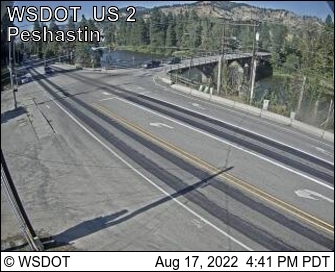 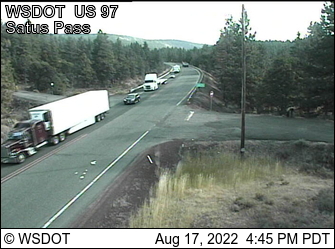 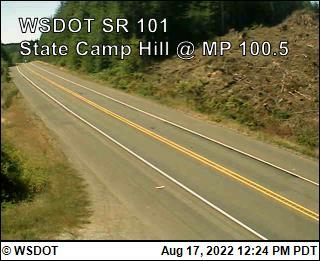 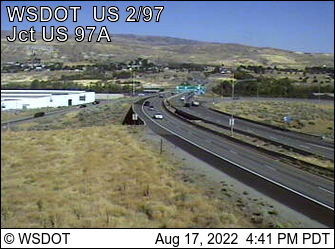 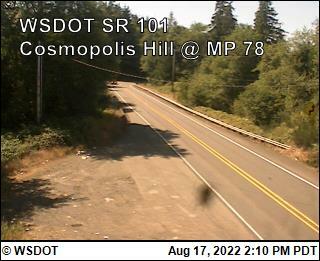 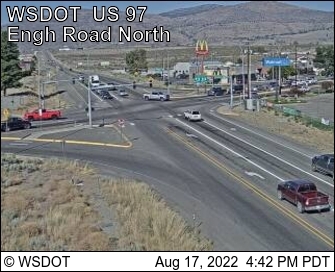 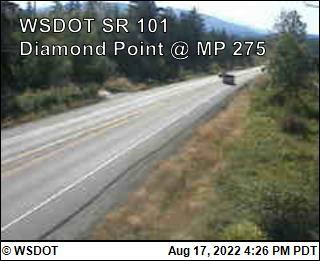 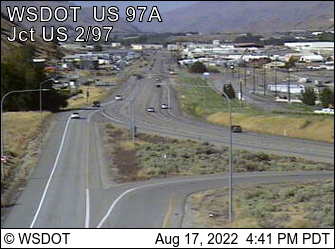 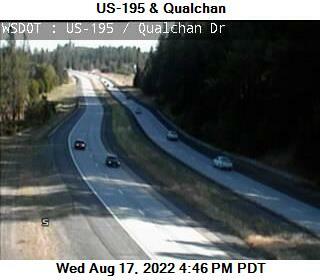 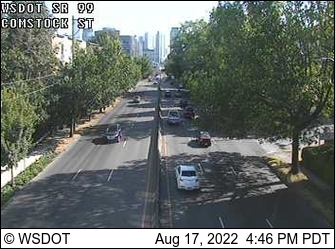 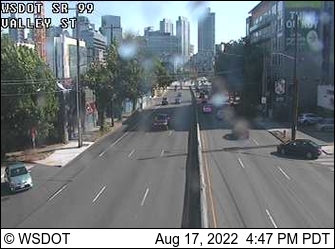 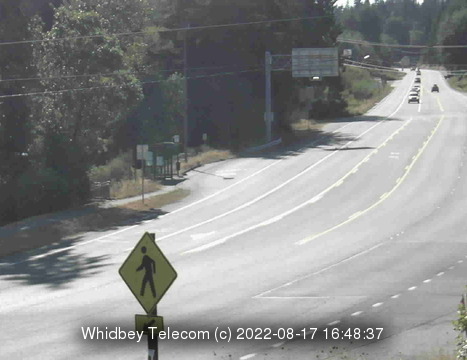 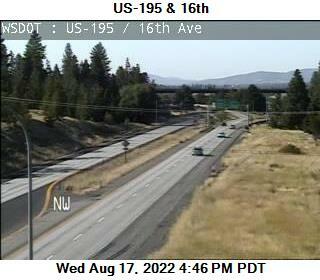 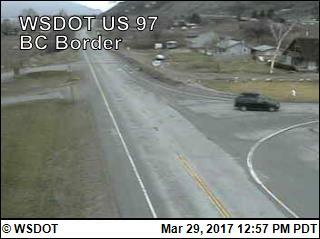 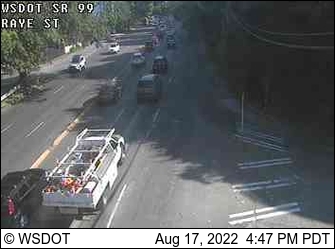 US 97A at MP 199.83: W. End Odabashian Br. 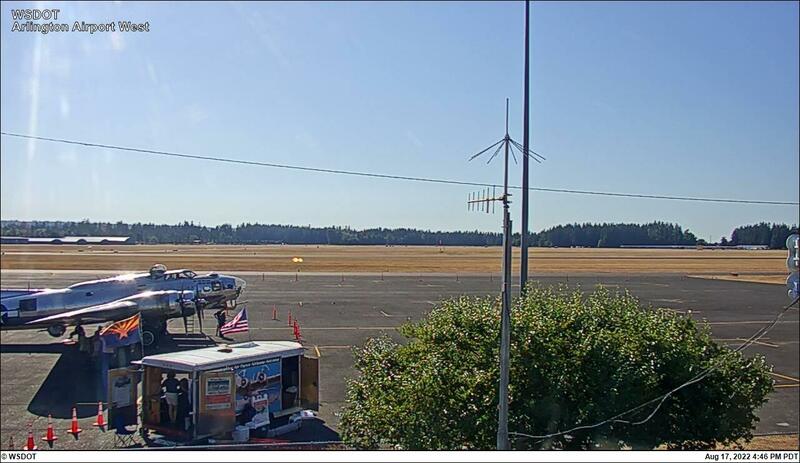 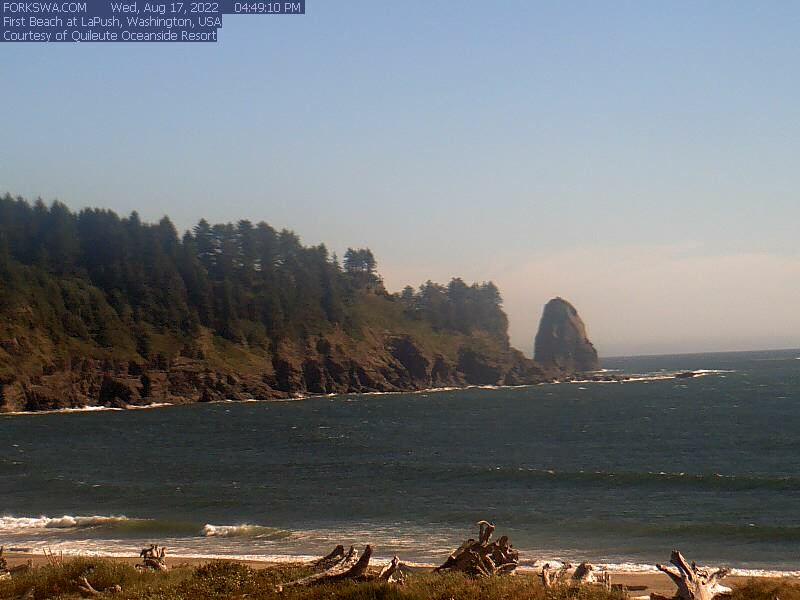 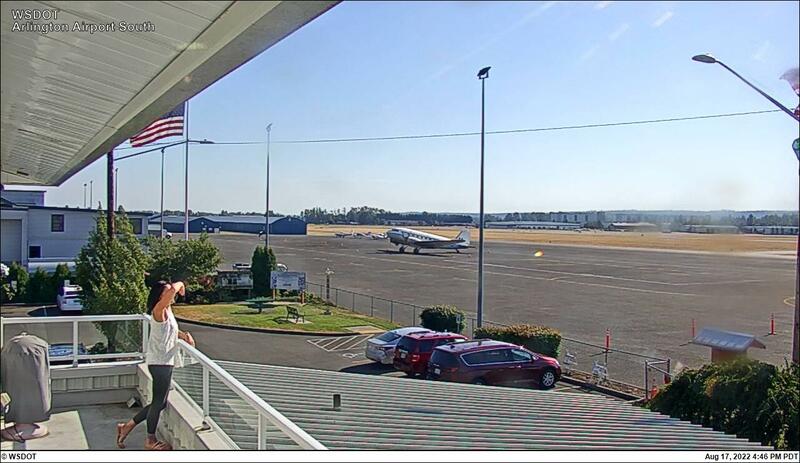 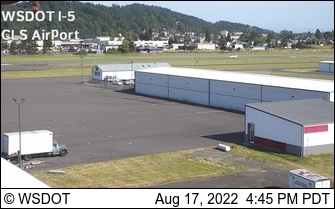 Begins at the Columbia across from Astoria, OR and continues north along the coast then loops around the edge of the Olympic Peninsula in NW Washington and ends in Olympia. 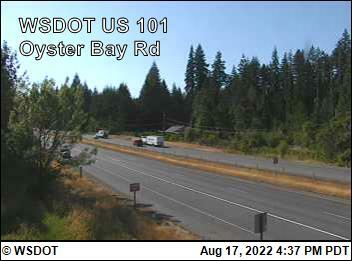 US 101 at MP 359: Oyster Bay Rd. 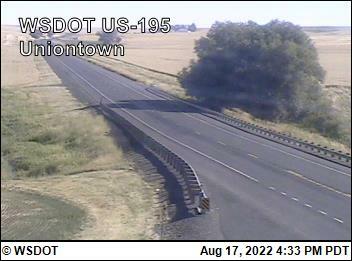 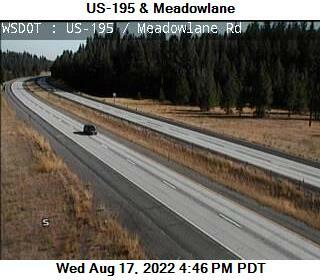 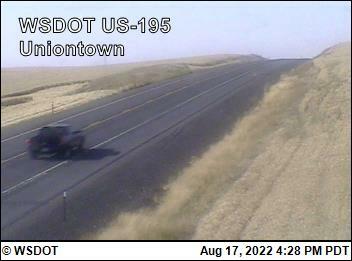 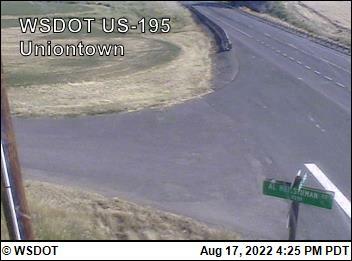 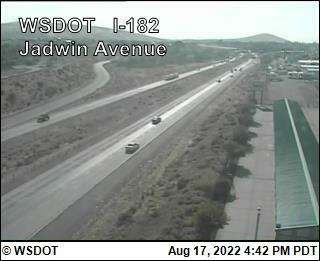 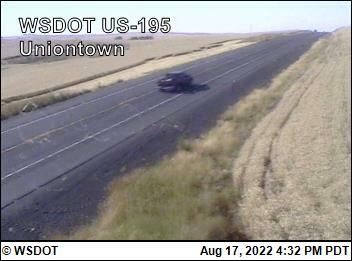 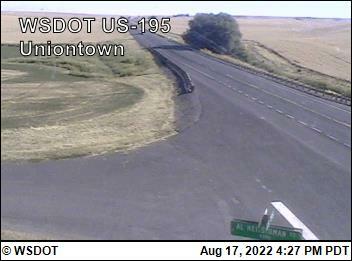 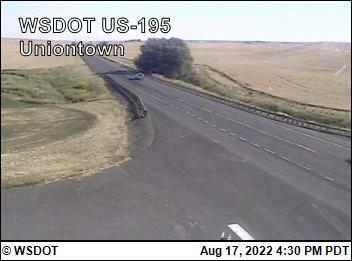 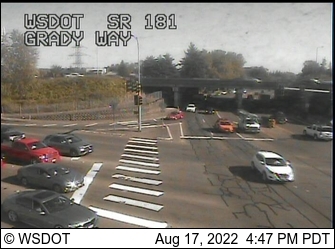 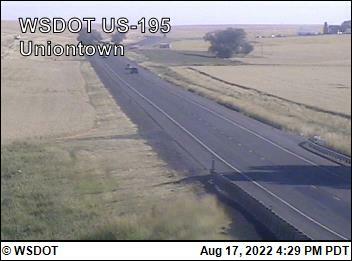 US 195 at MP 92.3: Meadowlane Rd. 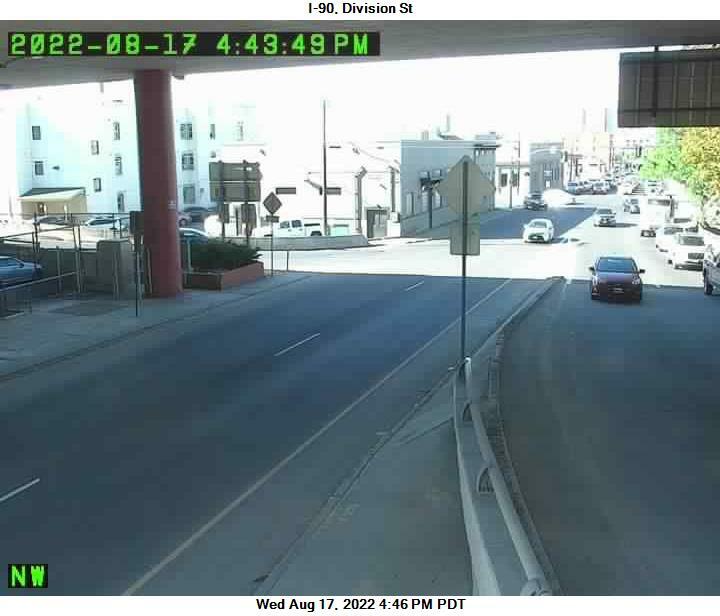 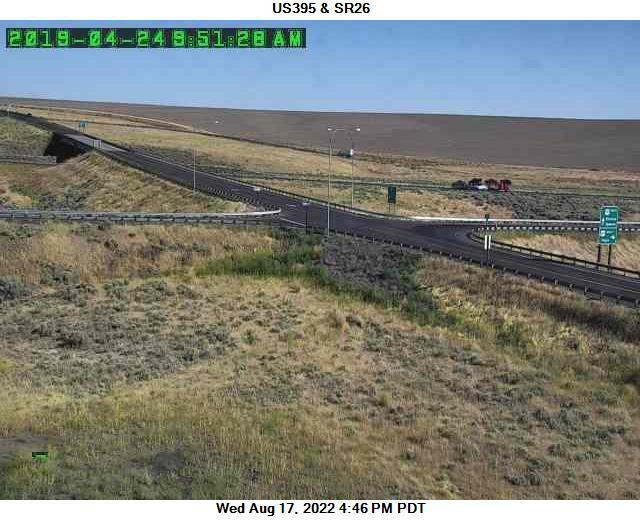 A north-south route which travels from the Tri-Cities to the Canadian border via Ritzville, Spokane, Kettle Falls and Laurier. 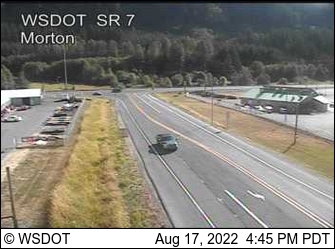 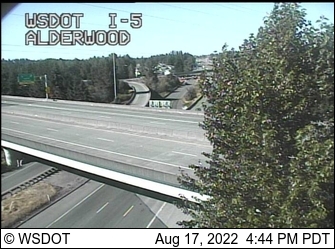 Starts near Shelton, heads northeast into Bremerton and Silverdale and ends at the Hood Canal Bridge. 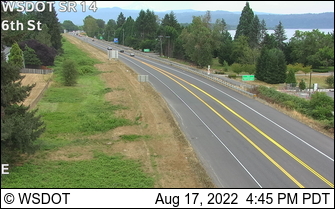 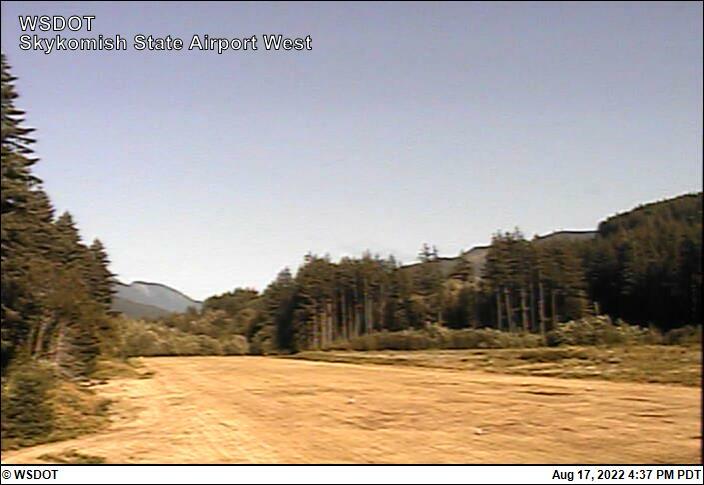 Travels east-west between Interstate 5 at Kelso and US 101 at Willapa Bay near the Pacific Ocean. 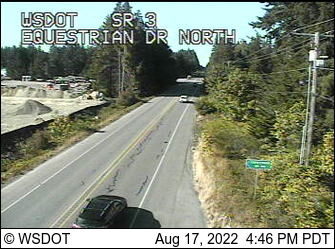 Connects Olympia, Elma and Montesano. 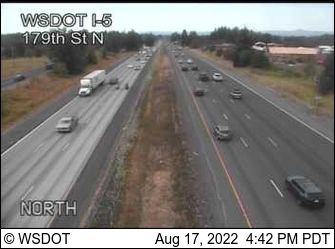 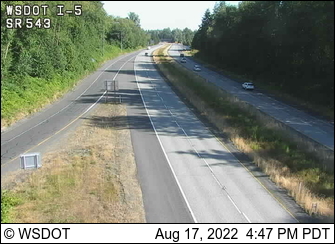 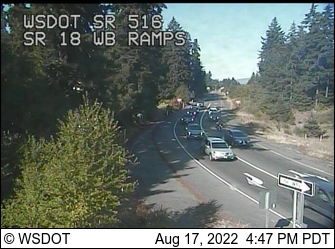 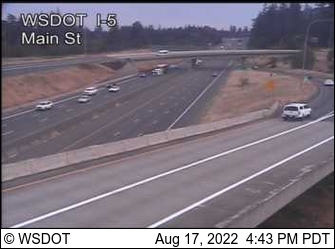 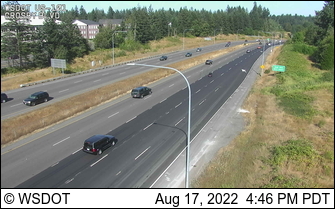 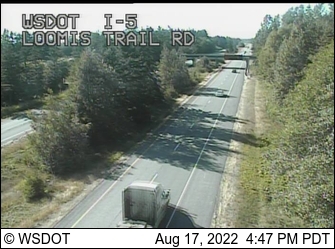 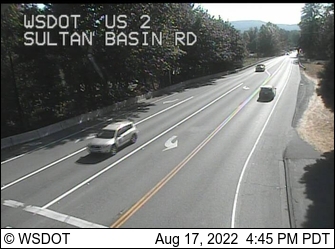 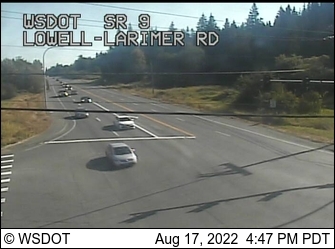 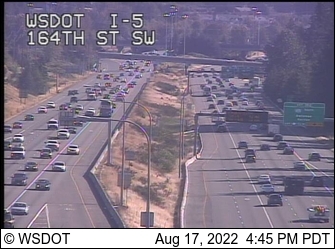 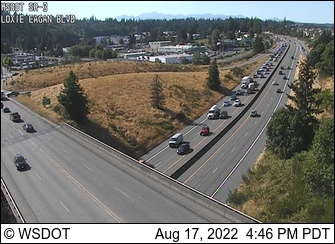 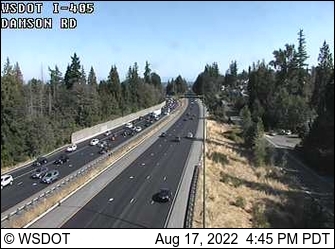 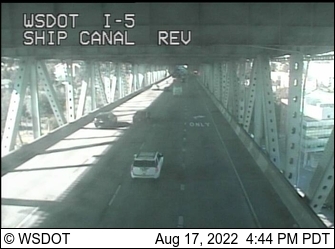 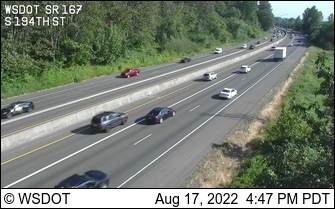 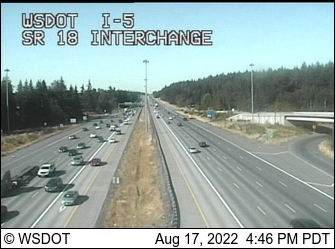 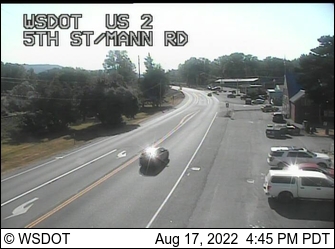 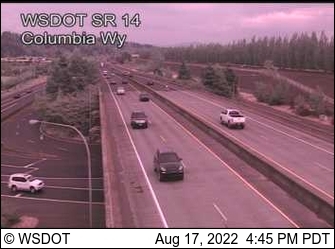 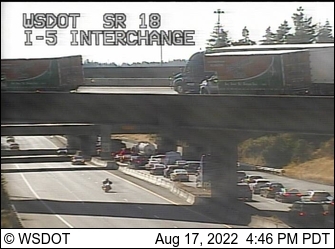 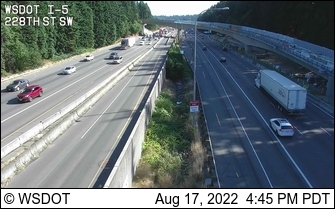 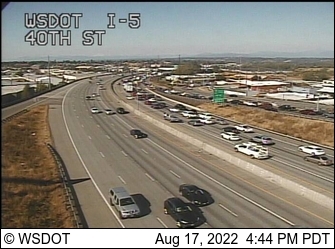 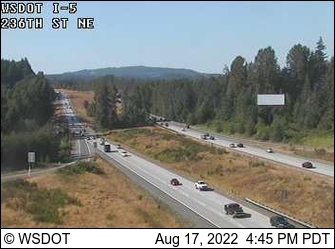 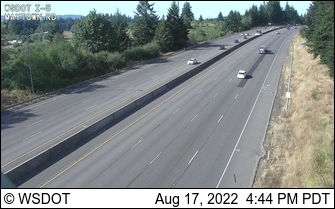 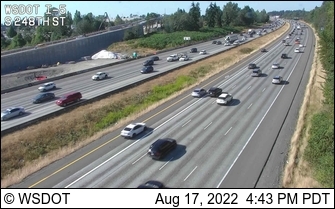 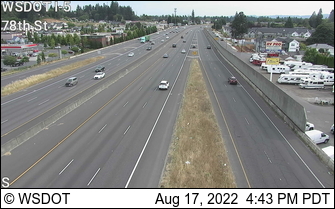 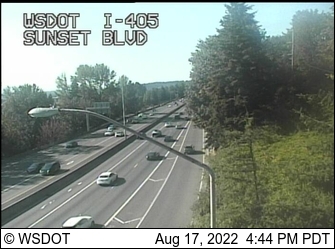 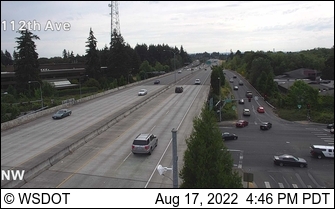 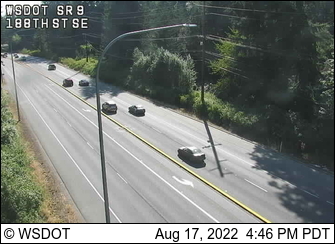 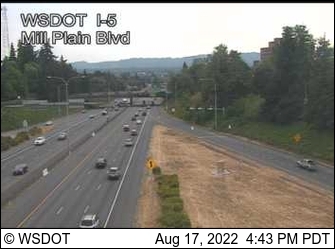 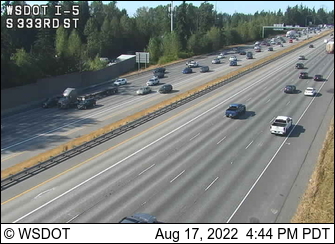 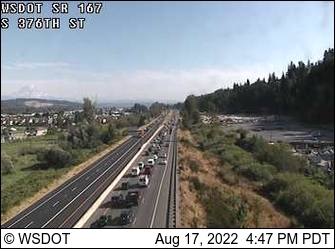 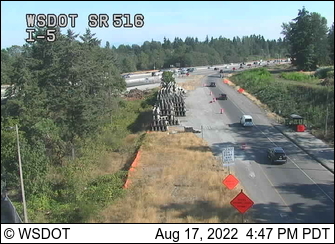 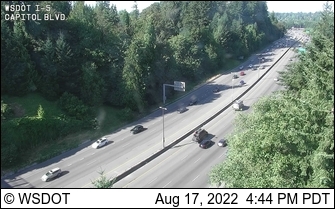 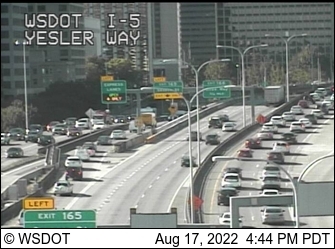 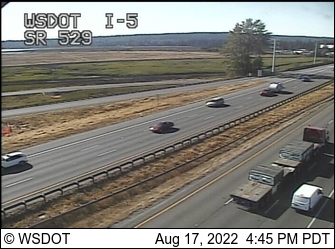 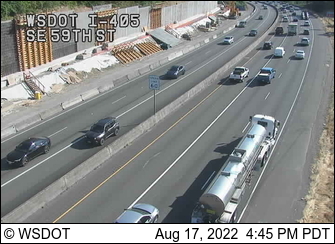 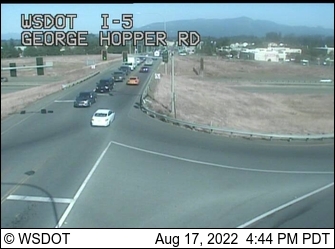 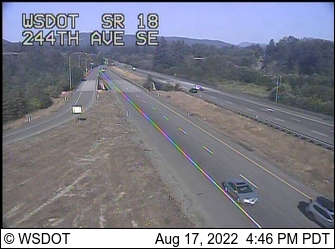 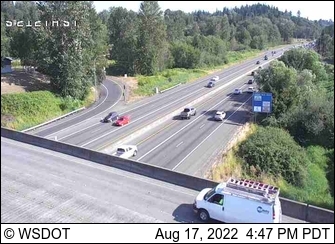 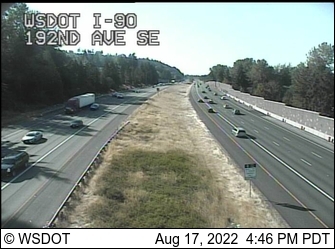 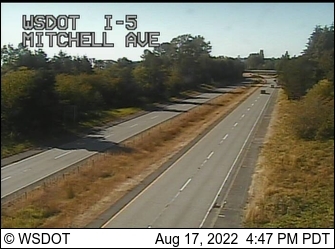 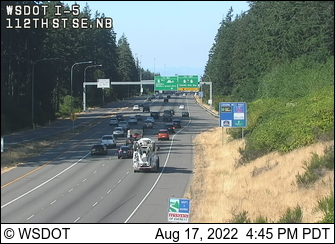 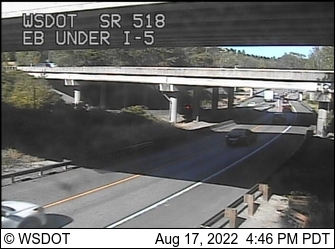 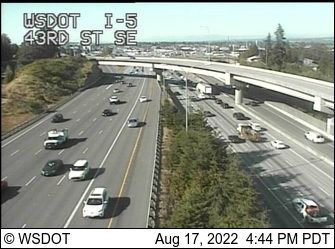 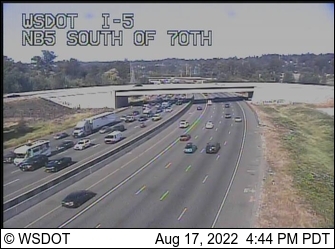 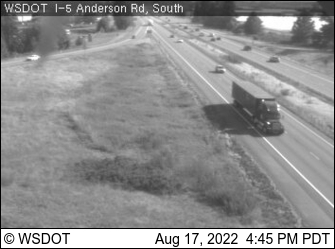 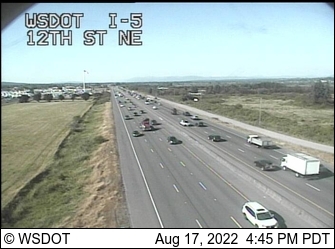 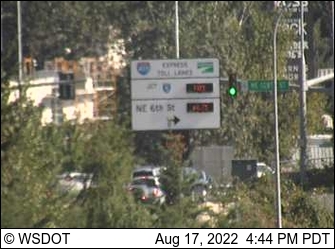 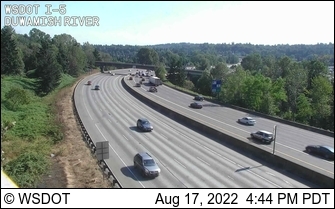 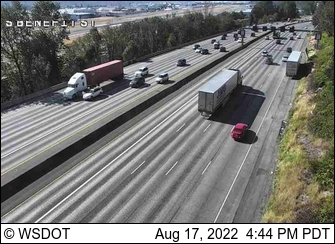 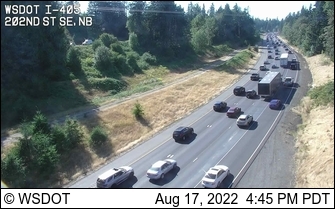 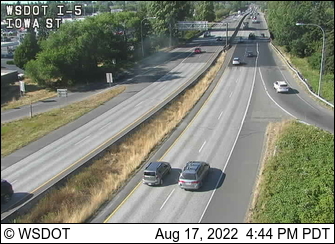 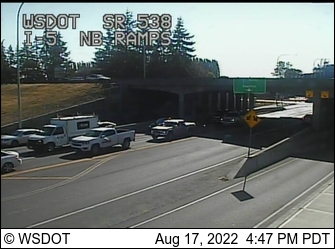 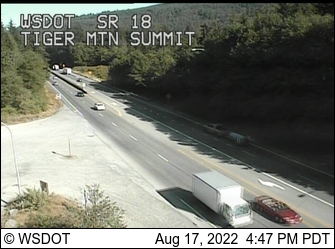 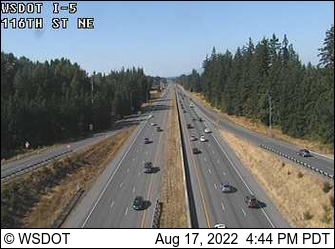 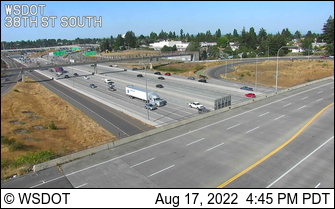 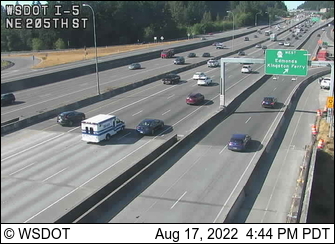 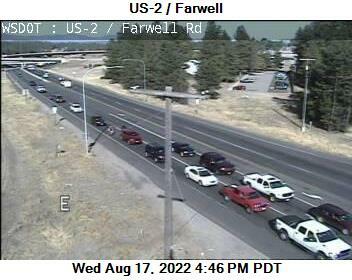 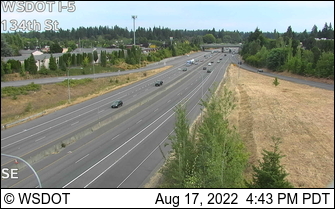 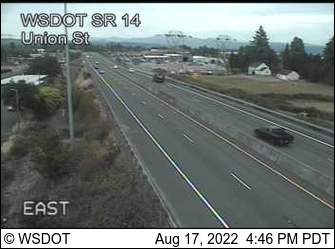 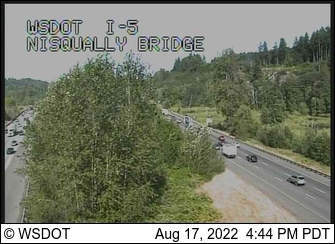 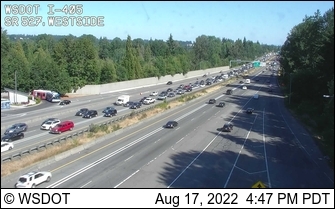 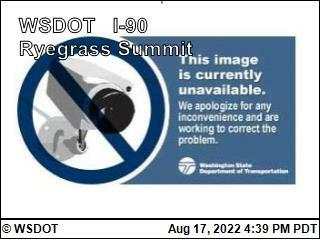 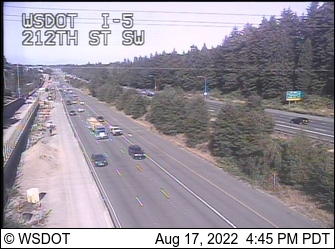 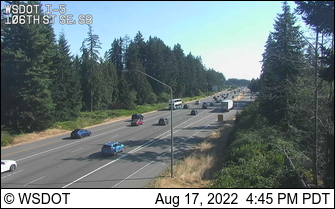 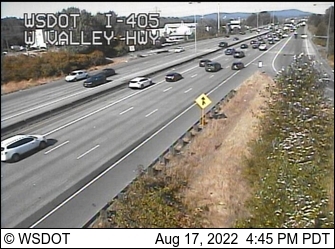 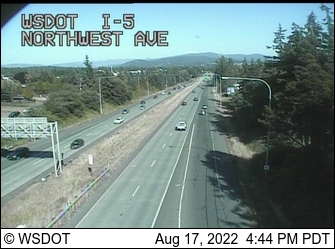 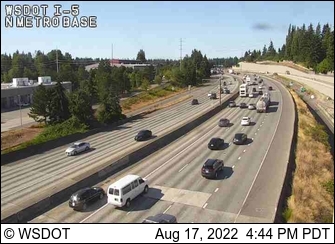 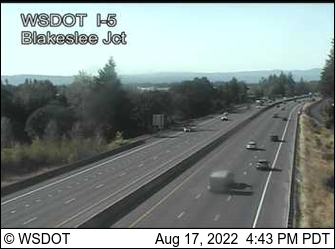 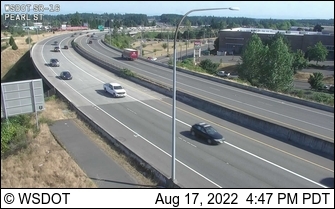 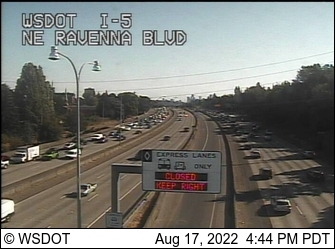 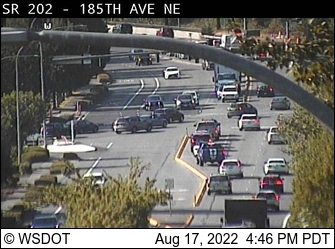 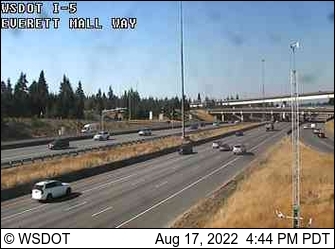 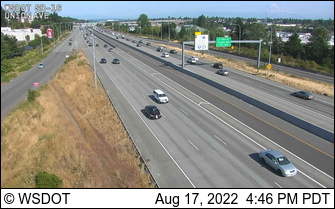 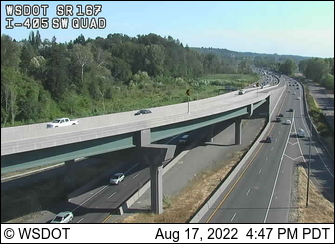 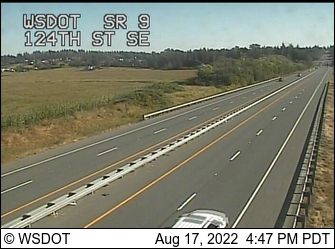 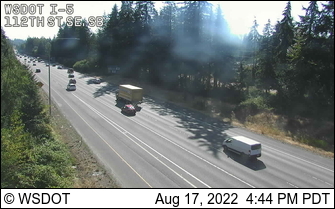 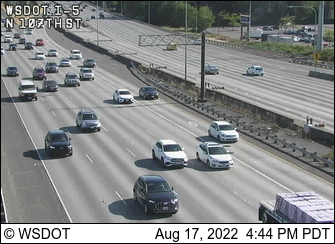 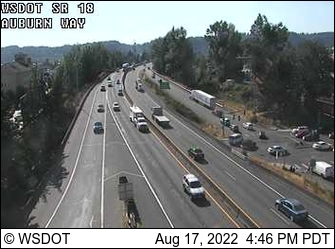 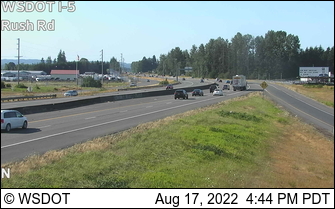 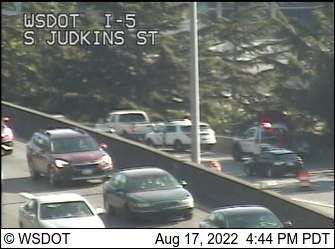 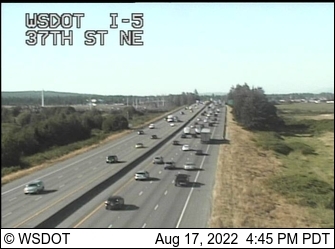 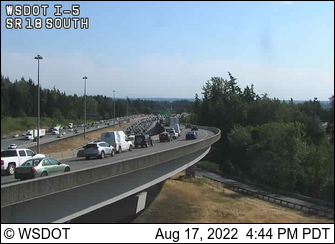 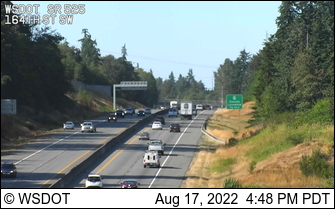 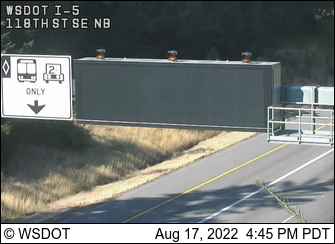 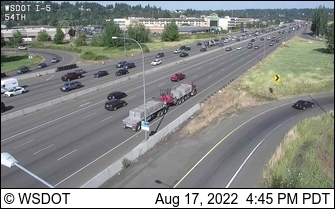 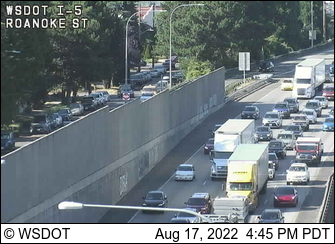 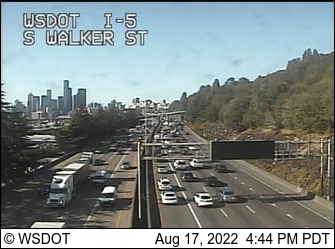 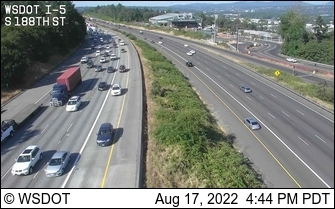 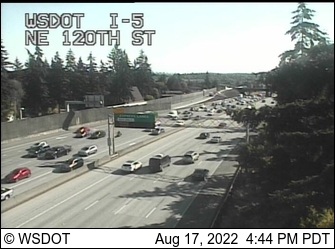 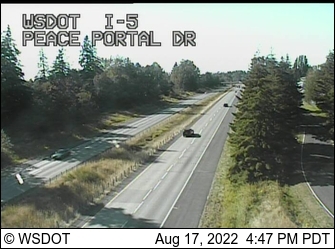 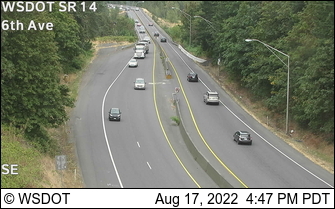 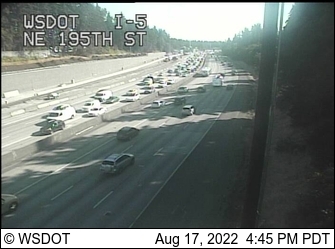 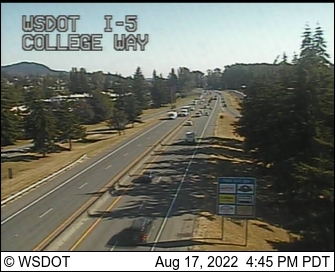 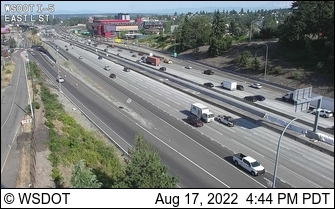 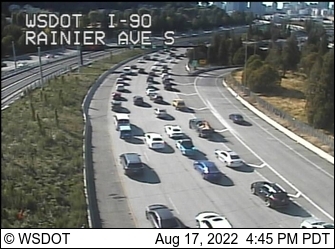 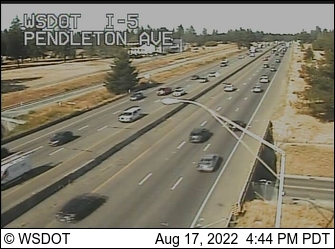 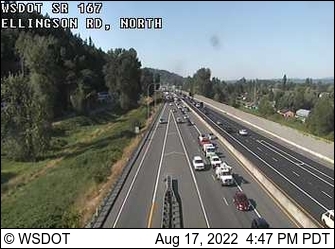 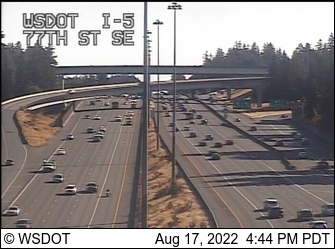 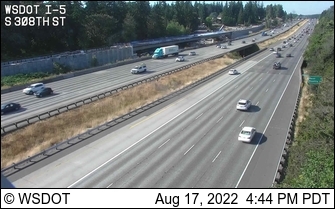 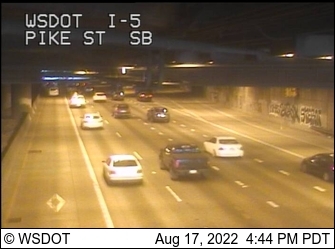 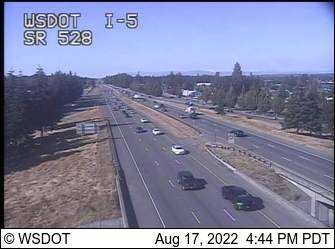 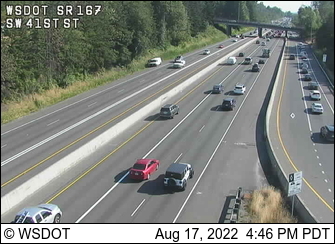 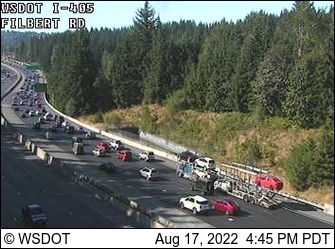 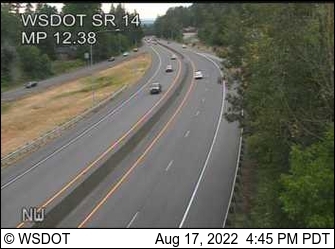 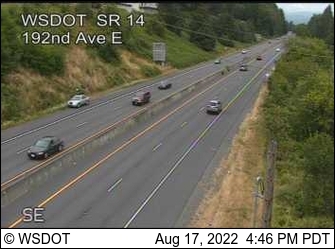 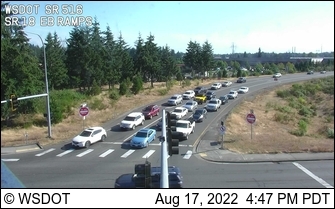 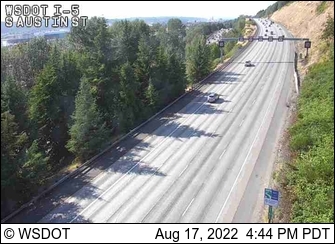 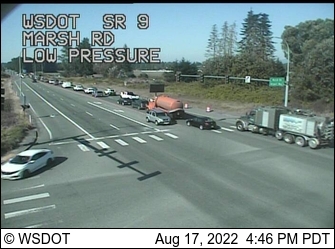 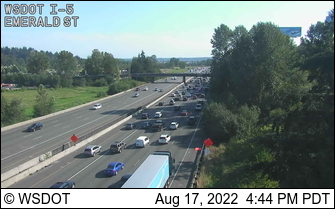 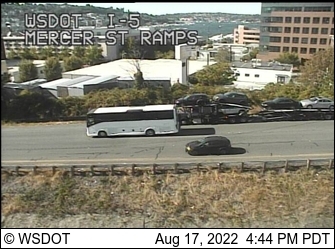 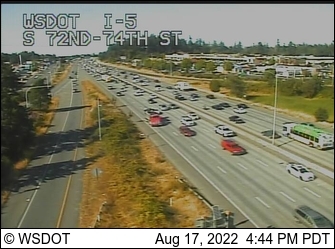 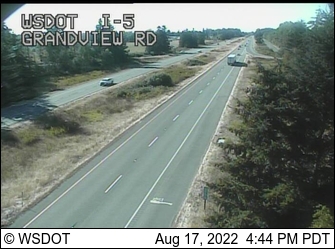 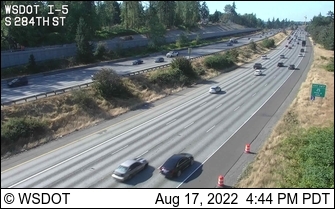 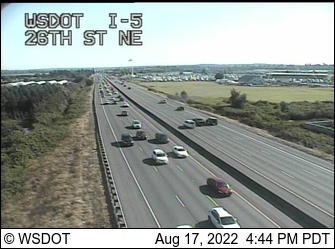 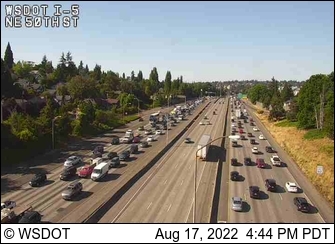 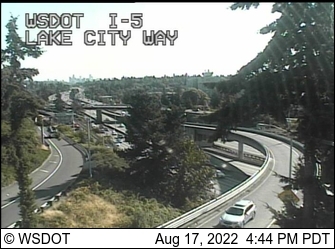 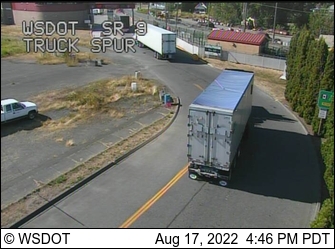 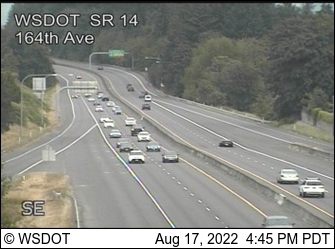 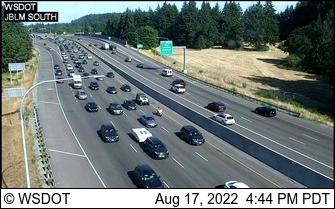 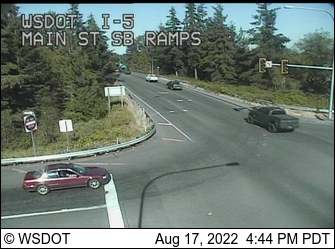 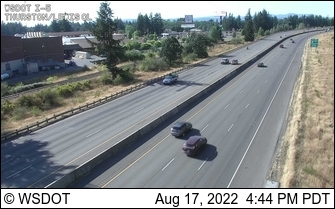 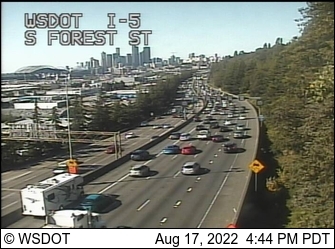 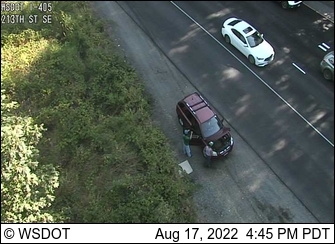 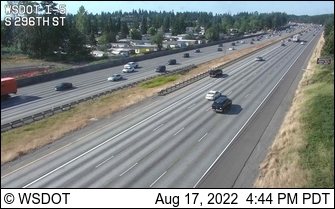 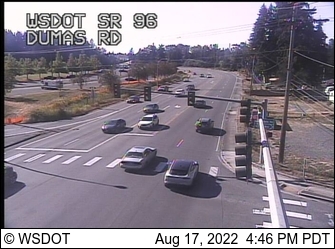 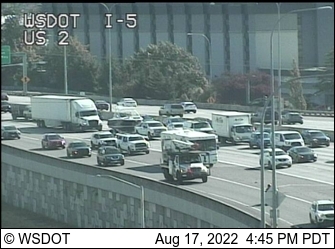 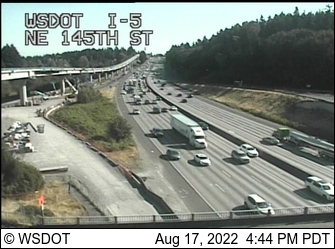 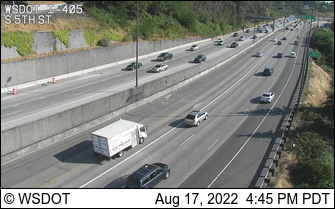 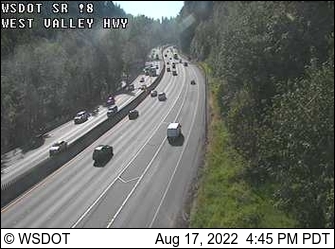 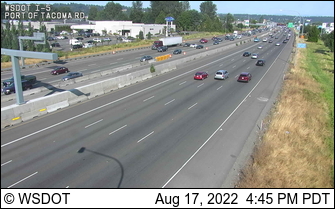 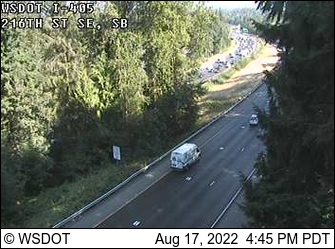 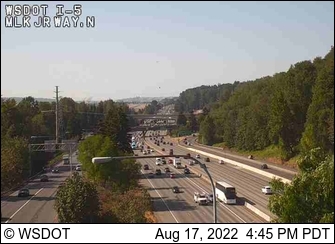 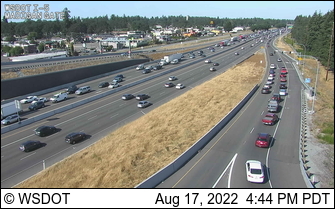 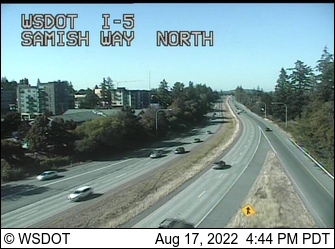 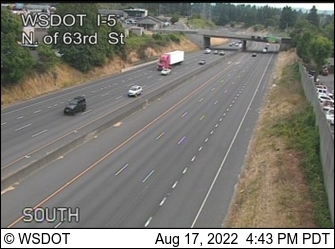 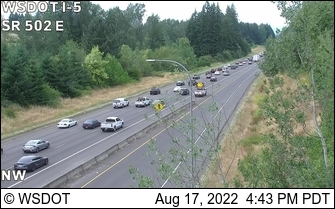 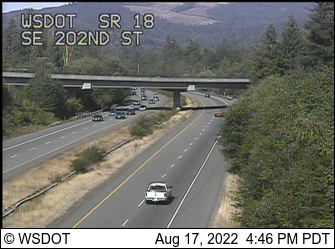 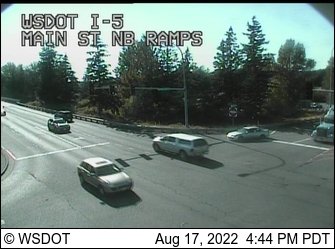 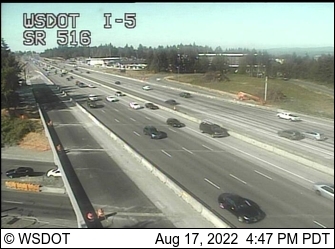 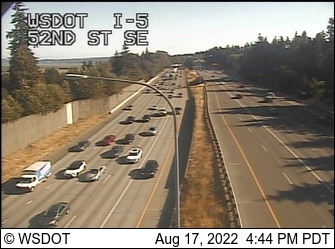 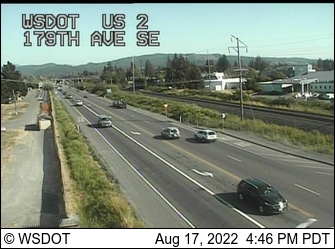 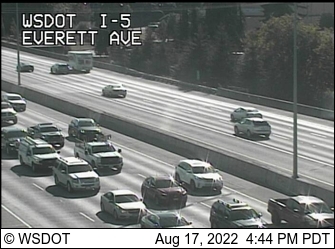 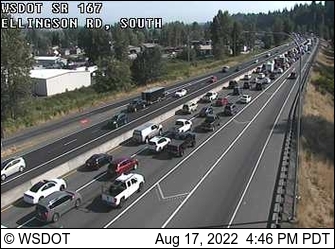 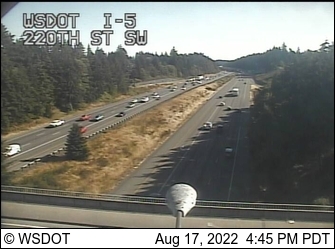 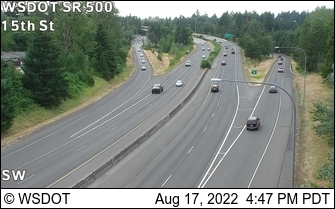 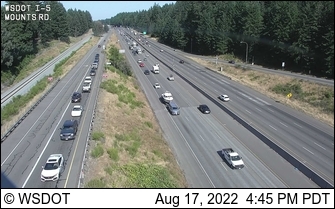 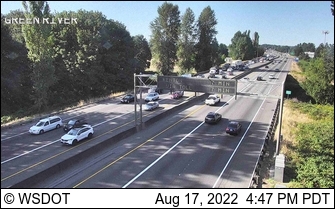 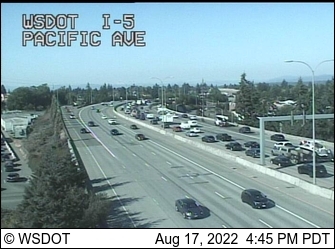 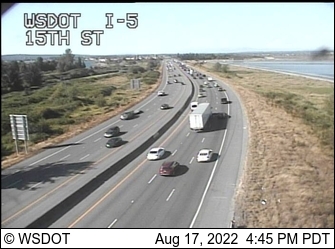 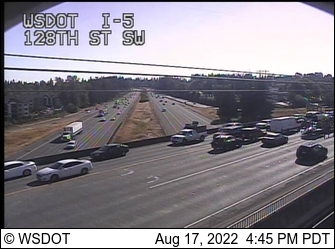 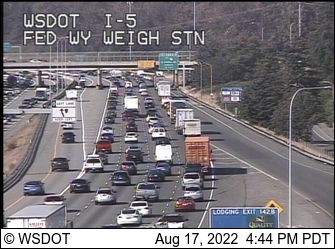 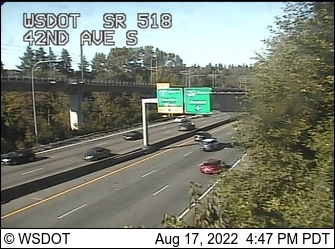 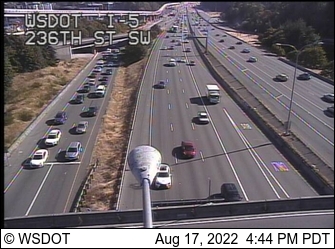 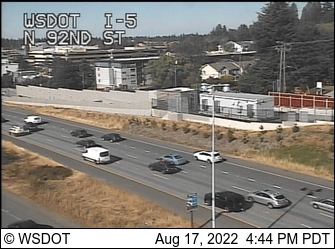 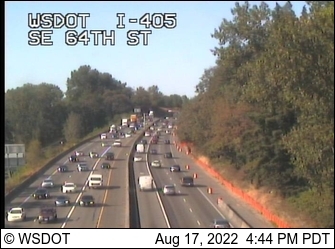 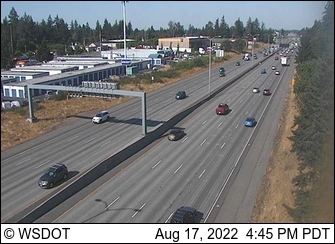 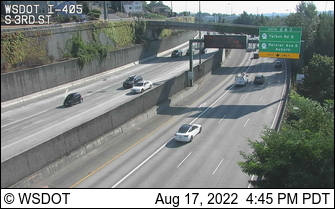 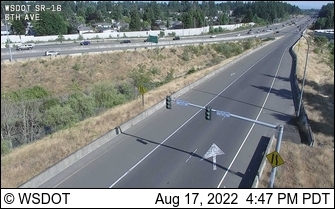 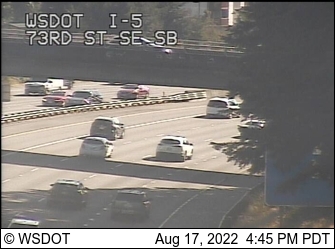 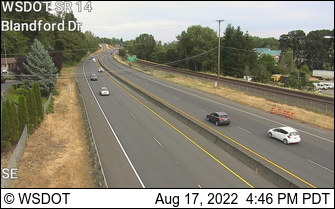 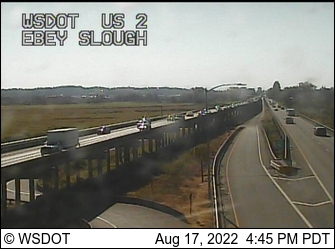 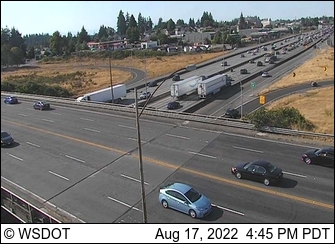 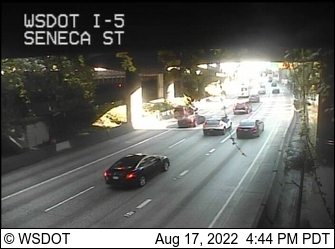 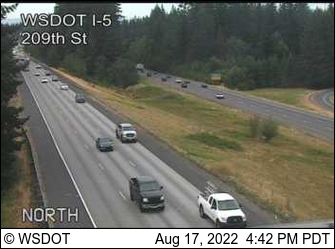 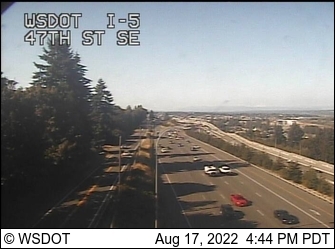 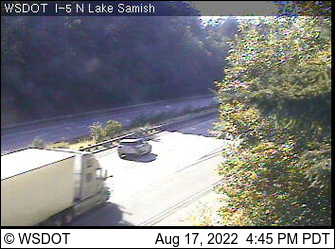 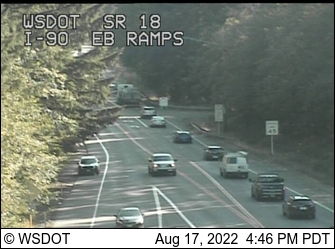 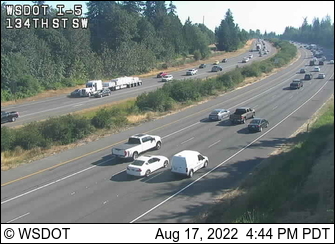 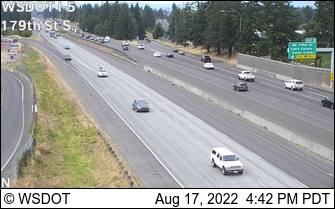 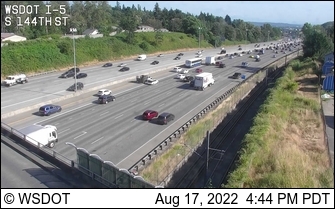 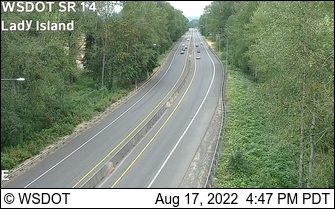 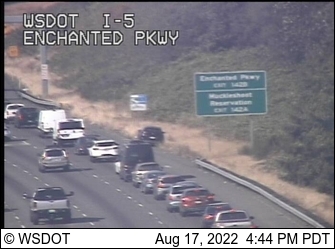 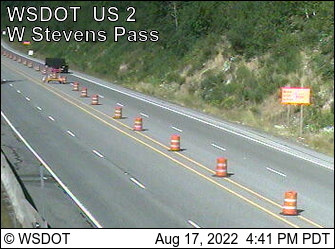 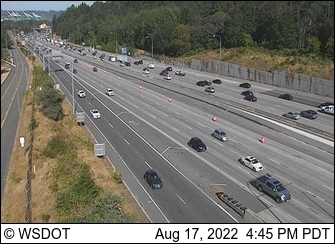 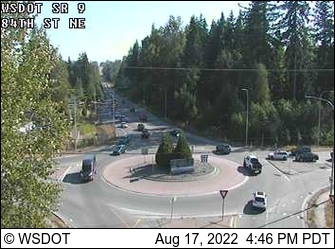 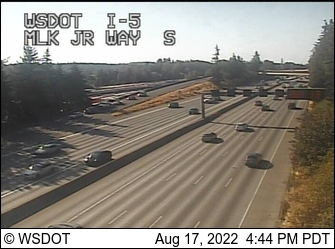 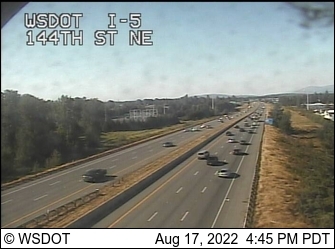 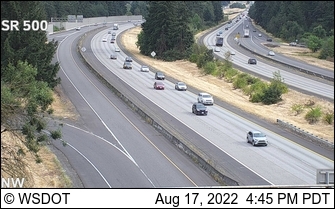 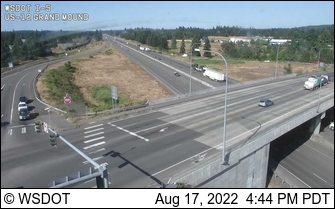 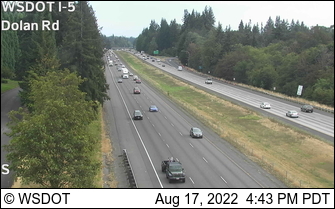 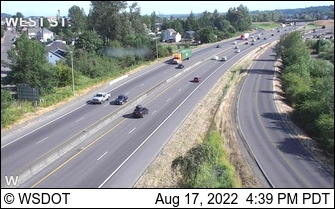 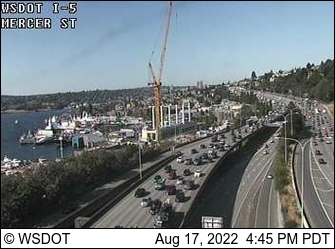 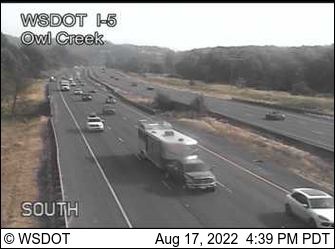 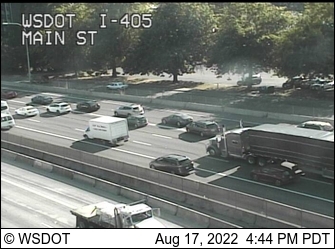 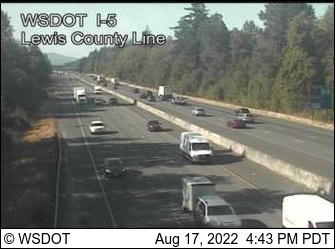 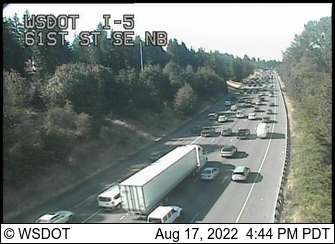 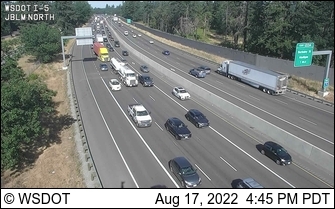 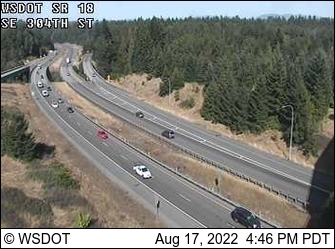 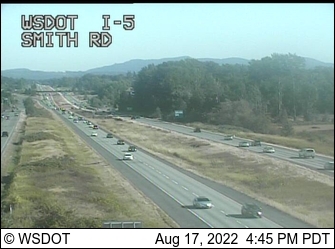 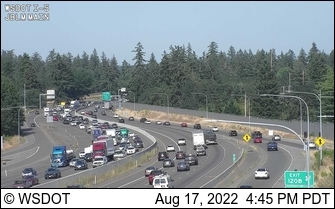 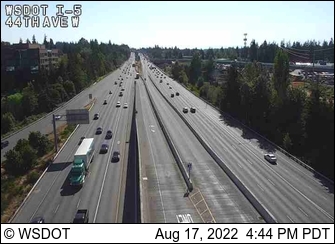 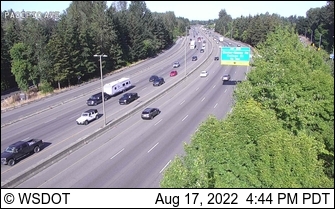 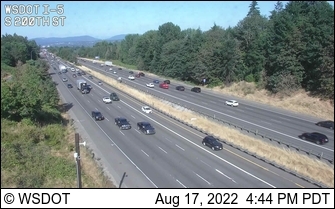 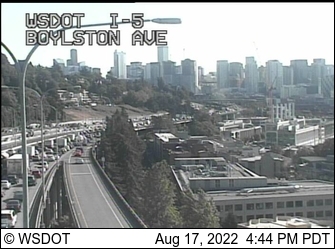 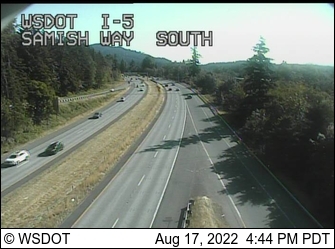 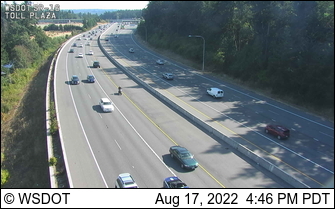 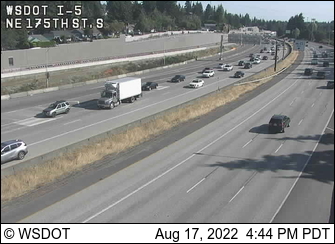 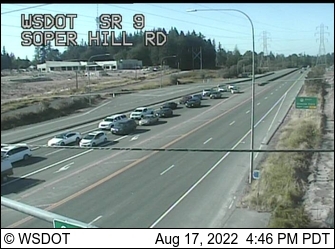 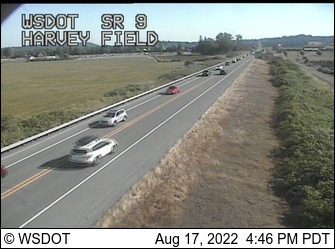 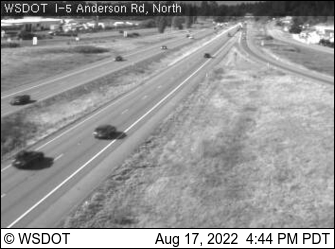 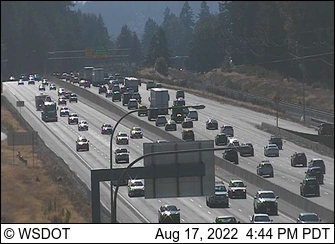 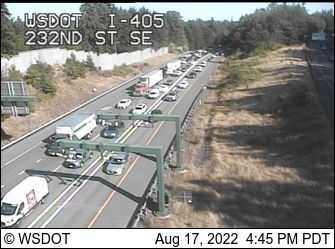 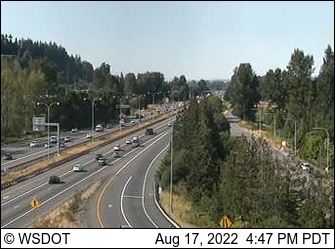 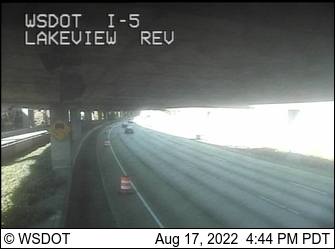 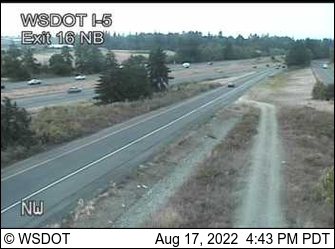 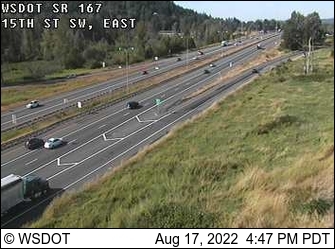 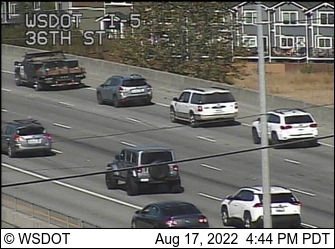 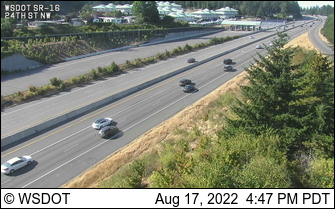 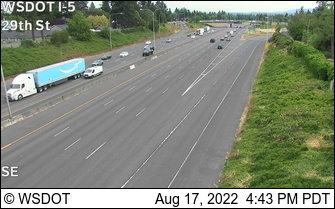 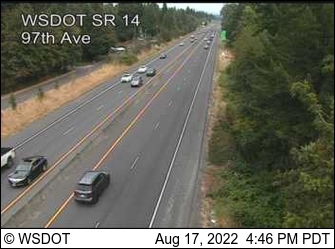 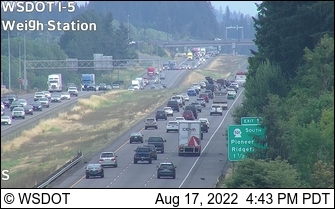 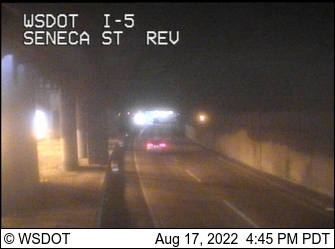 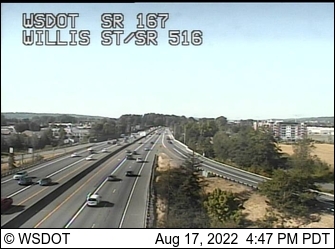 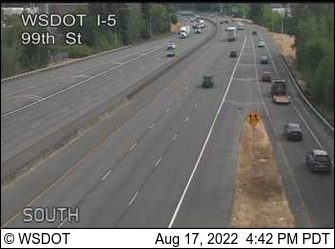 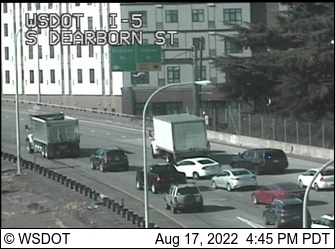 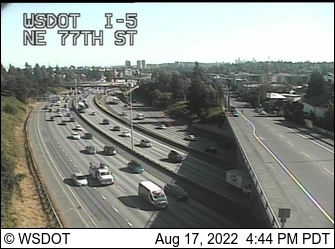 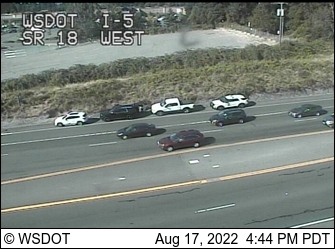 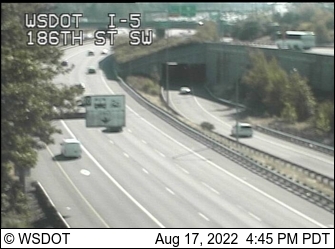 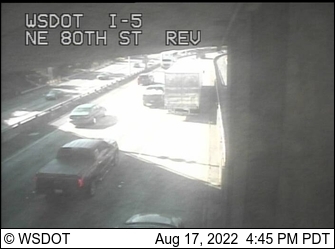 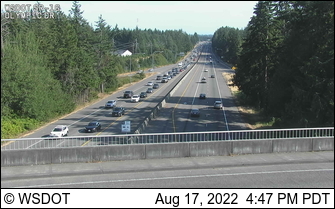 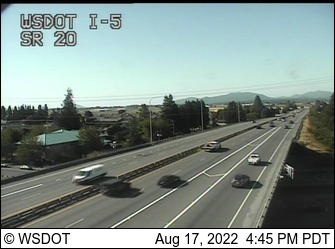 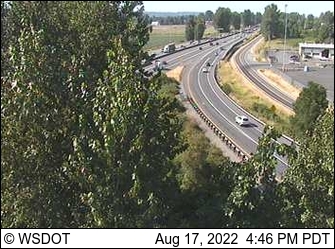 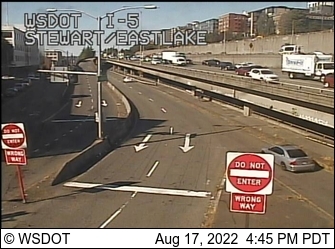 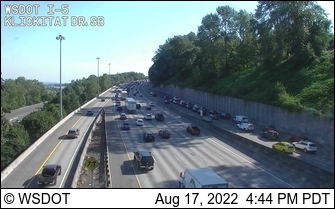 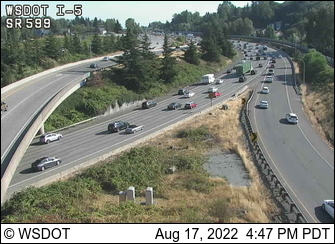 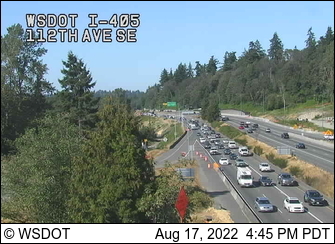 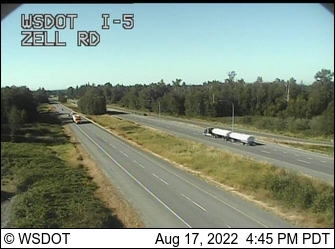 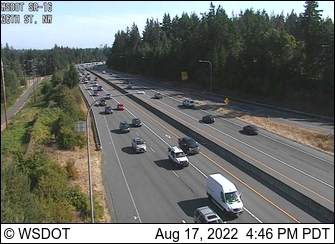 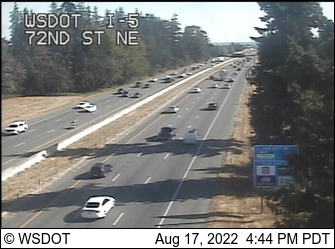 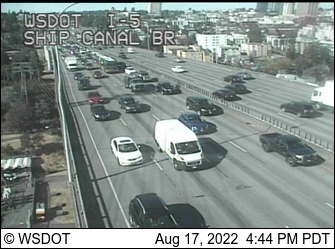 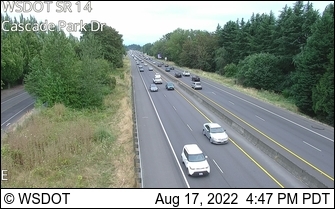 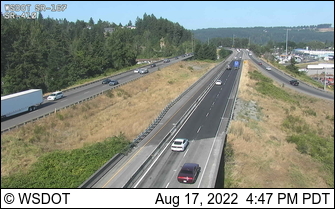 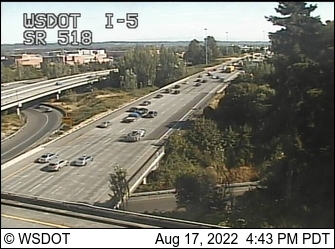 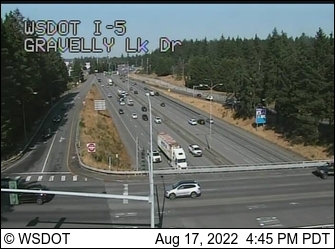 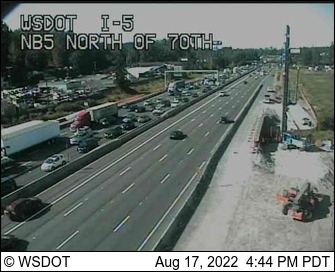 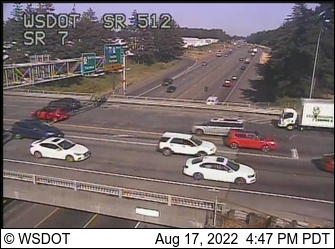 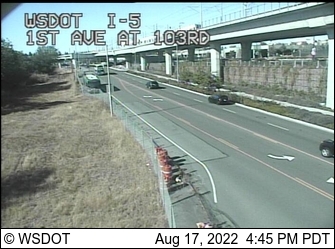 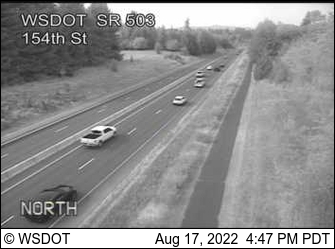 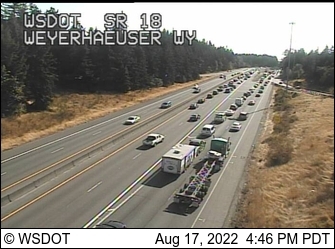 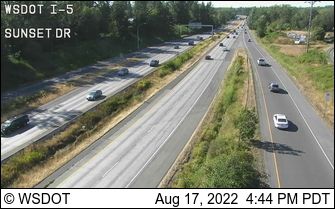 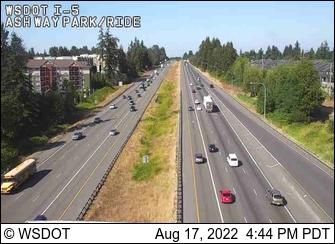 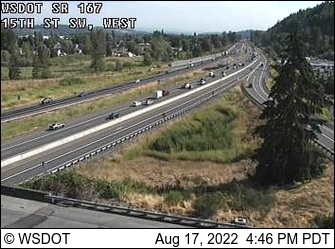 Parallels I-5 and begins at the Canadian Border at Sumas, heads south to Mount Vernon and ends north of Bothell. 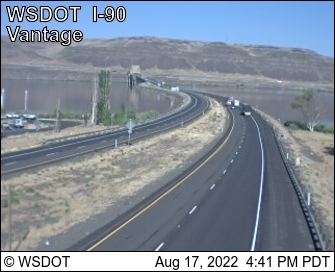 Traverses the north side of the Washington border for two thirds of the state along the Columbia River between Vancouver to south of the Tri Cities. 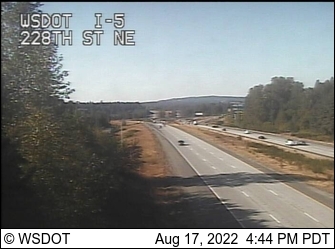 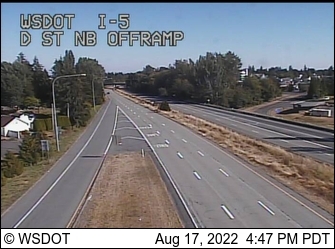 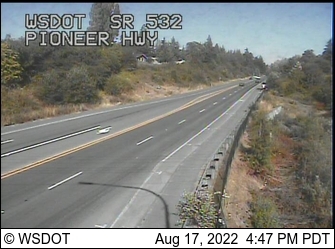 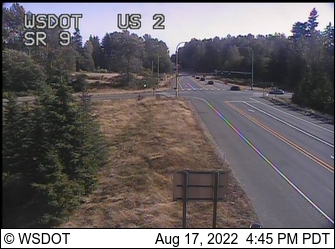 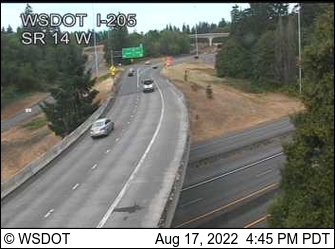 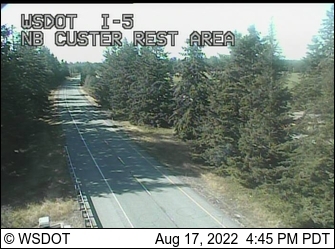 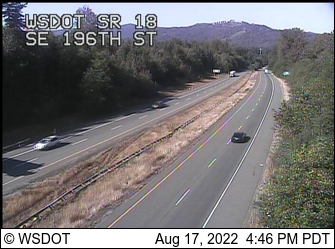 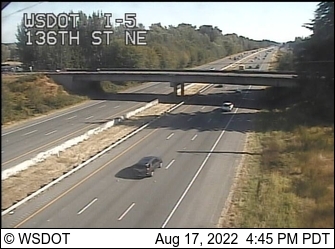 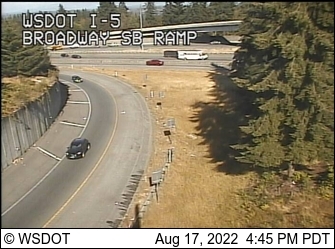 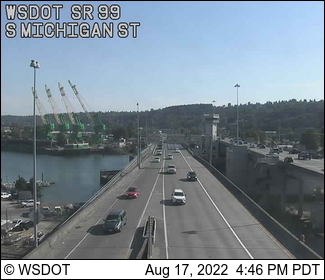 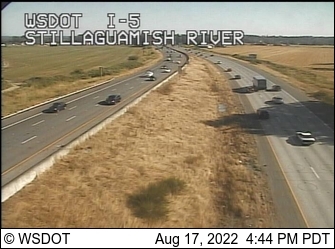 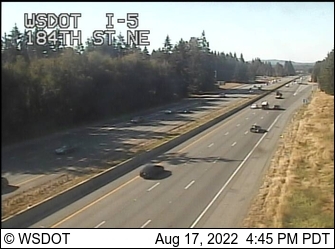 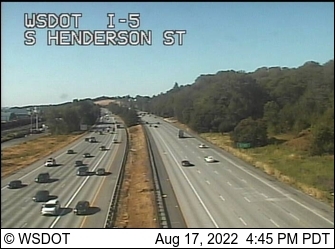 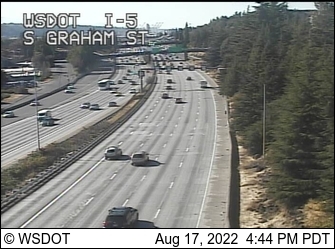 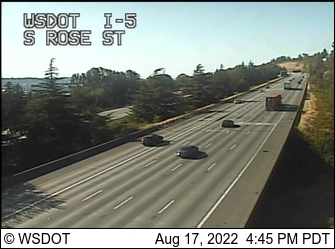 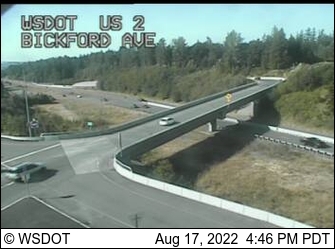 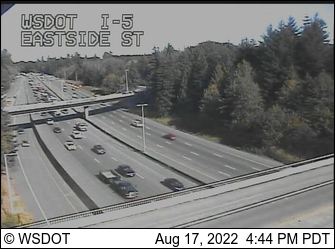 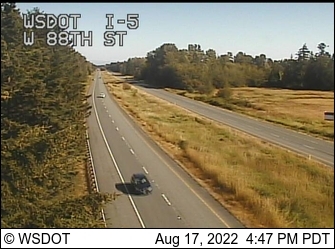 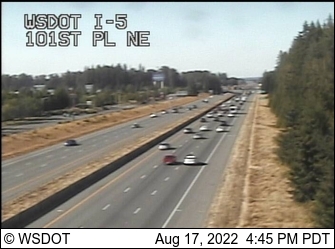 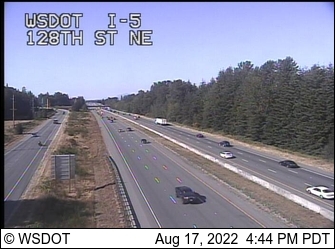 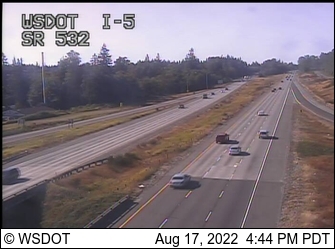 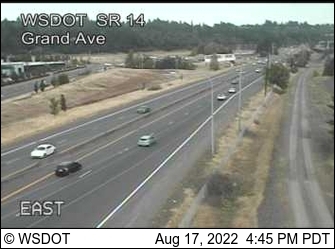 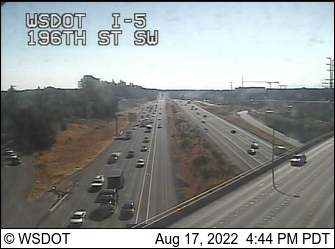 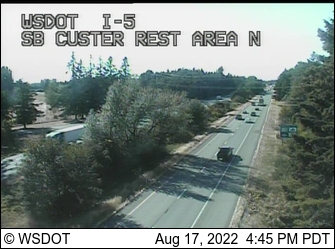 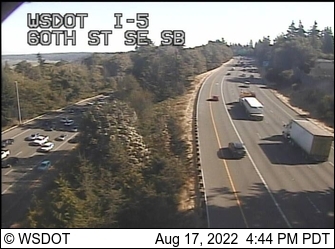 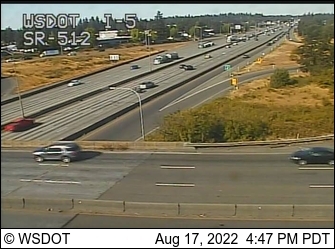 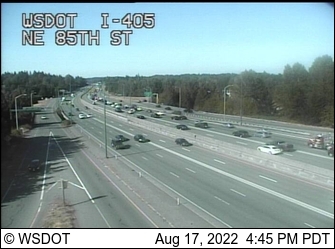 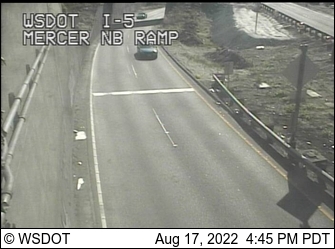 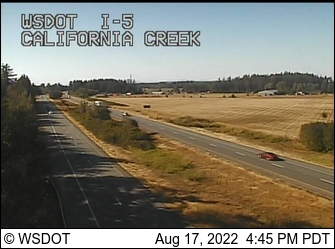 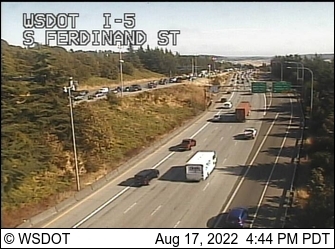 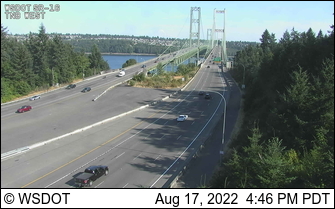 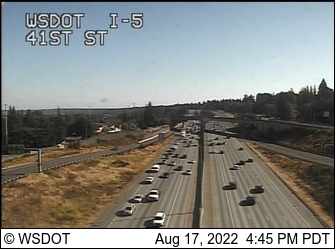 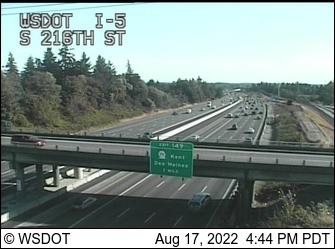 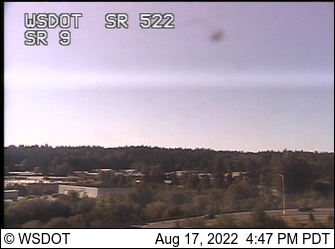 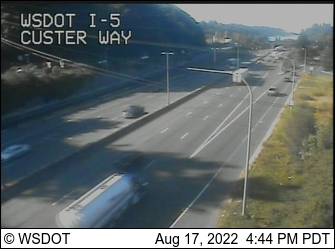 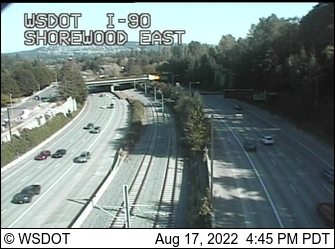 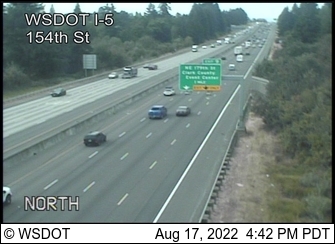 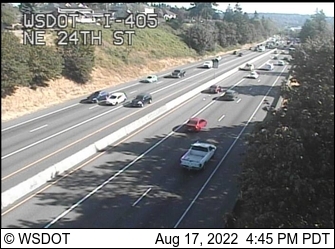 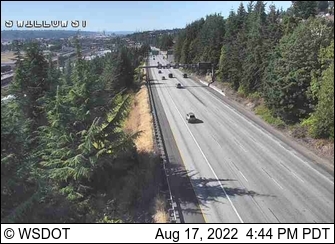 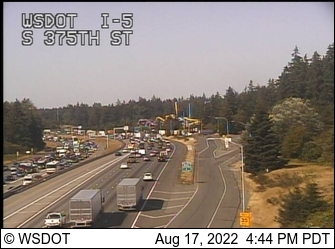 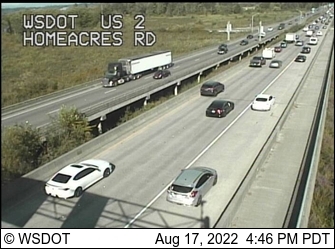 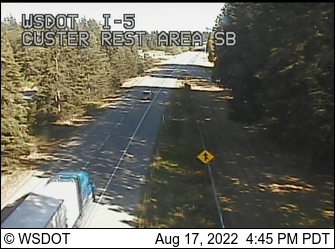 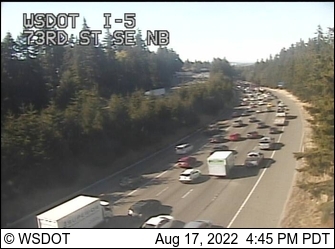 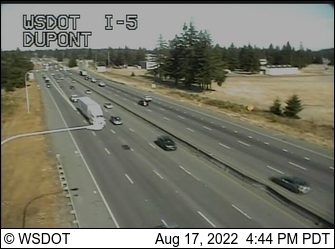 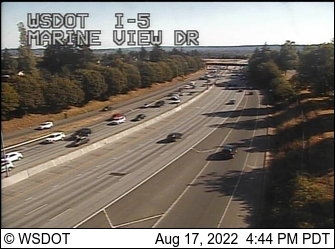 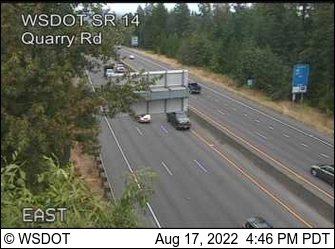 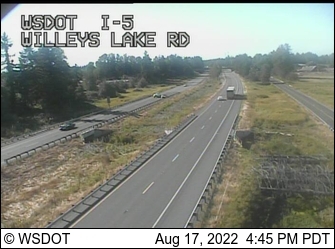 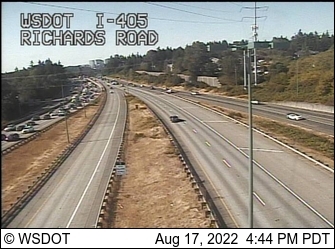 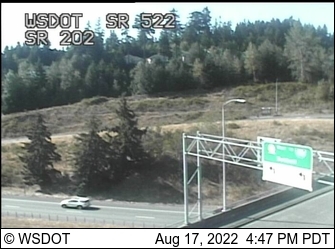 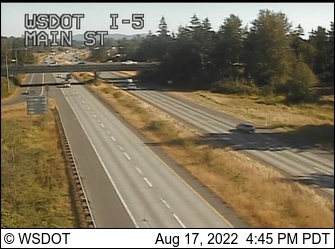 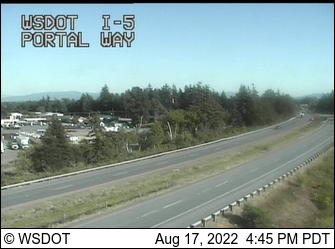 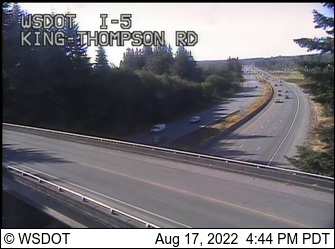 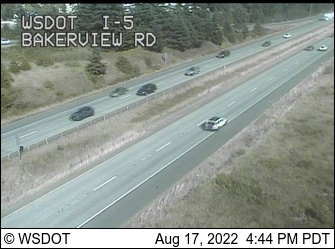 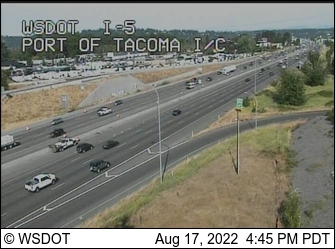 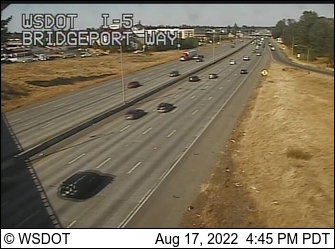 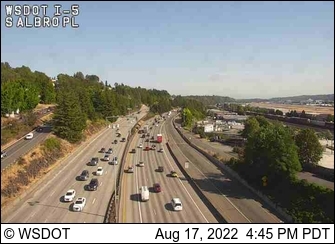 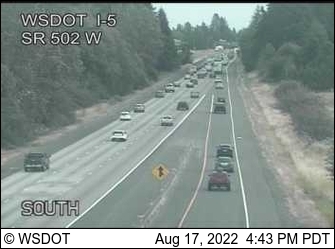 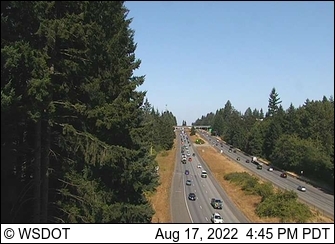 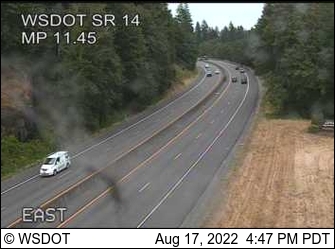 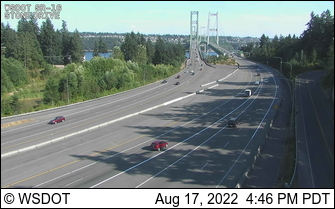 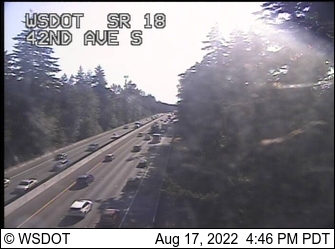 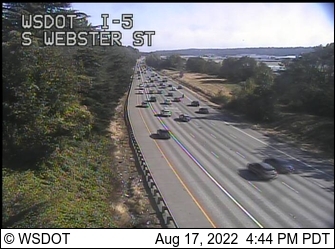 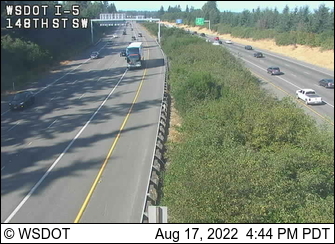 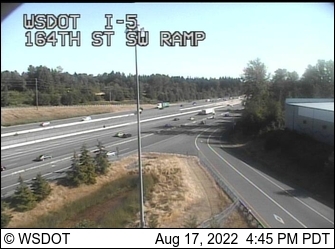 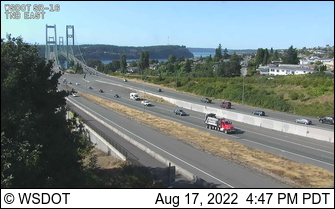 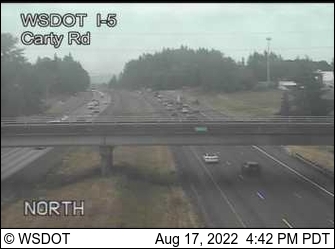 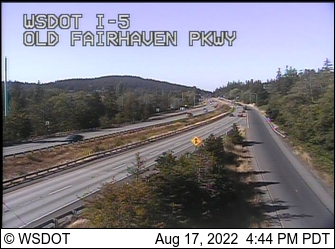 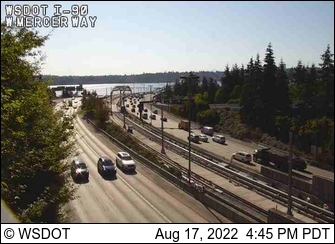 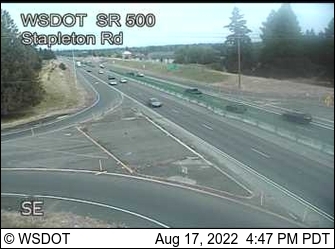 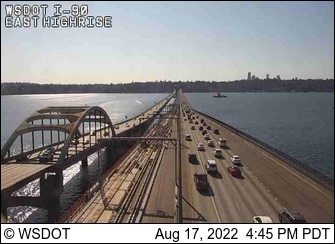 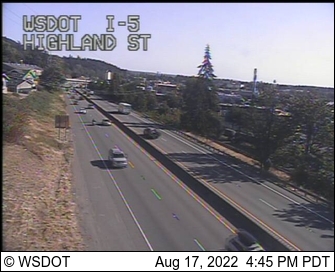 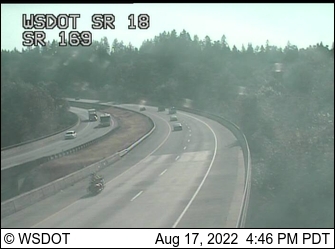 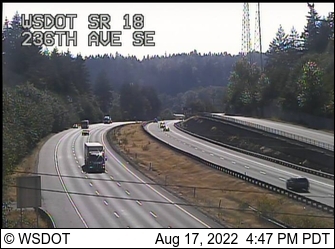 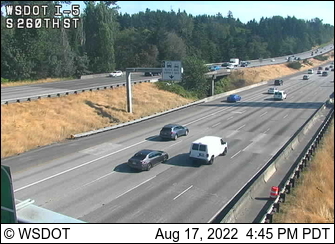 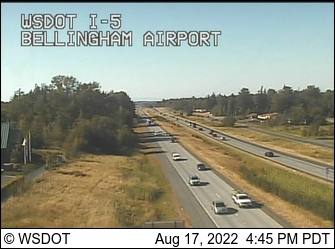 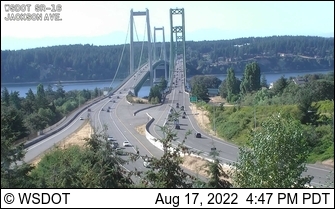 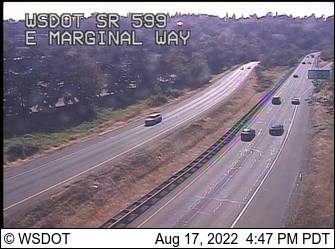 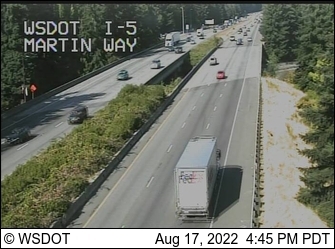 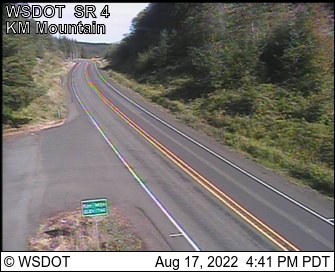 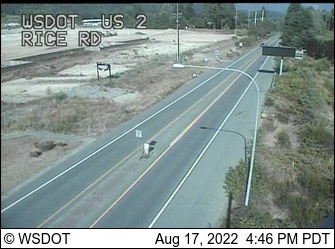 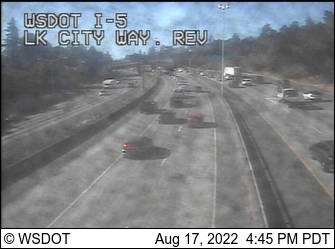 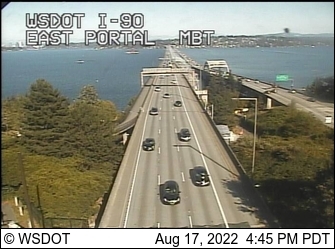 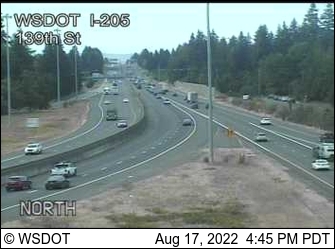 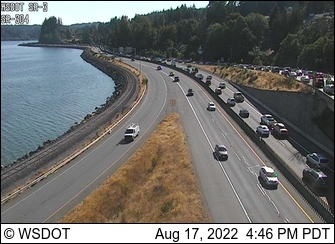 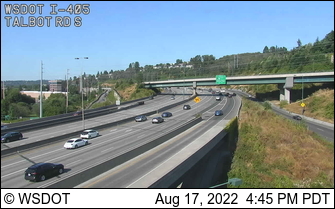 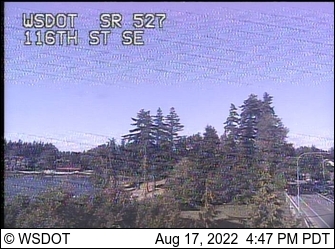 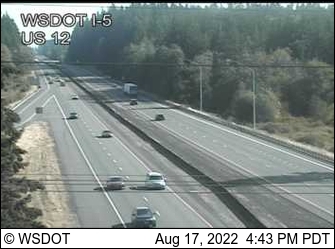 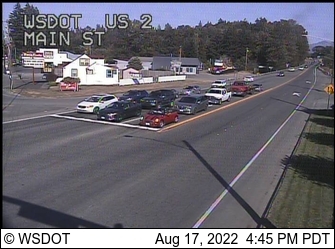 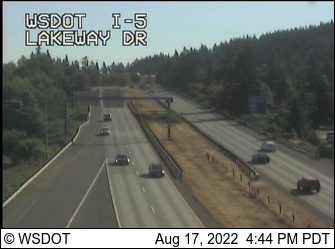 From I-5 near Tacoma, over the Tacoma Narrows to Gig Harbor ending just south of Port Orchard. 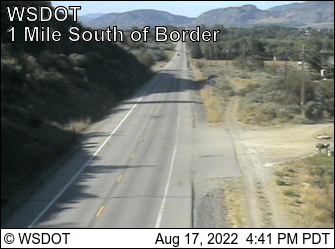 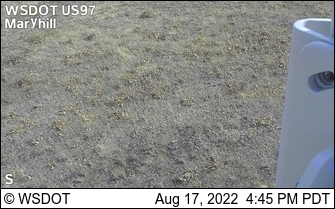 Runs north-south beginning near north of Bridgeport, running south to Mesa. 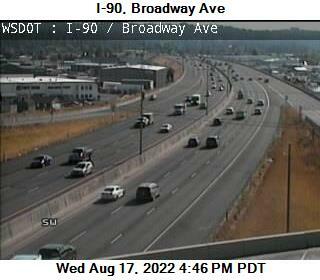 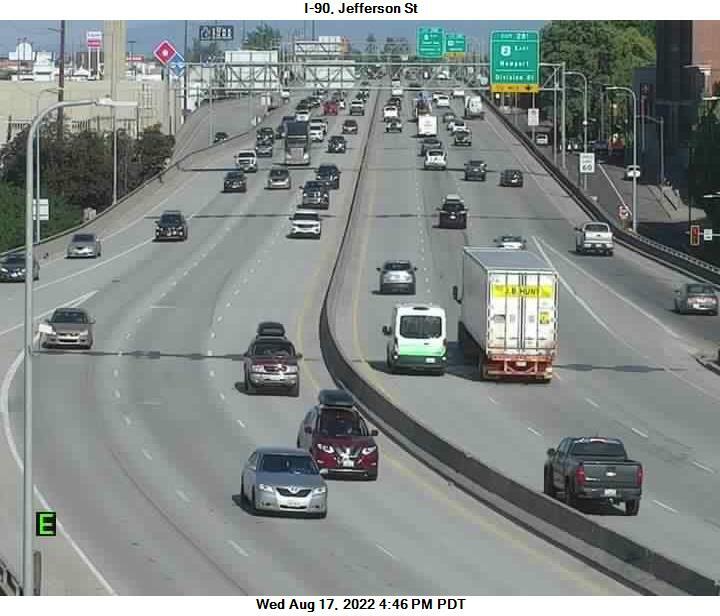 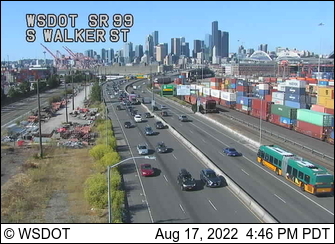 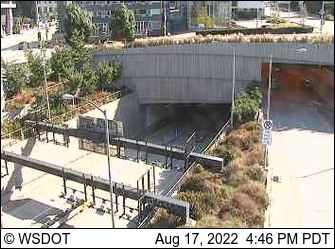 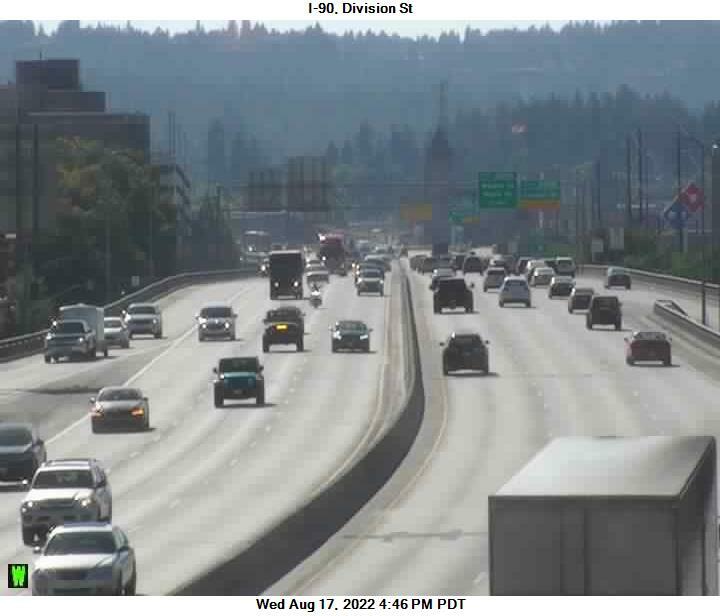 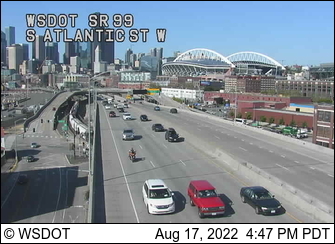 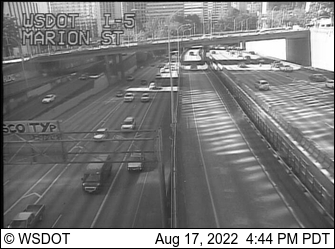 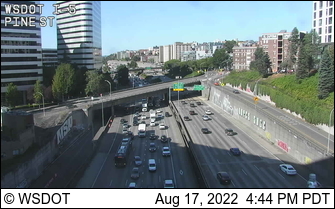 Provides a way to travel between Interstate 5 and Interstate 90 while avoiding the Seattle metropolitan area. 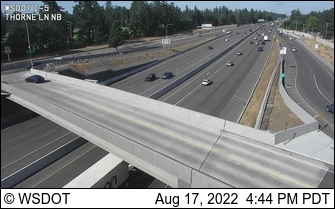 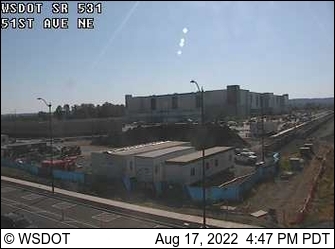 Connects to Interstate 5 at Federal Way, passes by Auburn and joins Interstate 90 just west of North Bend. 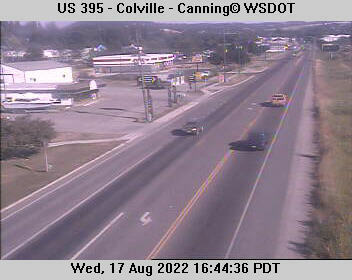 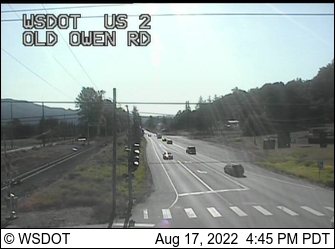 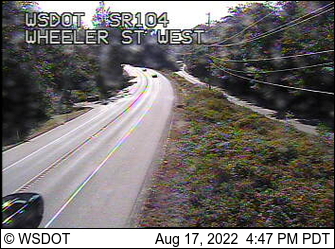 From US 101 on the Olympic Peninsula to Port Townsend. 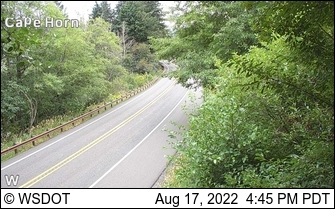 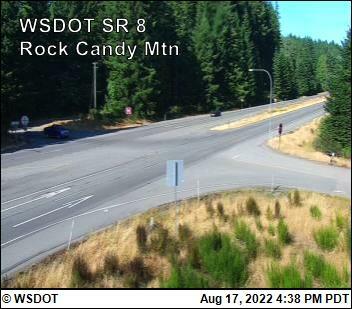 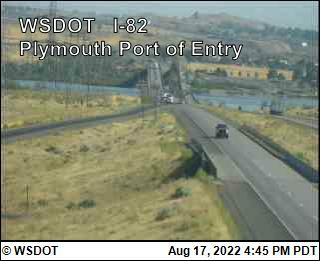 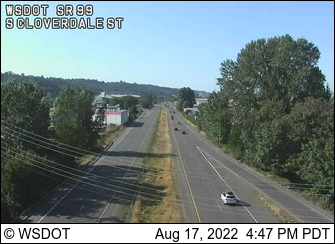 By ferry to SR 525 on Whidbey Island, up Whidbey to Anacortes, then crossing I-5 through Sedro Woolley and goes over Washington Pass, through Winthrop and Omak, to the Idaho border at Newport. 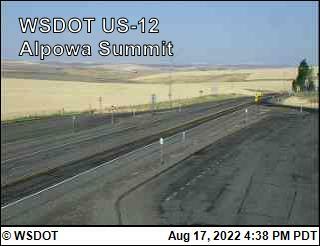 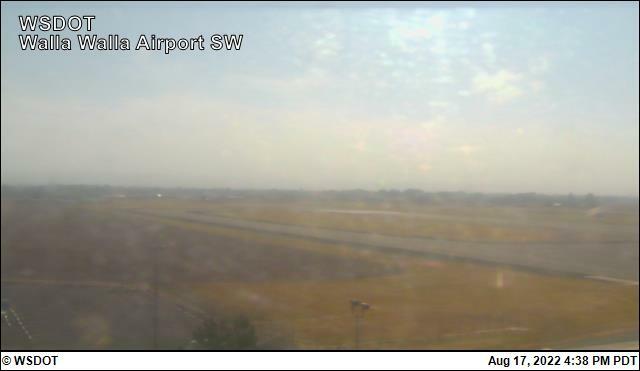 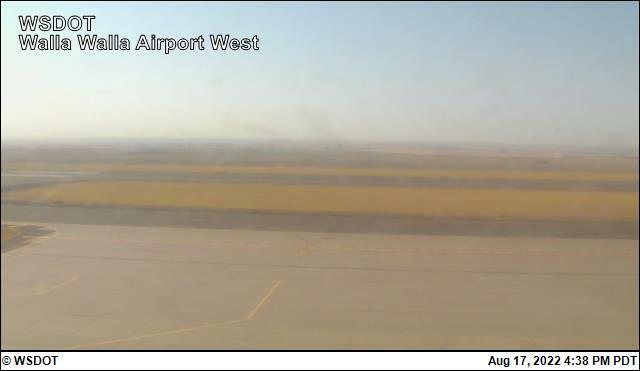 Begins west of Quincy and runs east through Ephrata to Davenport. 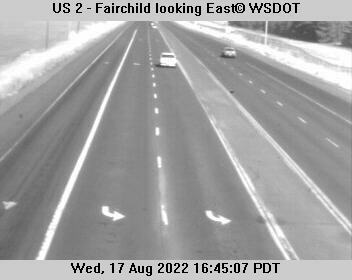 Parallels I-5 between Everett and Fife. 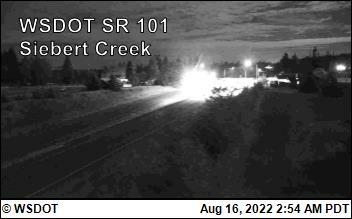 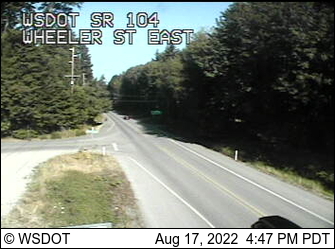 Connects US 101 to SR 3 on the Kitsap Peninsula. 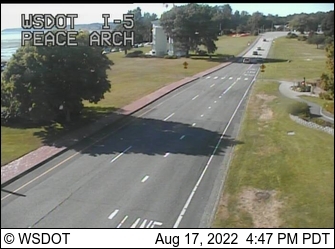 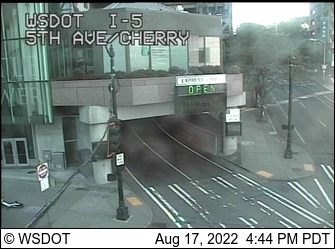 Also known as Pearl Street in Tacoma. 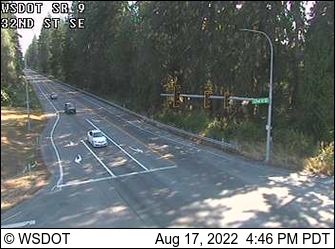 This highway connects SR 16 to the town of Ruston and crosses Puget Sound to Vashon Island. 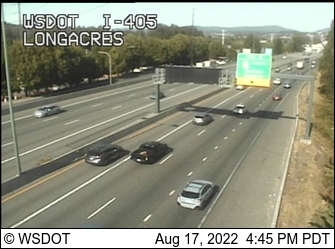 Connects to I-5 and I-405, passing through Kent and Auburn. 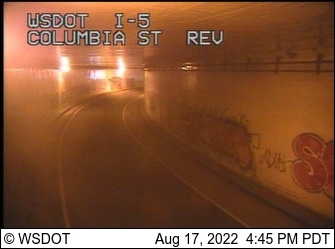 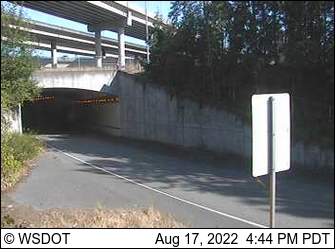 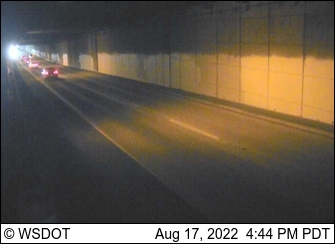 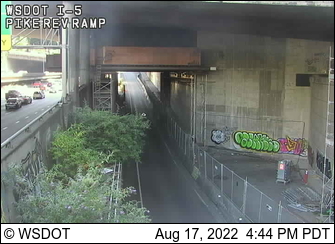 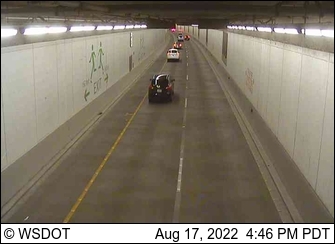 Runs between Renton and Enumclaw, passing under Highway 18. 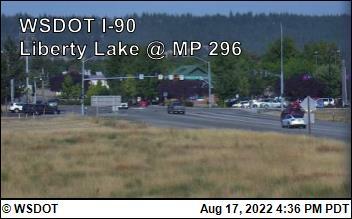 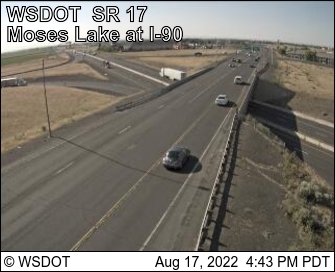 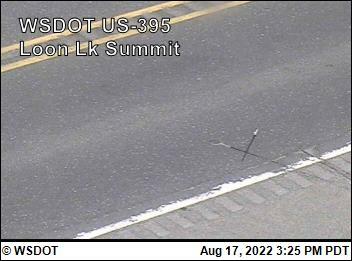 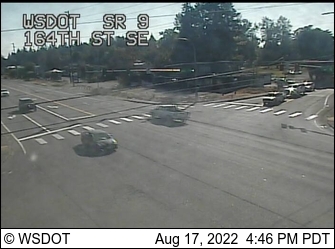 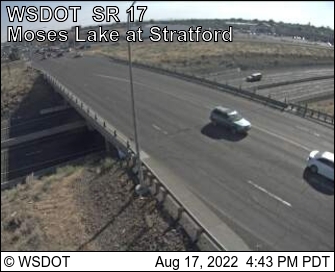 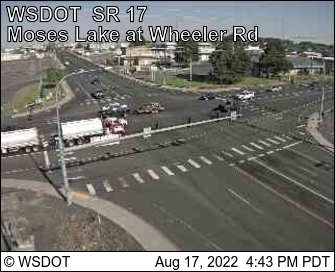 Connects Lake Stevens at SR 9 to US 2 near Everett. 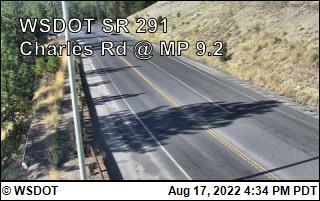 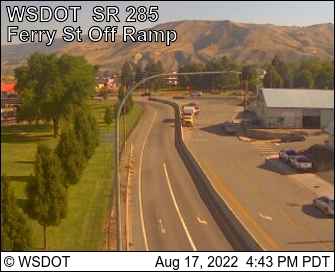 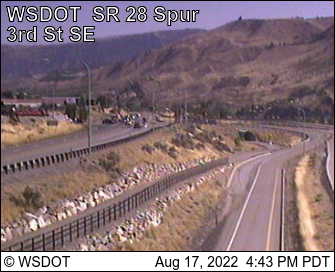 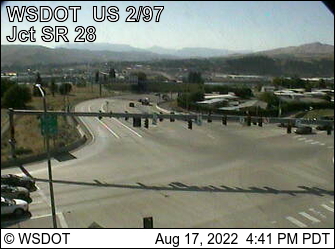 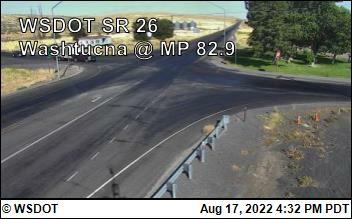 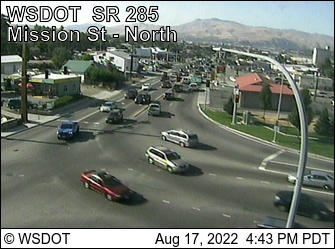 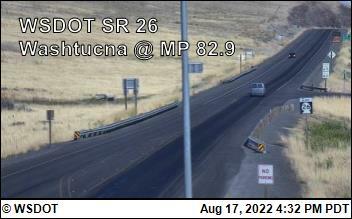 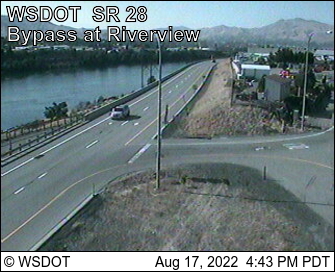 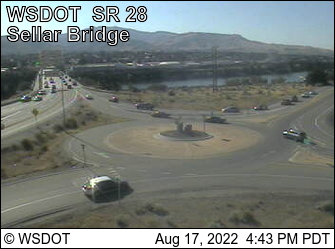 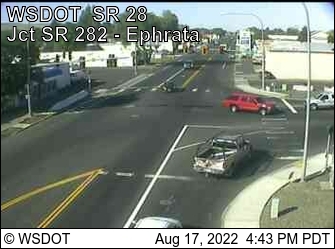 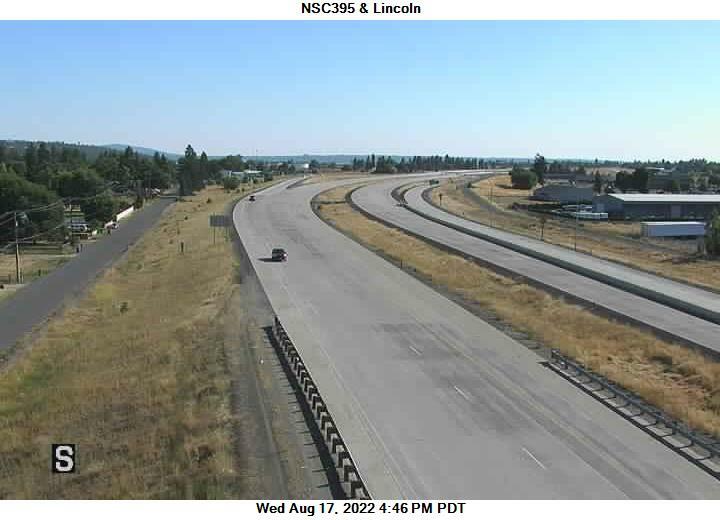 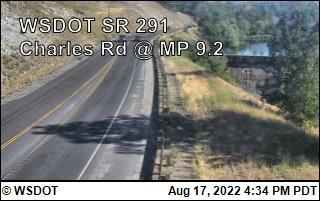 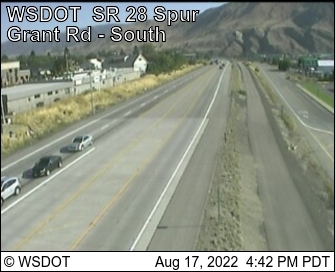 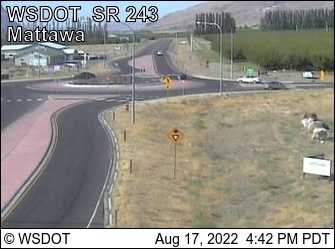 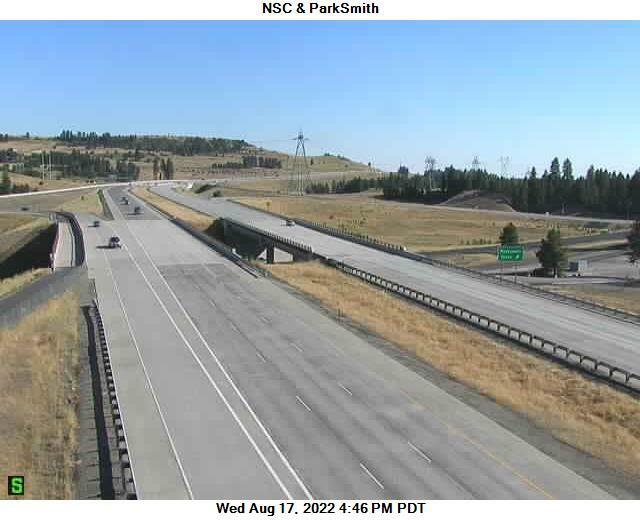 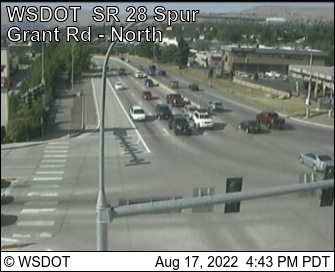 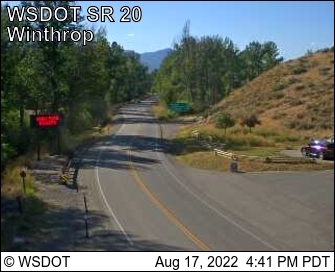 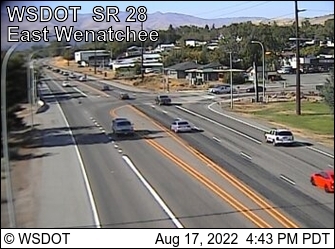 SR 285 at MP 4: N. Wenatchee Ave.
North of Spokane this highway travels east-west and connects US 2 / US 395 and SR 231. 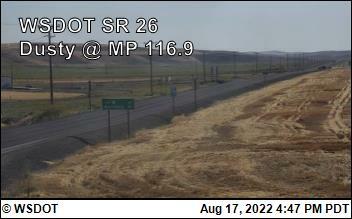 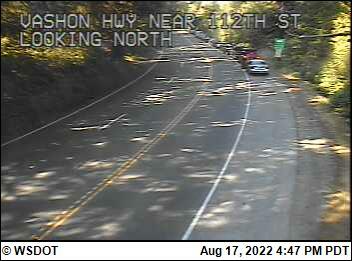 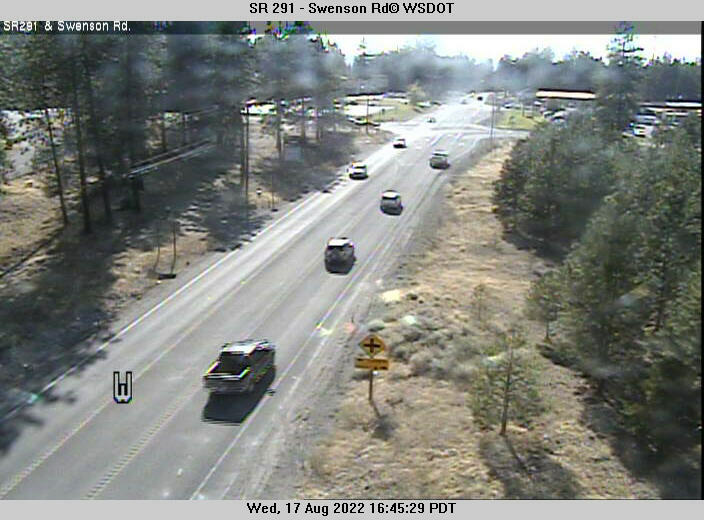 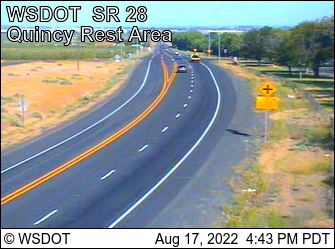 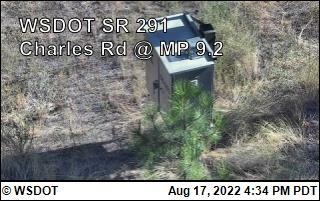 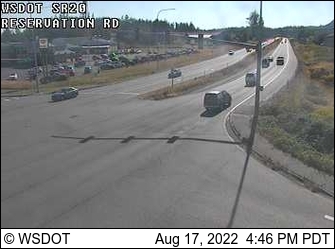 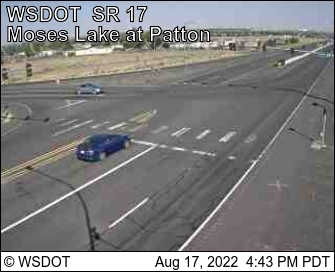 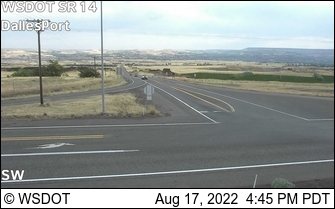 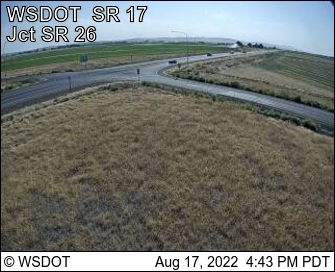 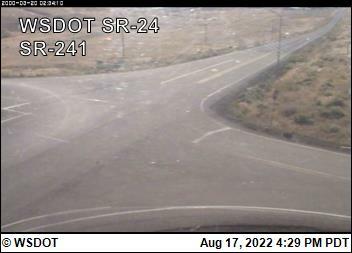 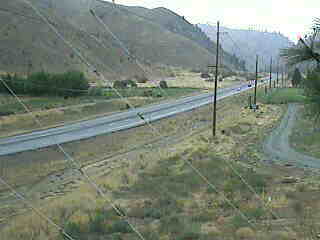 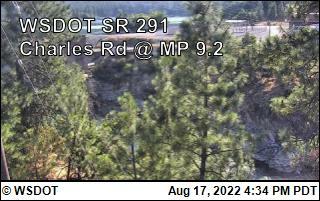 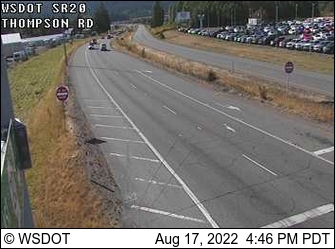 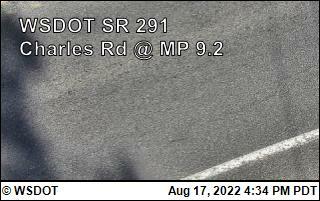 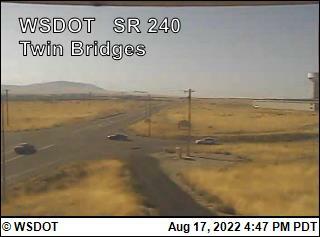 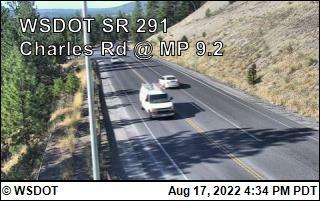 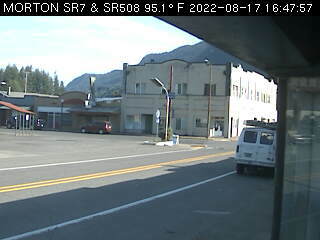 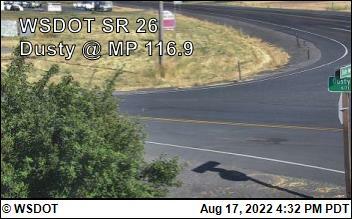 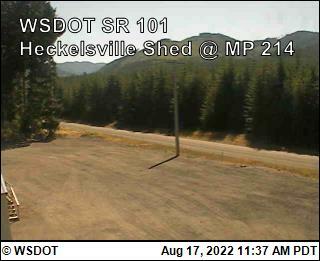 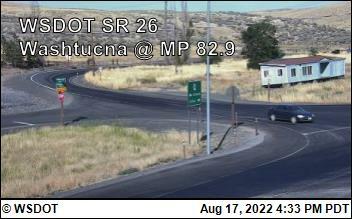 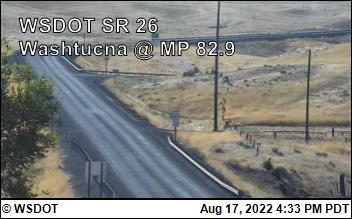 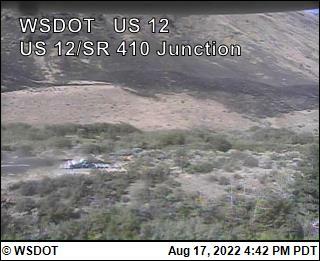 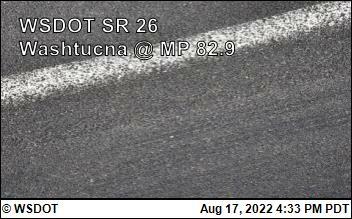 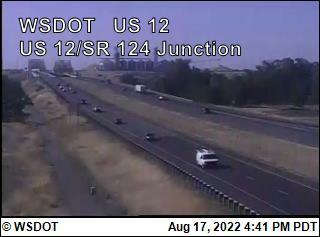 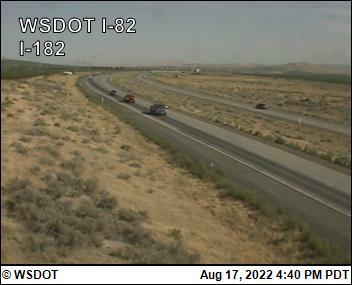 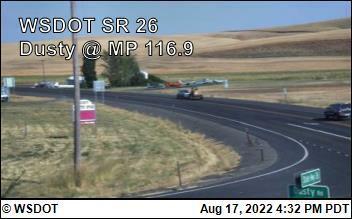 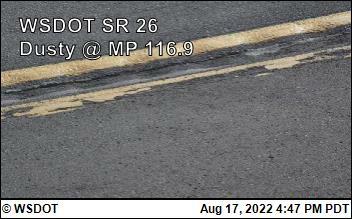 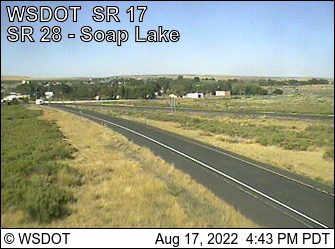 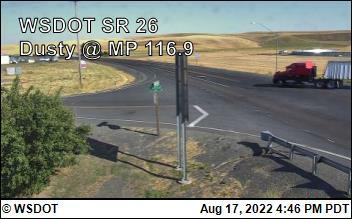 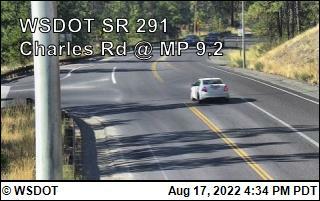 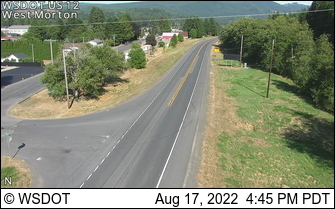 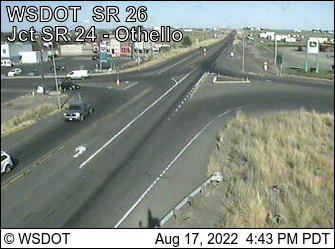 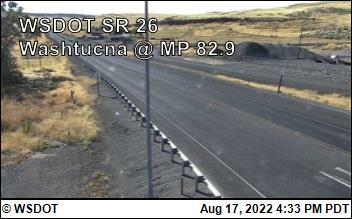 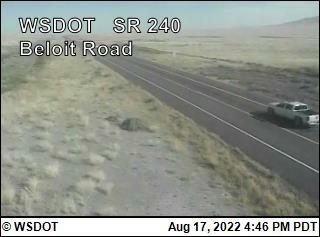 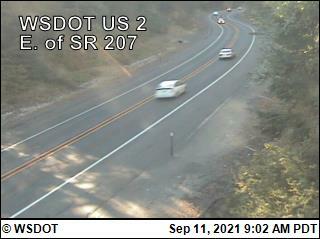 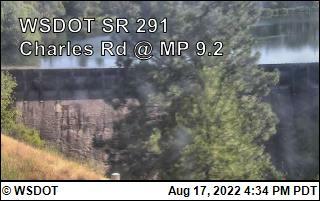 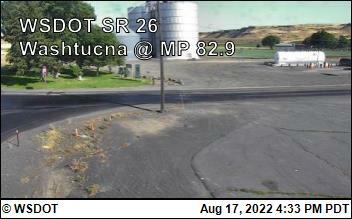 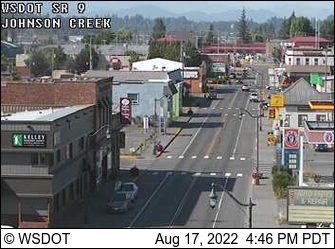 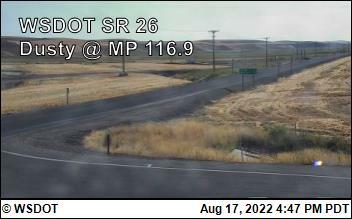 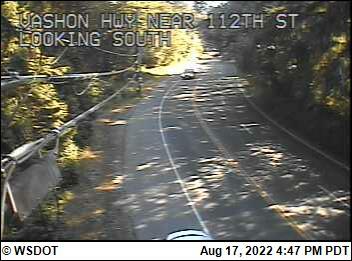 SR 291 at MP 12.9: Swenson Rd. 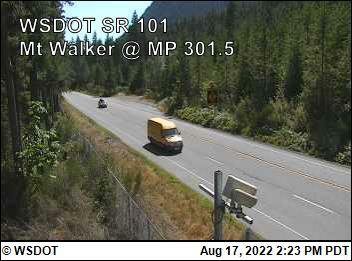 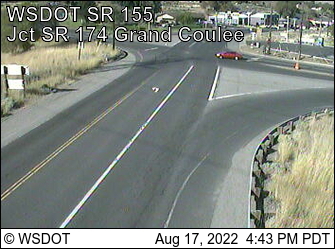 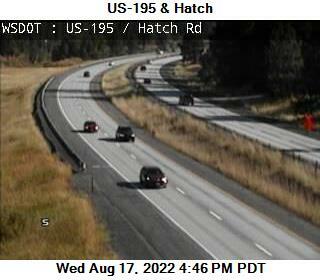 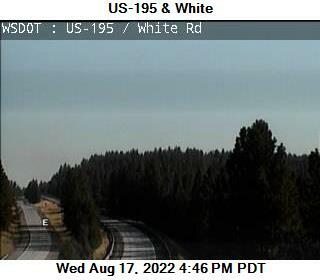 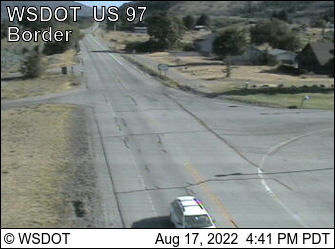 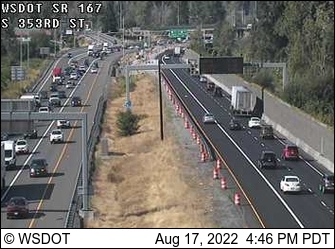 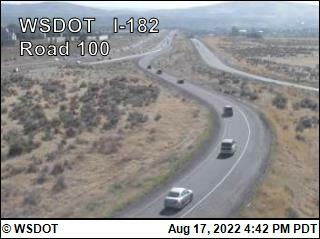 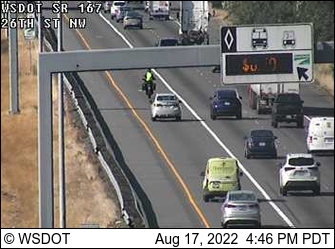 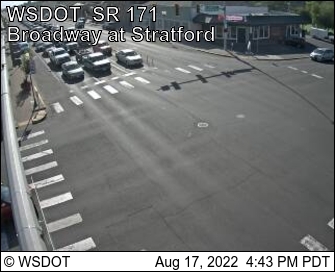 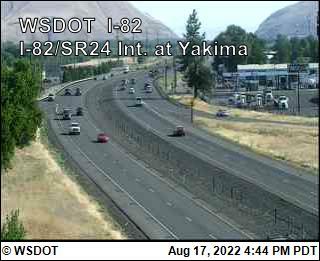 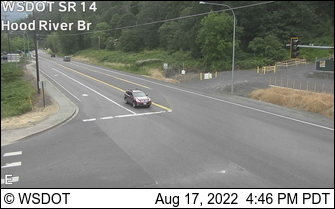 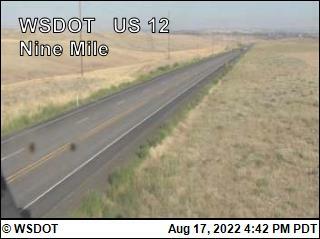 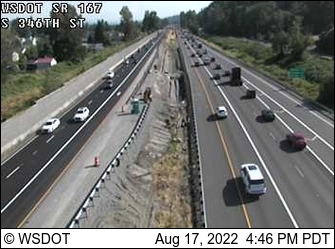 This route travels between SR 167 in Sumner to US 12 northwest of Yakima and traverses the north side of Mount Rainier. 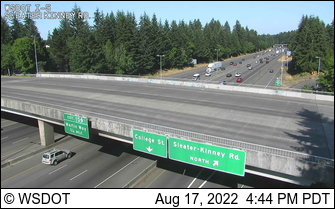 Connects to Interstate 5 at Vancouver, crosses over Interstate 205, and leads to Camas at SR 14. 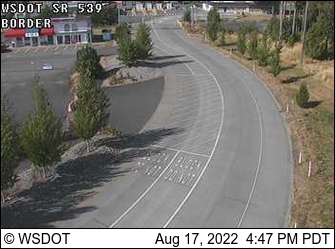 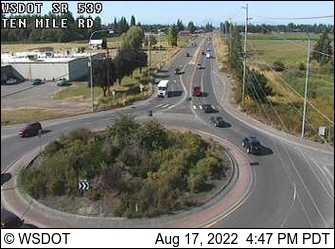 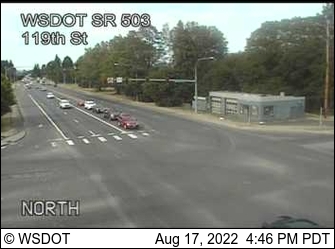 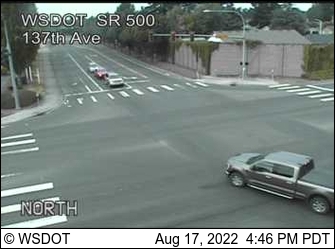 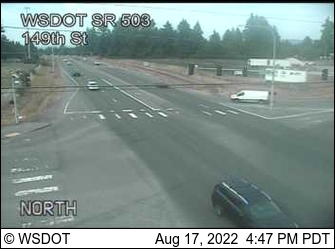 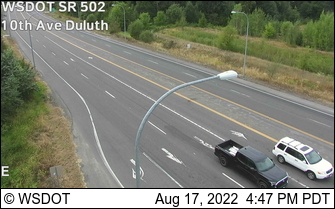 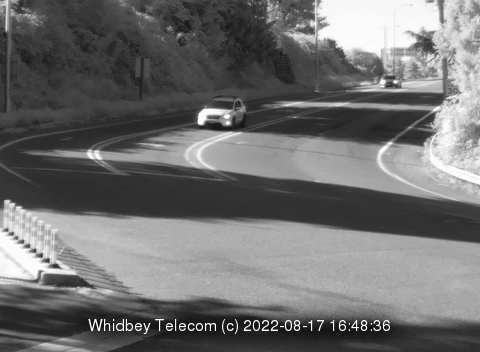 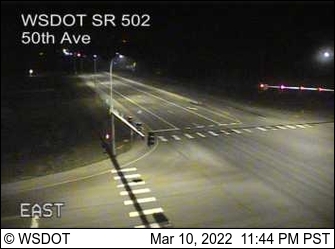 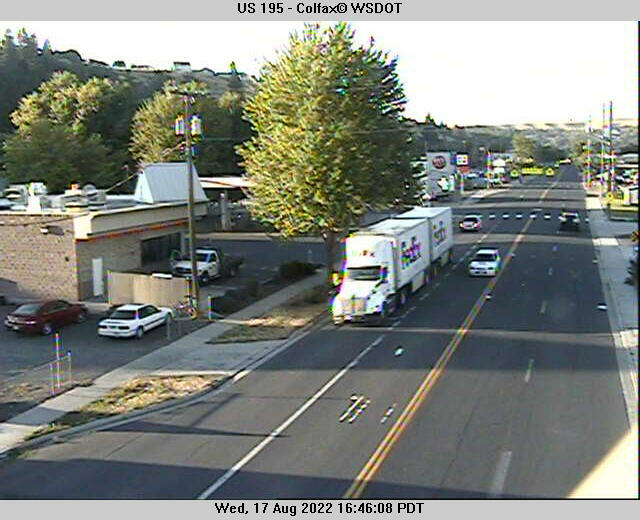 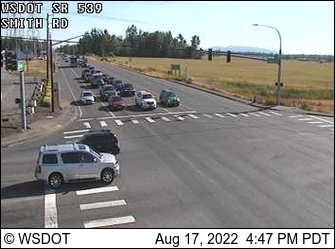 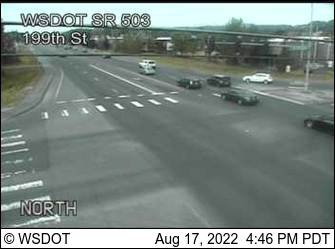 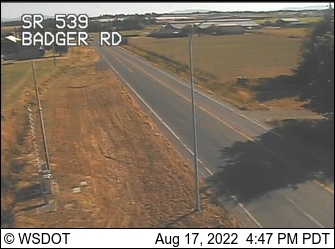 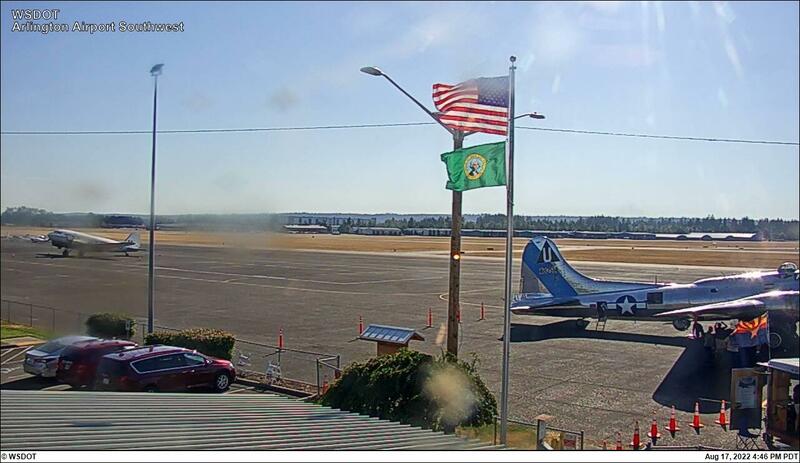 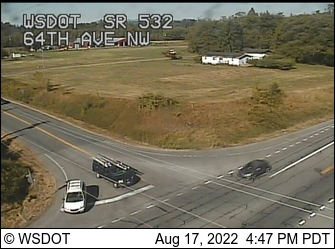 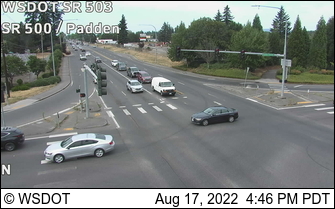 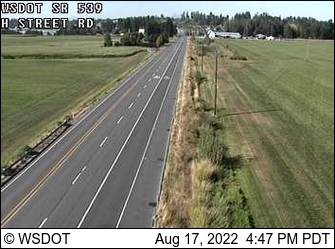 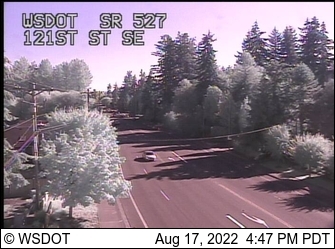 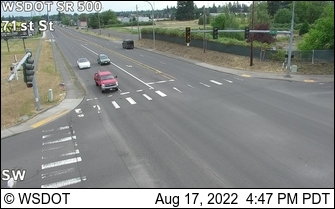 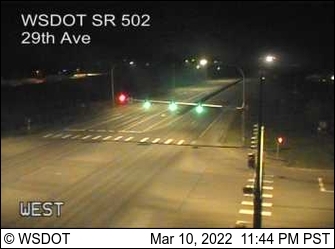 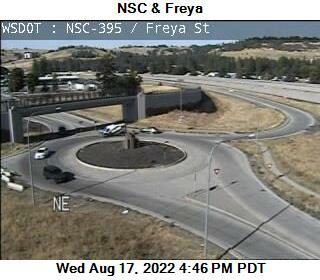 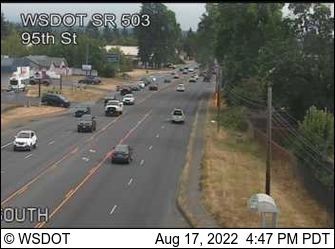 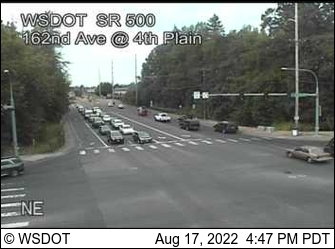 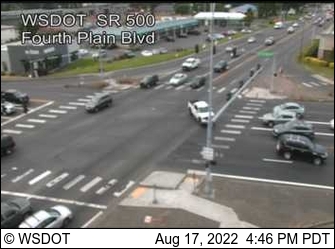 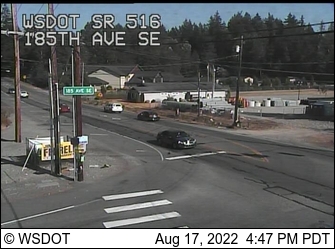 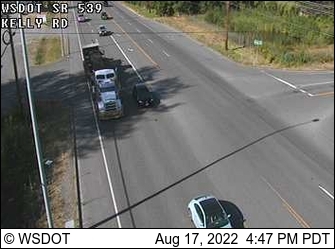 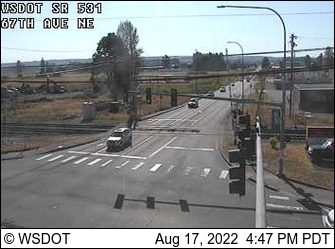 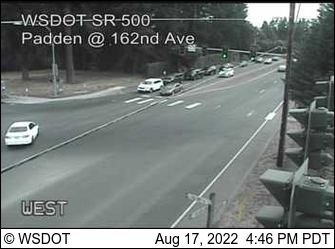 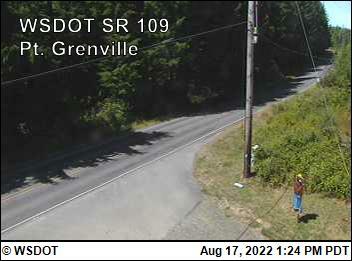 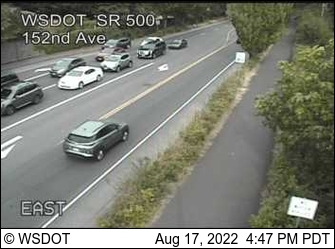 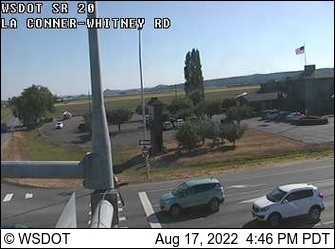 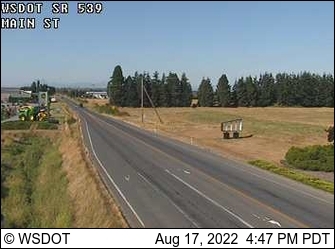 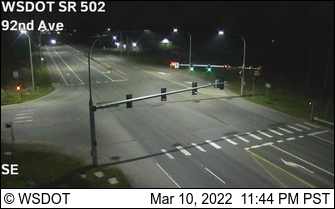 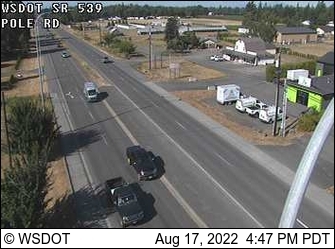 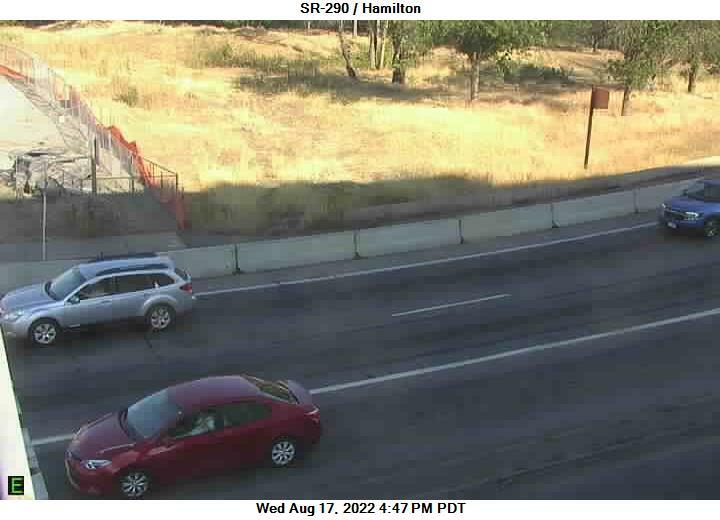 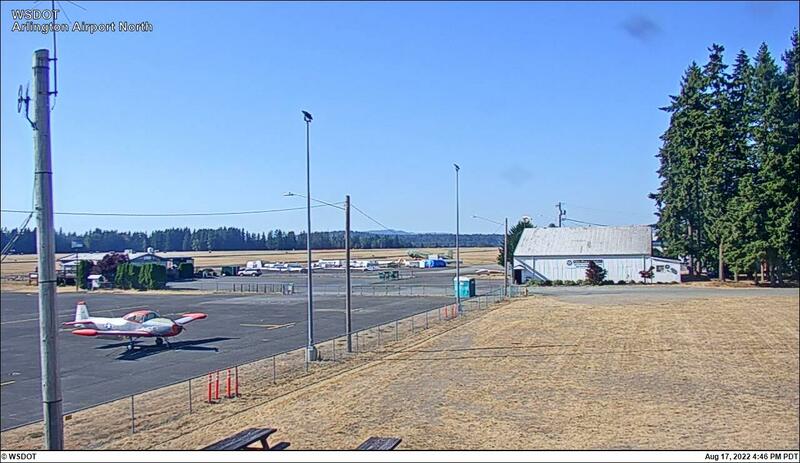 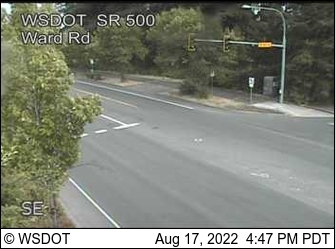 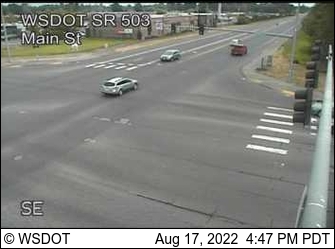 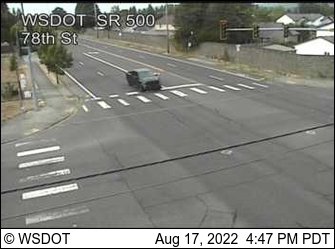 SR 500 at MP 5.4: 112th & Gher Rd. 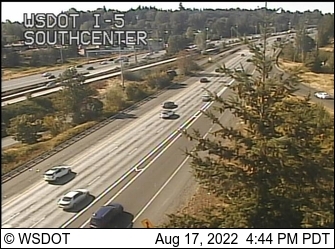 Connects to I-5 at south Tacoma, runs to Puyallup. 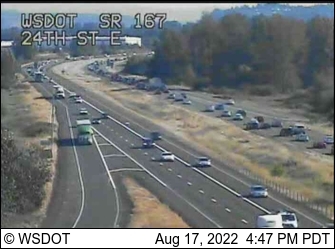 Runs east-west between Des Moines, through Covington and Highway 18, intersecting with SR 169. 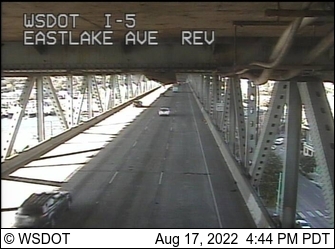 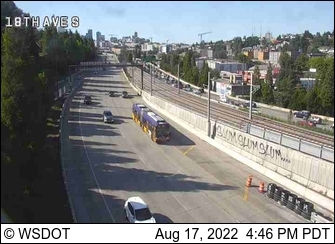 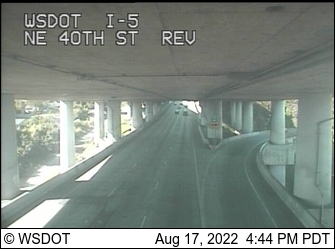 Runs between Seattle at I-5 and Redmond, across Lake Washington. 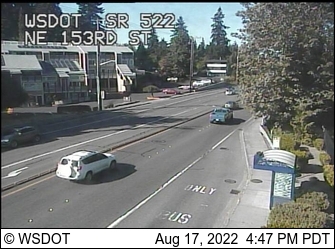 From Monroe, through Bothell skirting the north end of Lake Washington along Bothell Way, which becomes Lake City Way and connects with I-5. 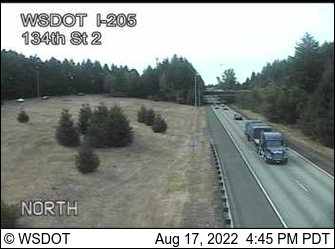 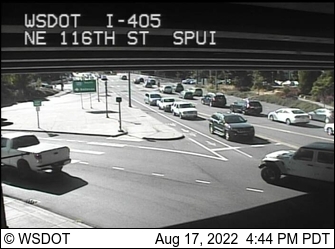 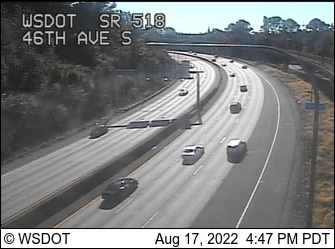 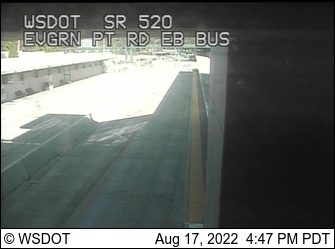 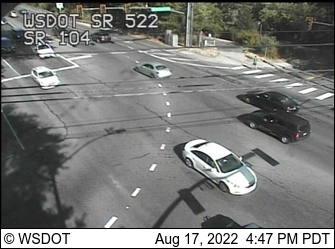 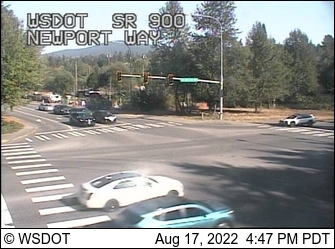 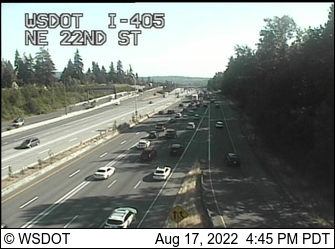 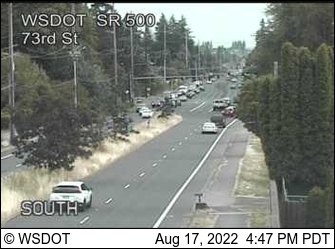 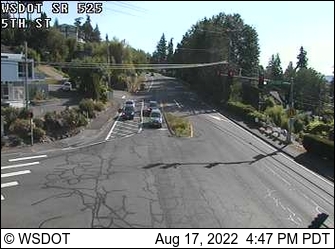 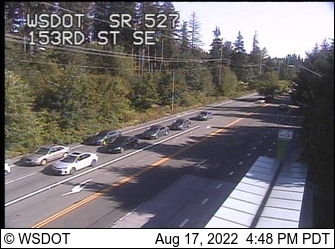 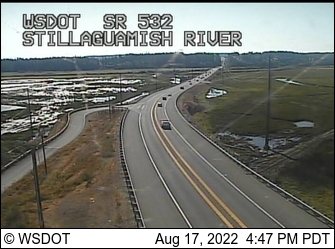 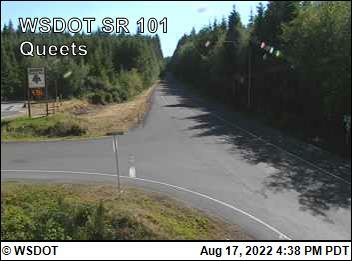 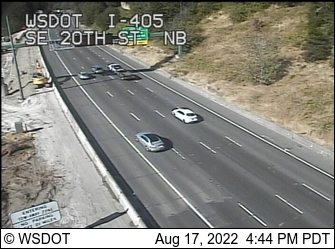 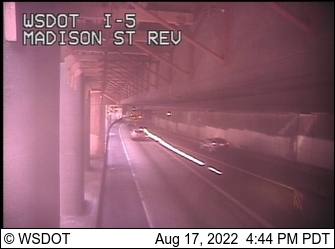 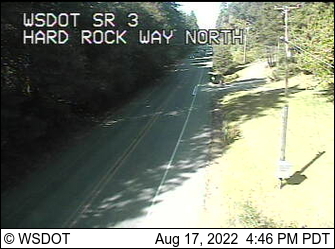 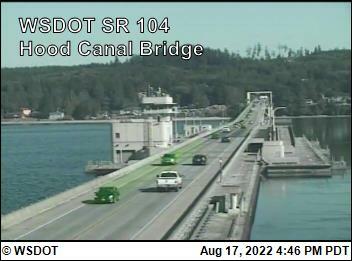 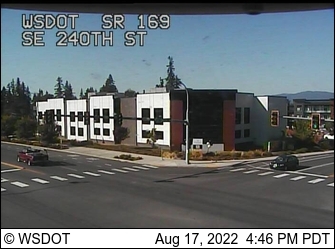 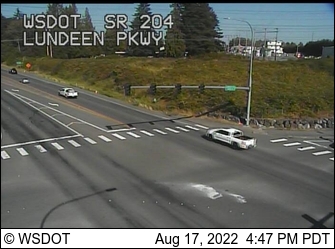 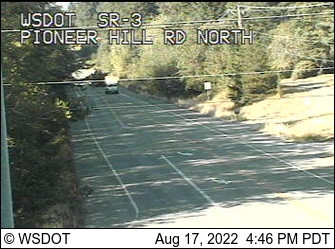 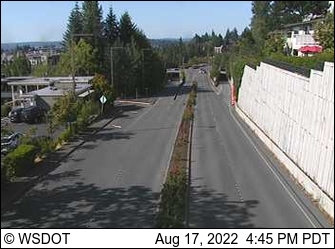 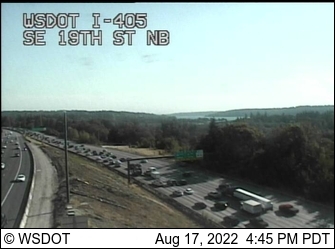 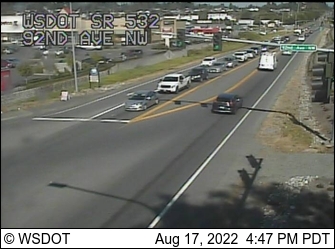 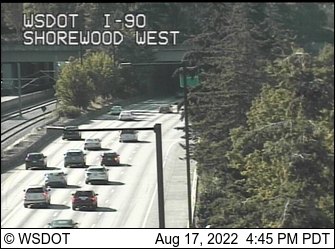 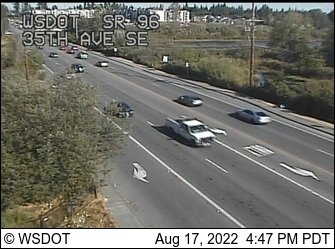 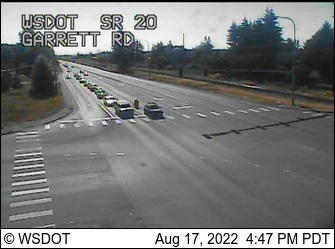 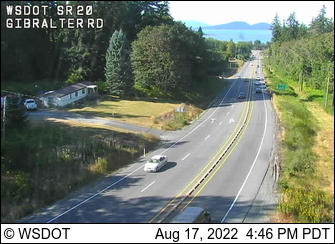 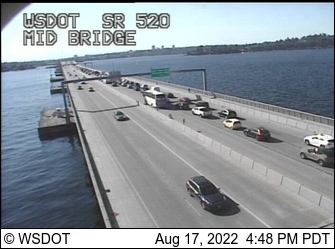 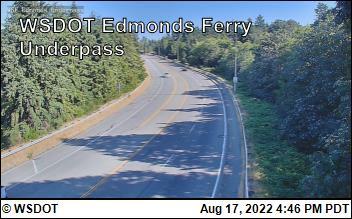 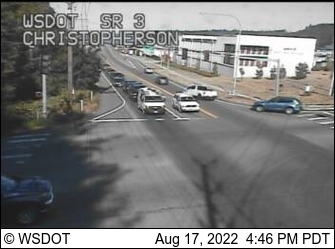 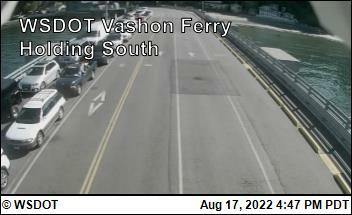 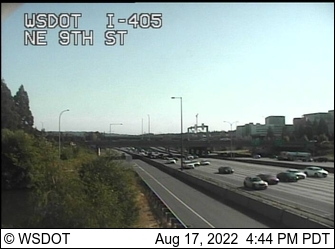 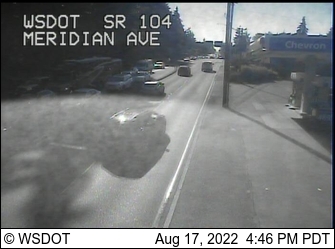 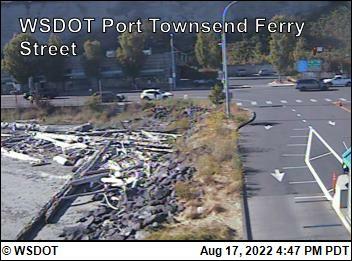 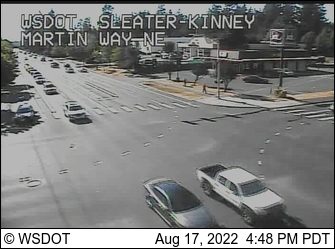 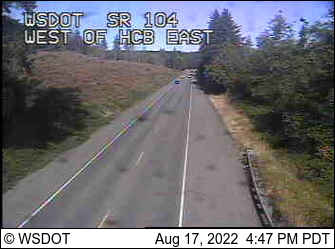 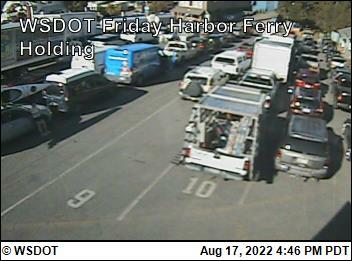 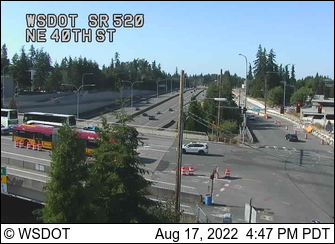 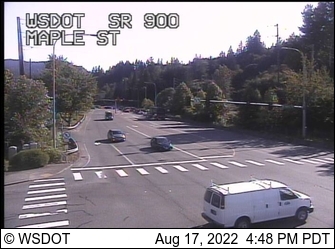 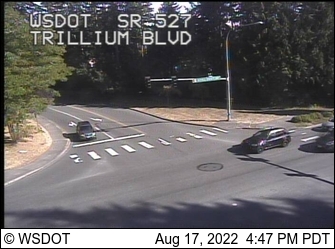 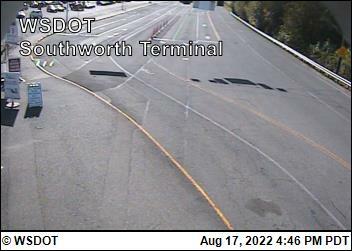 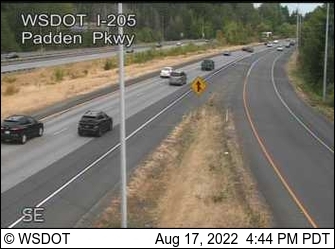 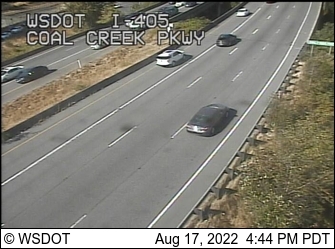 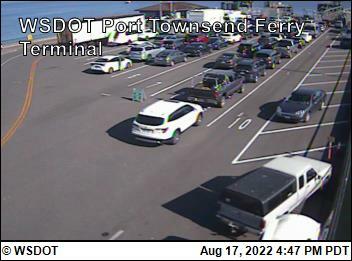 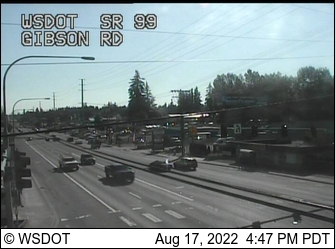 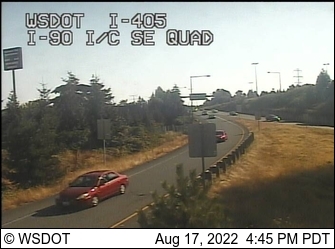 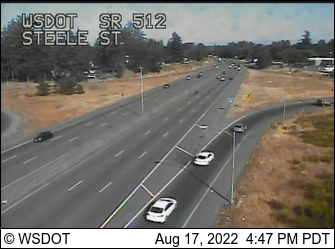 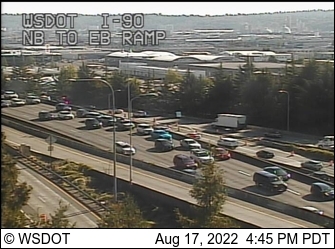 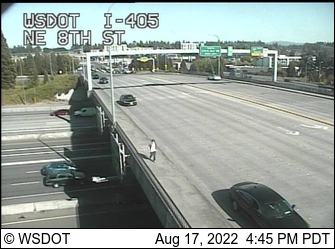 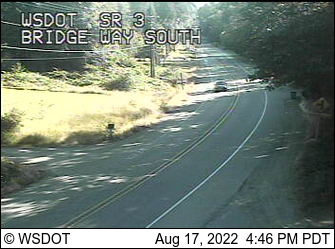 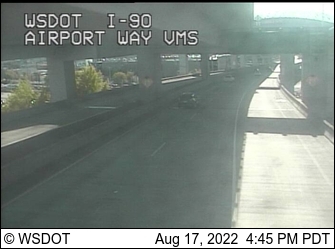 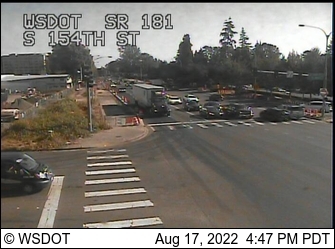 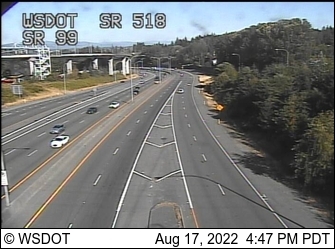 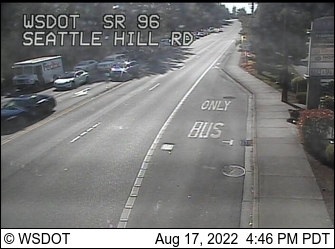 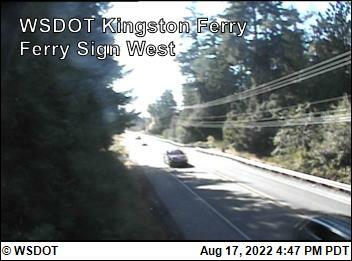 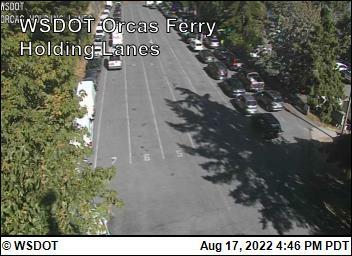 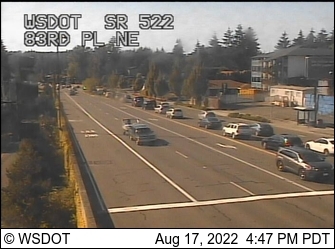 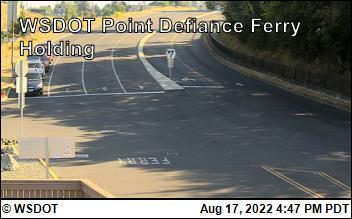 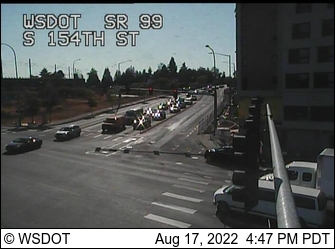 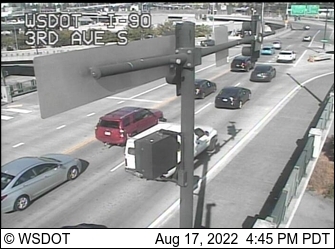 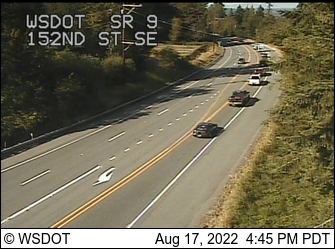 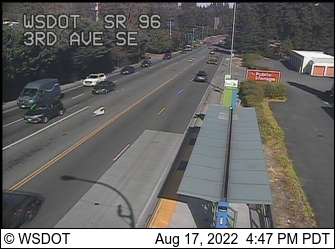 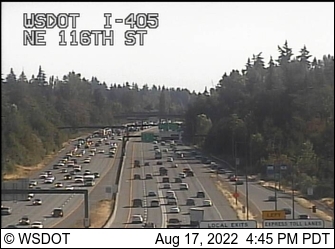 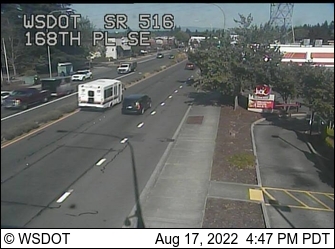 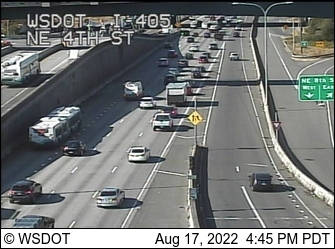 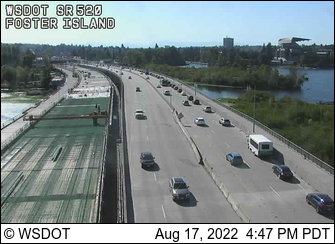 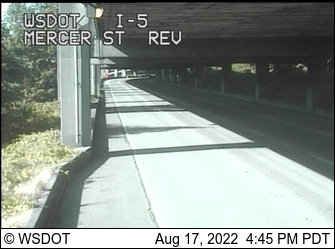 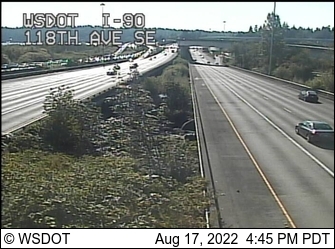 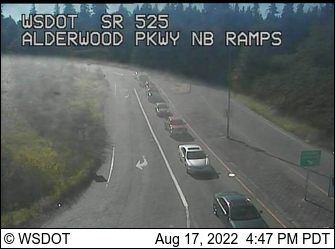 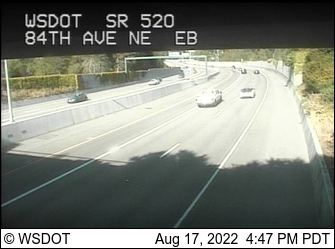 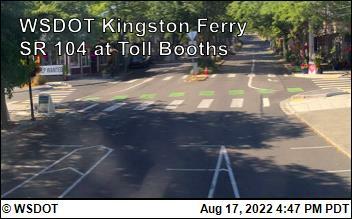 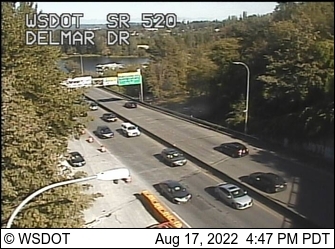 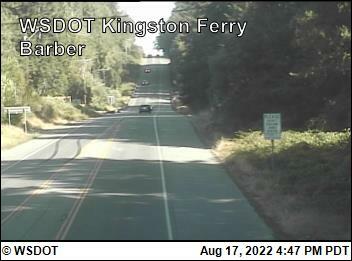 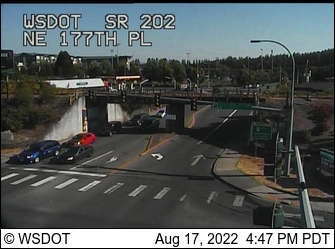 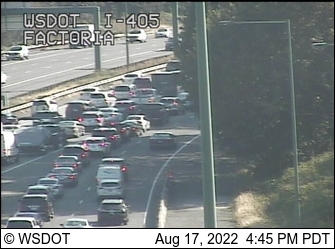 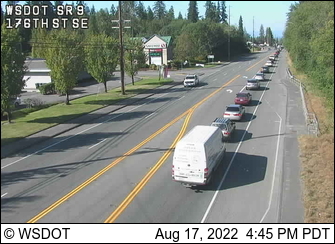 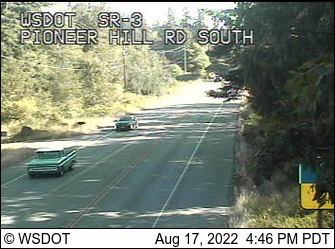 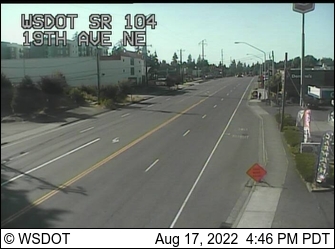 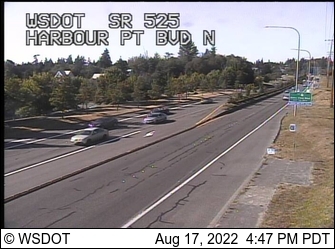 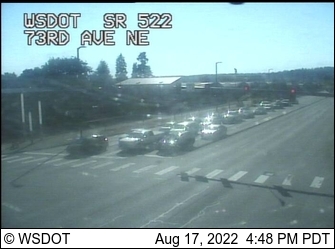 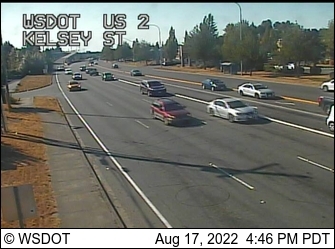 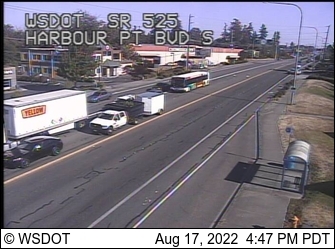 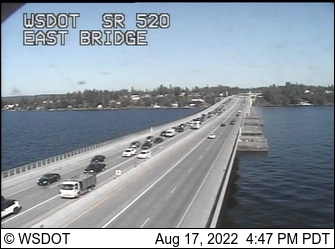 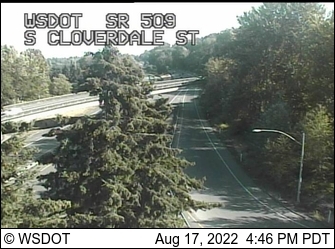 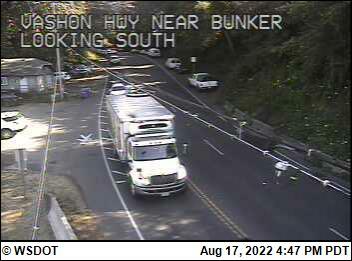 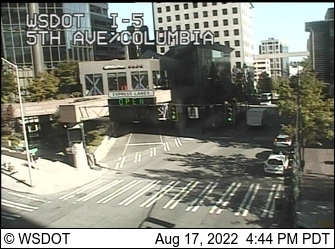 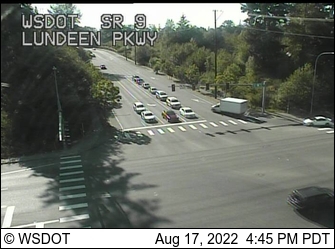 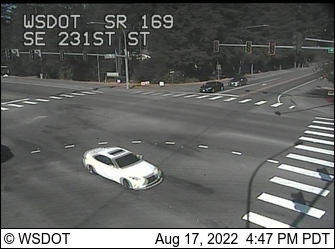 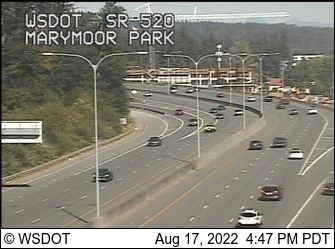 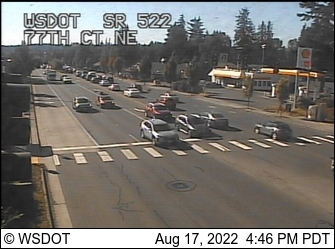 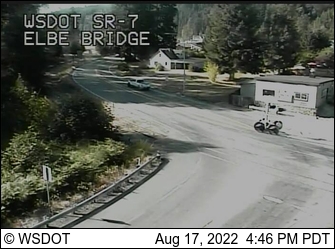 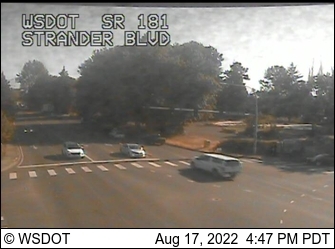 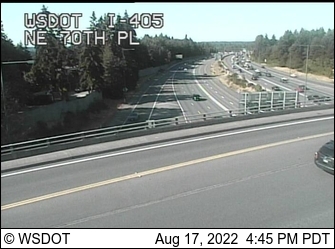 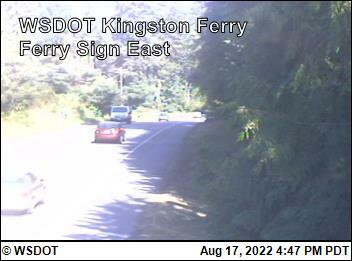 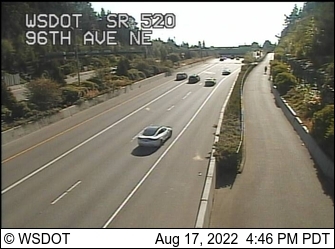 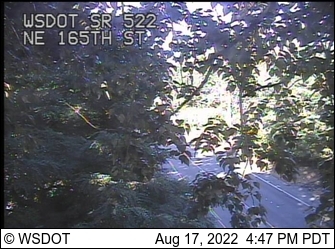 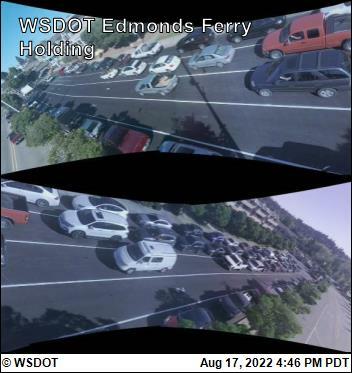 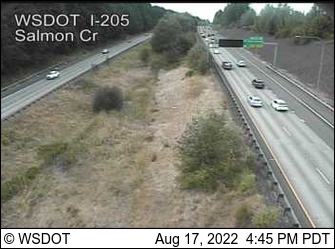 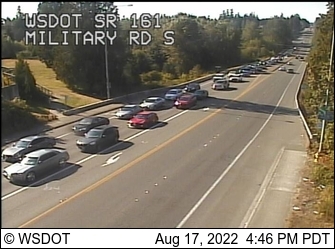 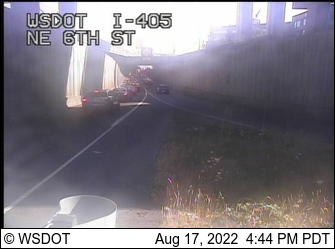 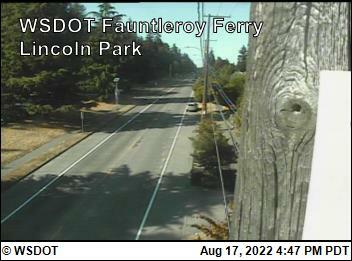 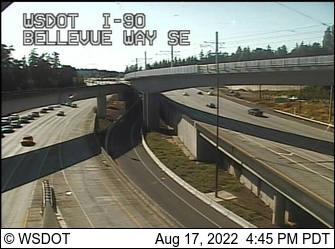 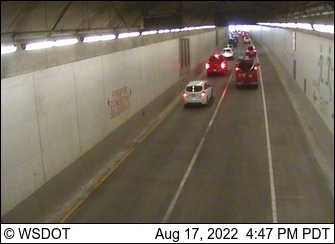 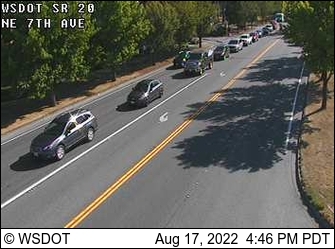 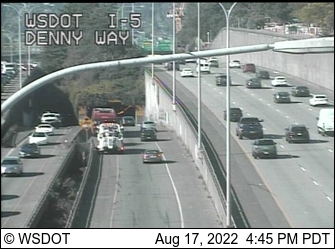 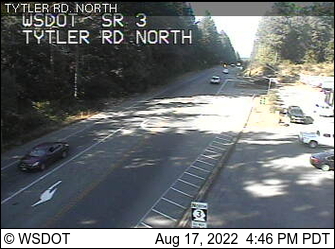 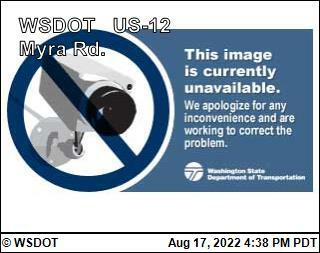 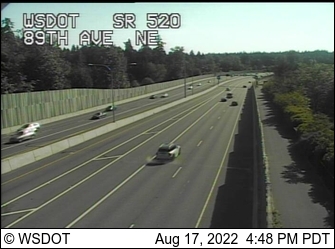 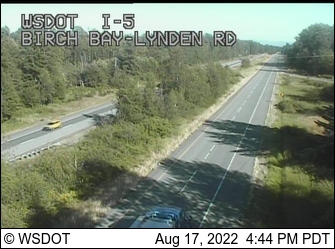 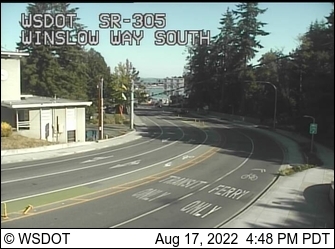 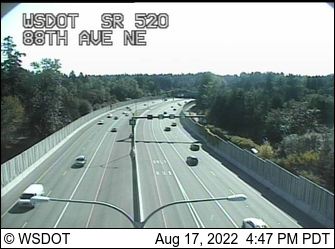 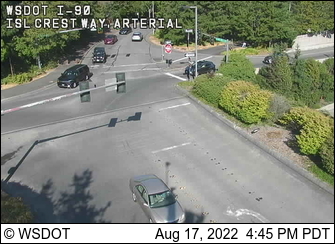 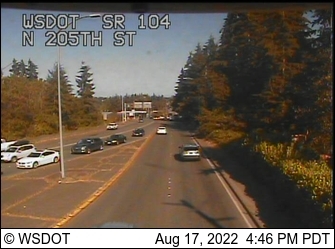 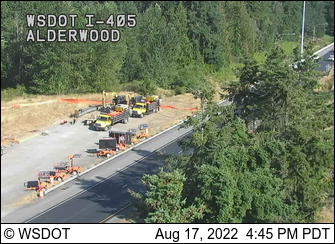 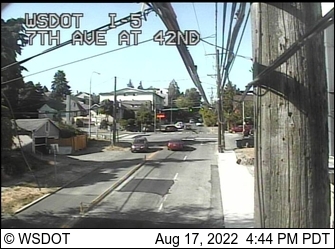 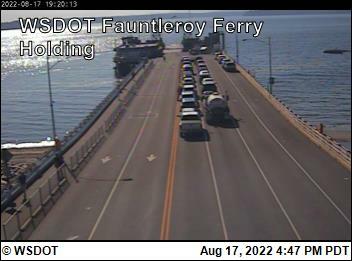 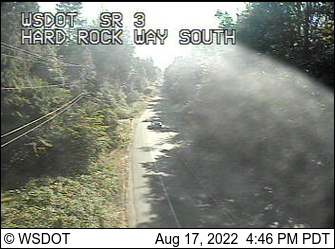 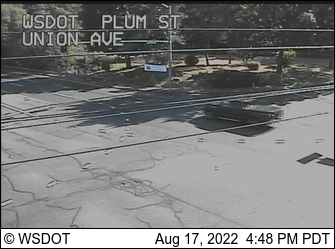 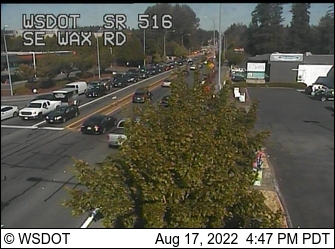 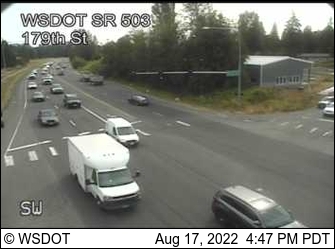 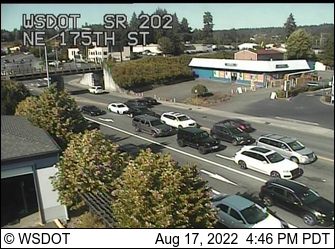 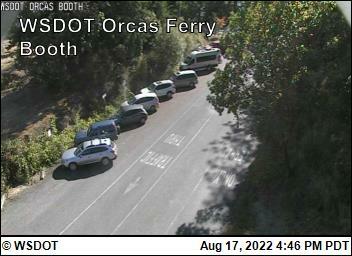 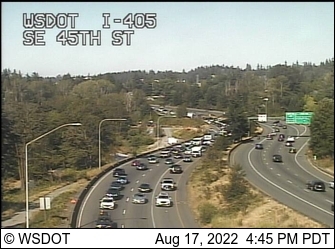 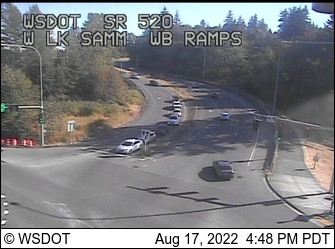 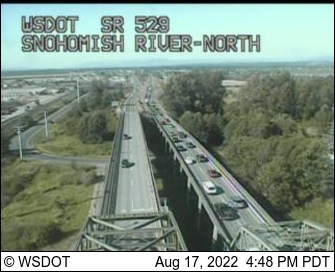 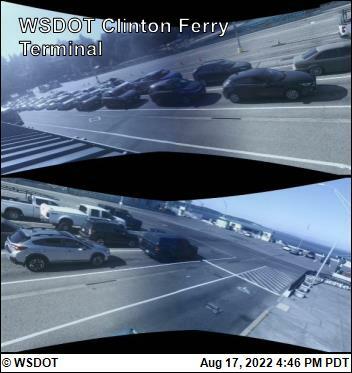 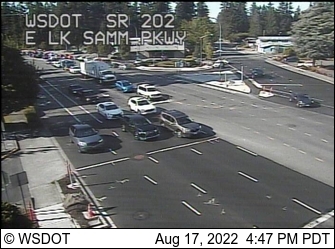 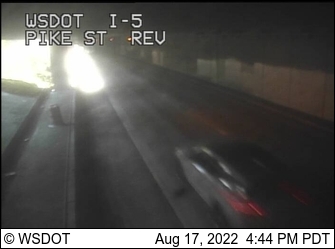 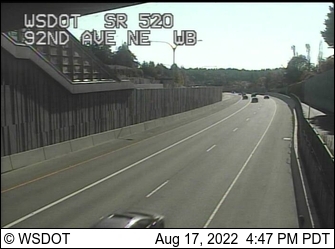 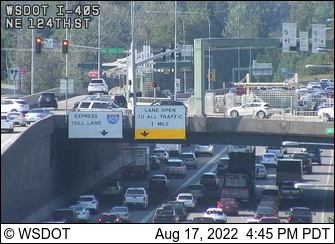 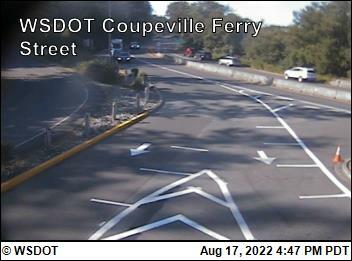 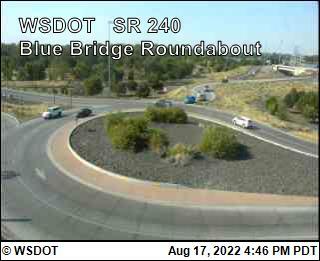 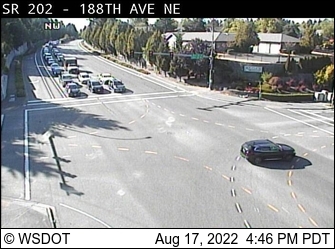 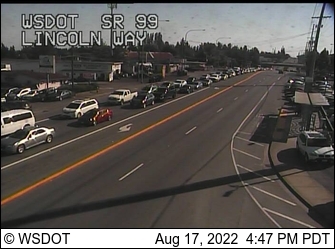 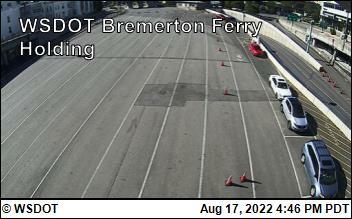 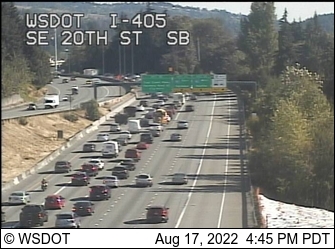 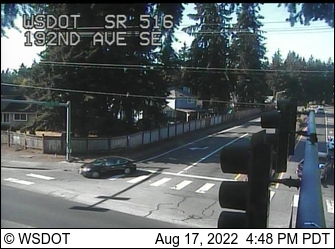 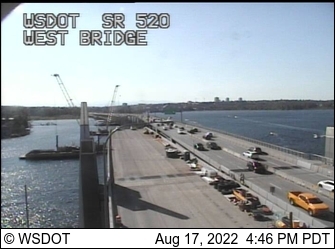 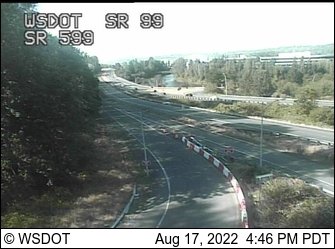 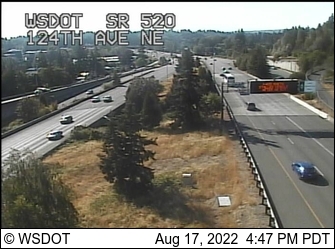 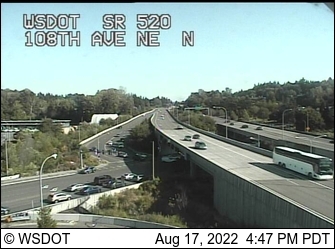 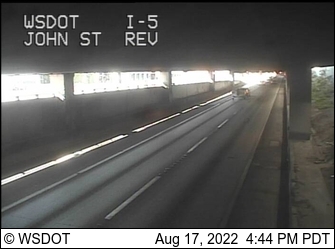 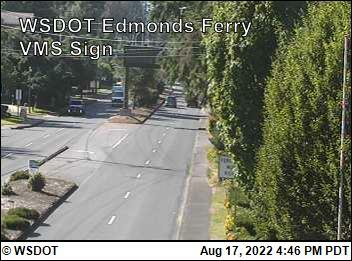 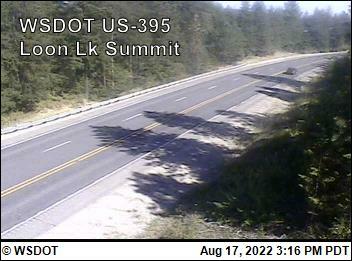 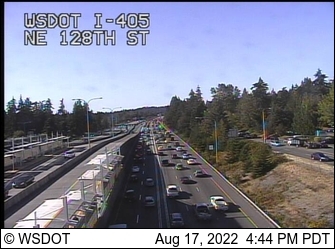 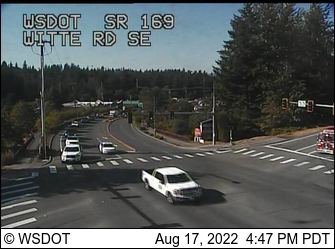 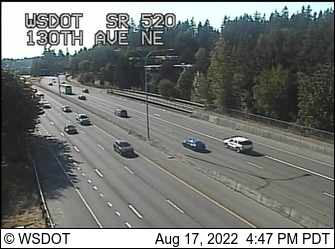 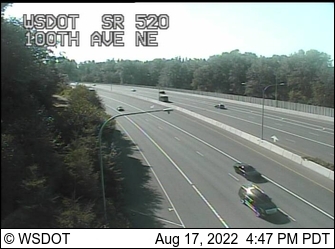 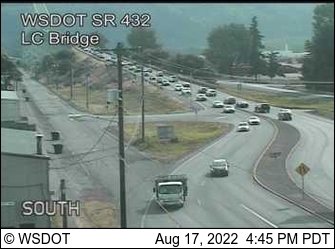 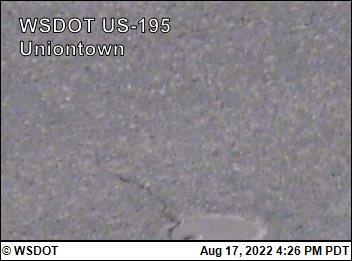 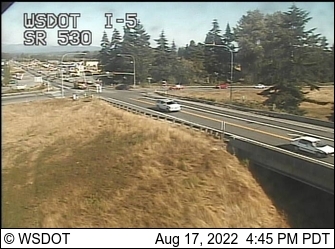 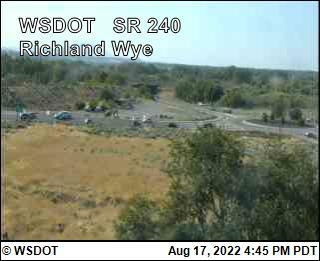 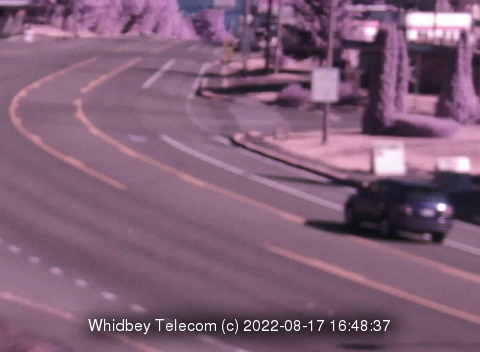 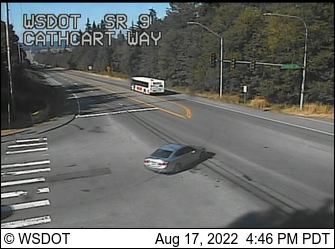 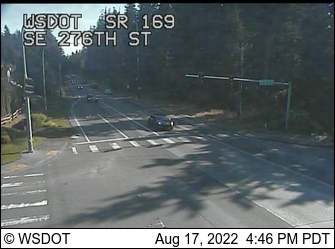 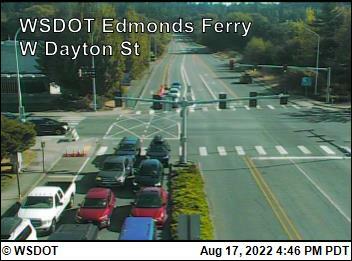 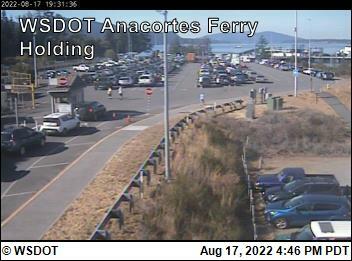 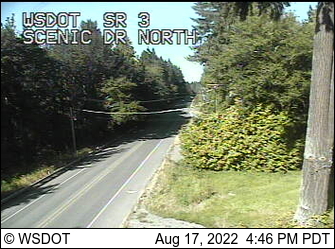 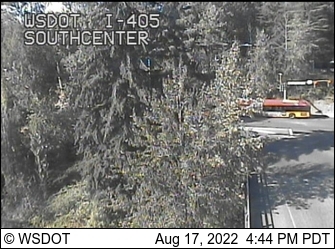 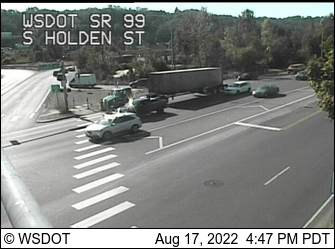 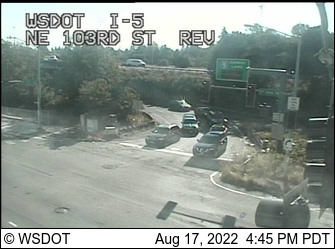 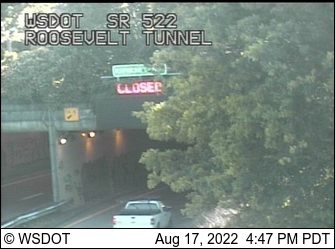 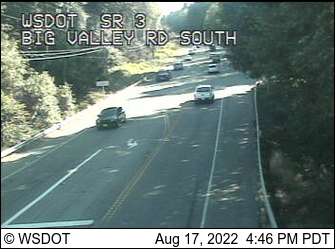 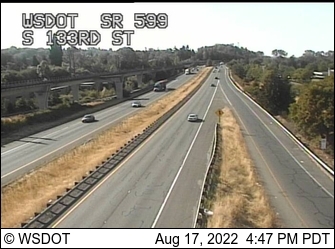 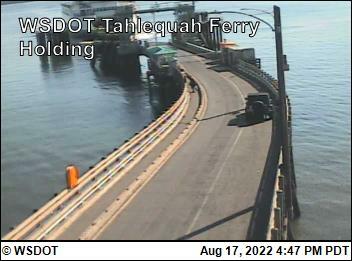 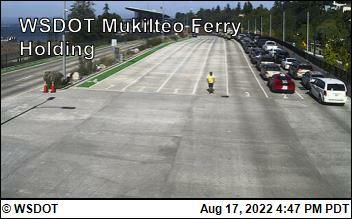 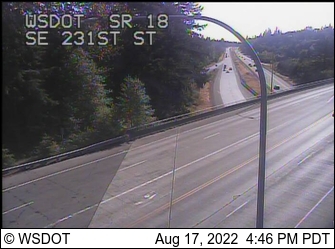 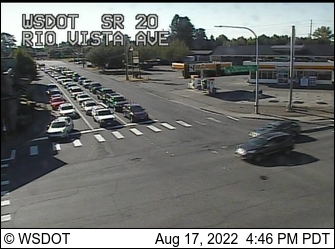 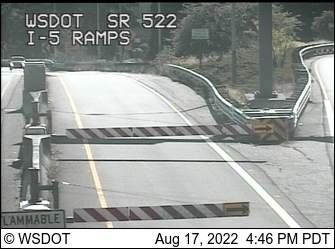 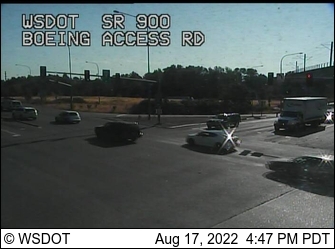 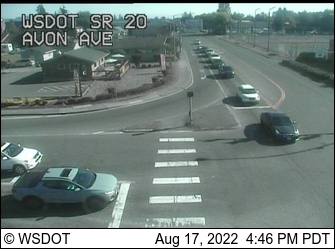 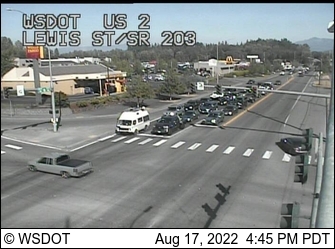 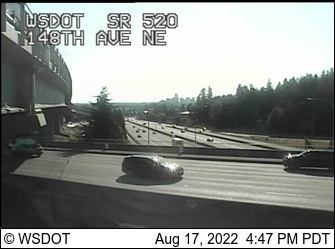 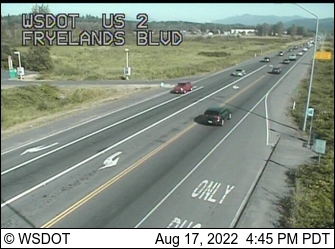 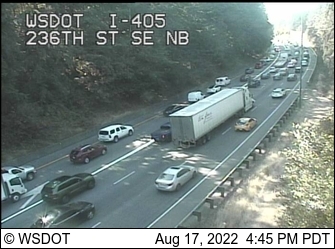 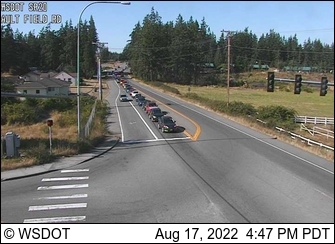 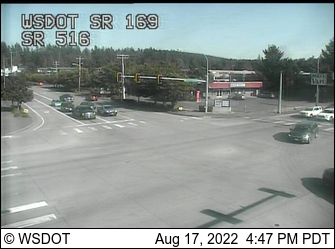 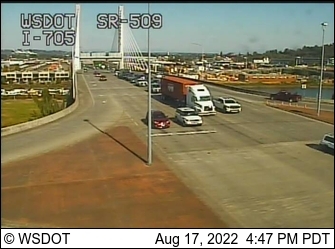 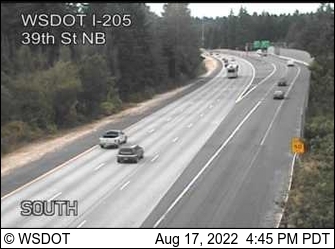 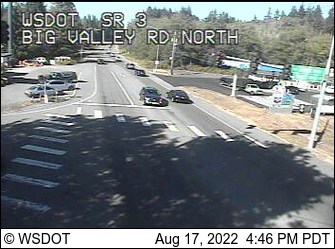 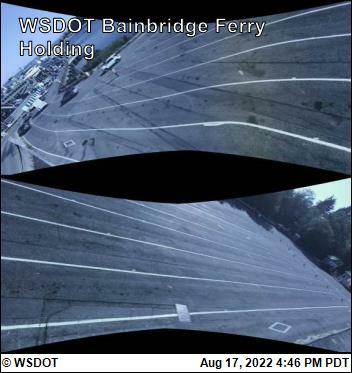 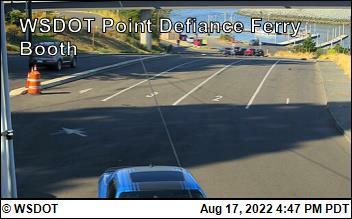 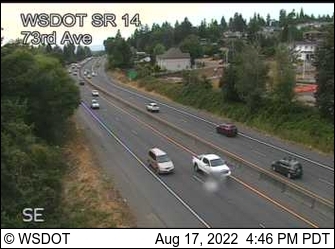 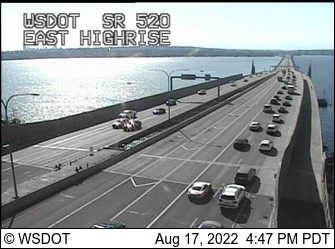 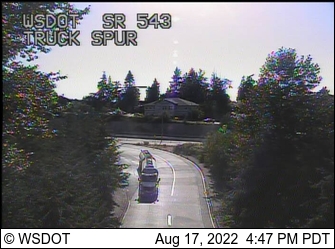 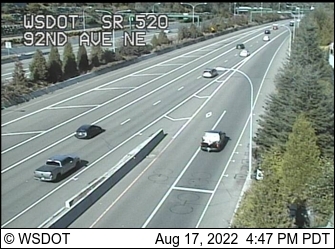 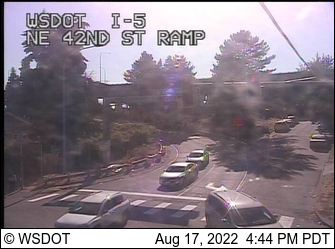 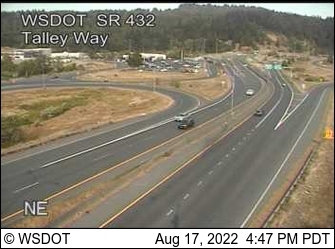 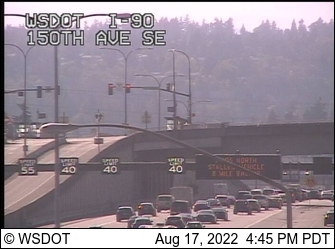 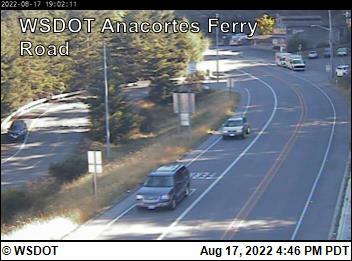 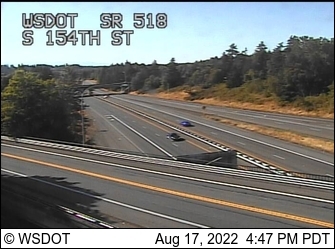 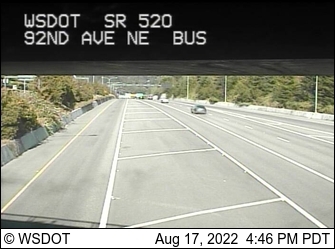 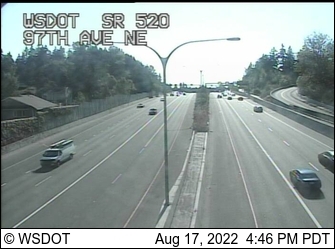 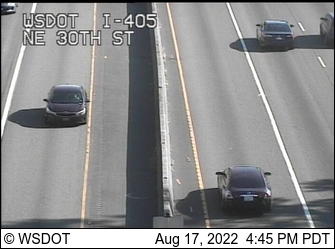 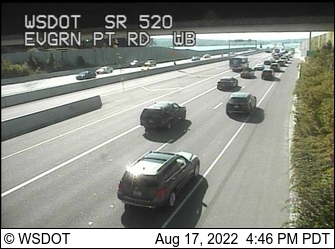 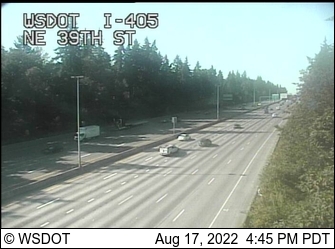 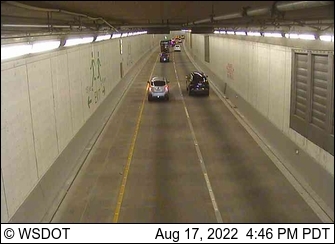 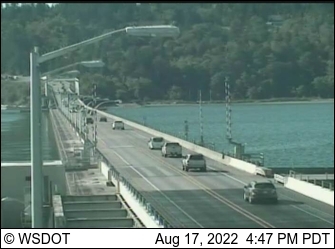 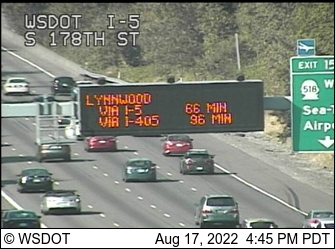 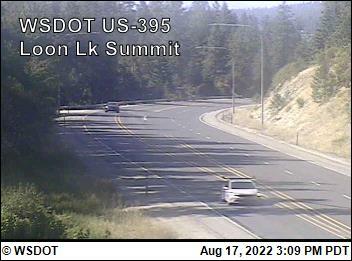 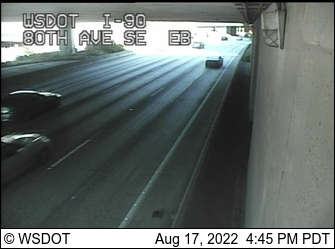 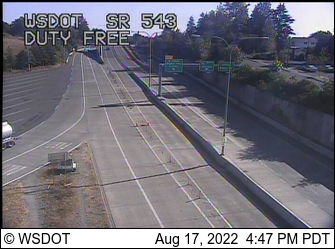 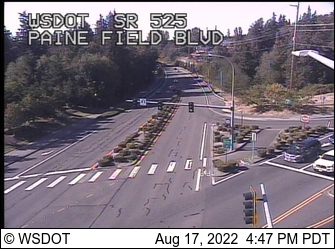 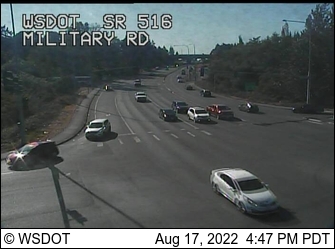 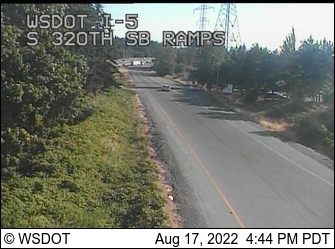 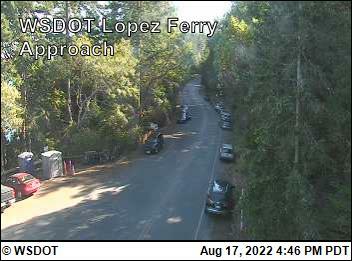 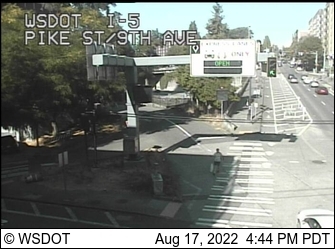 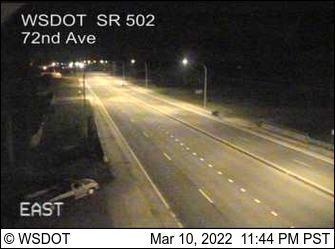 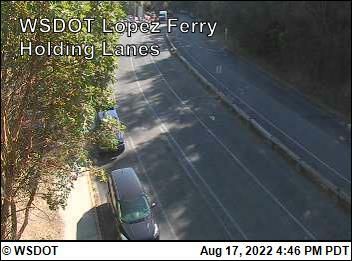 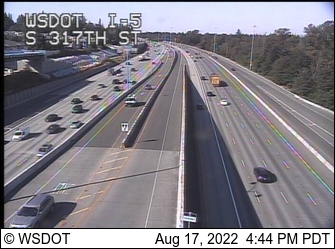 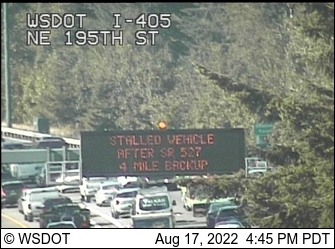 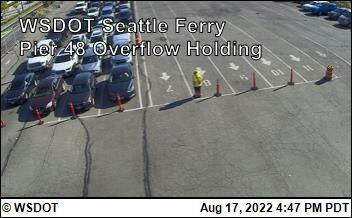 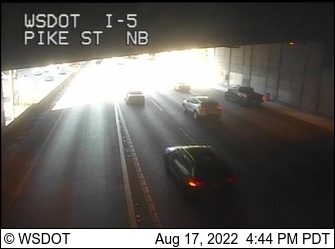 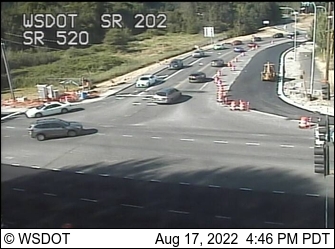 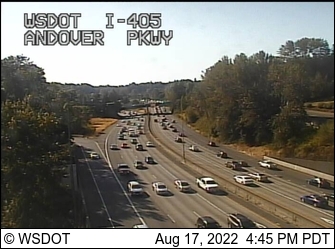 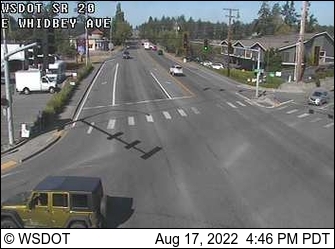 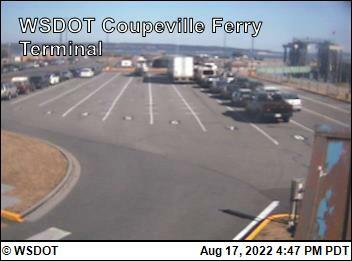 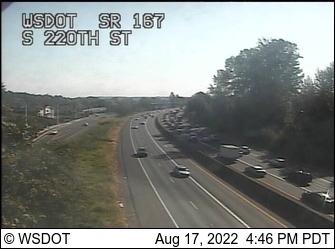 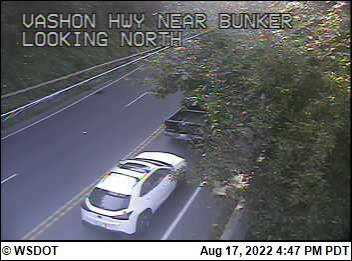 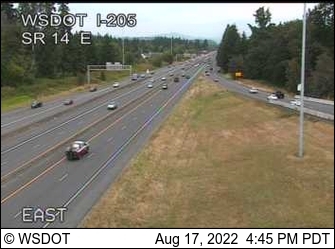 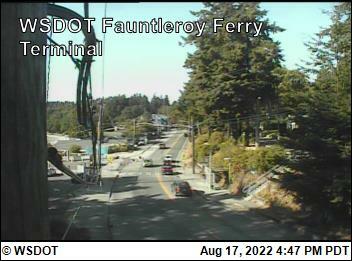 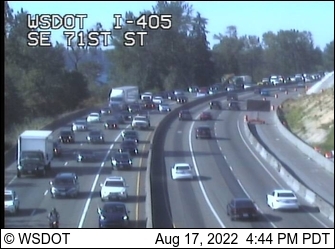 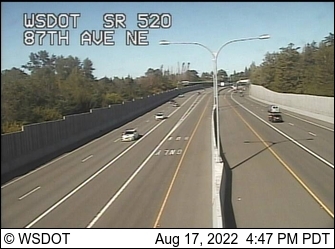 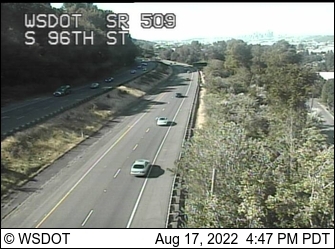 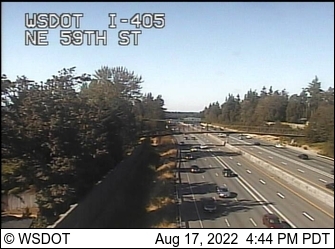 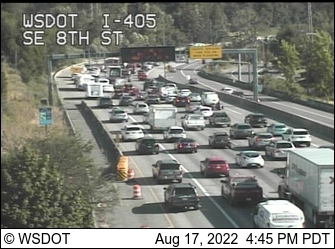 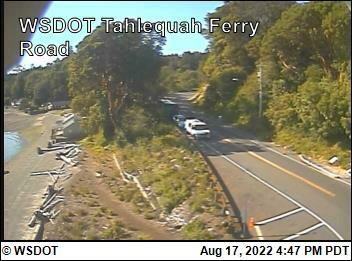 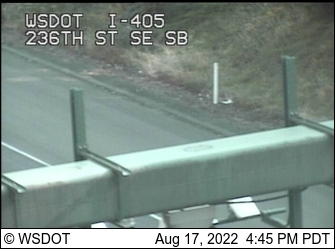 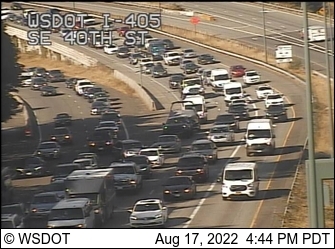 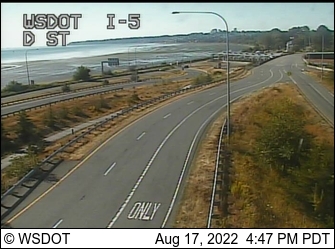 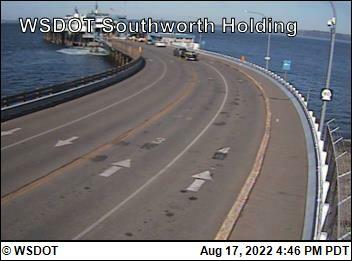 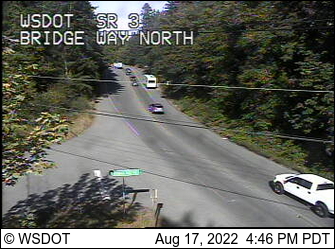 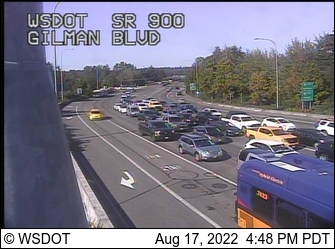 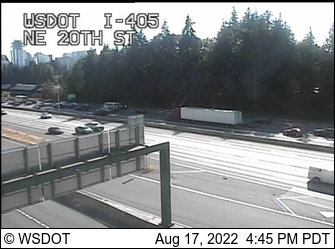 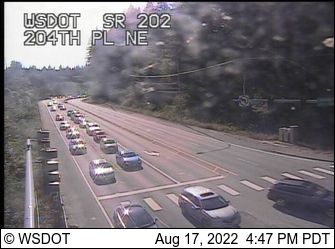 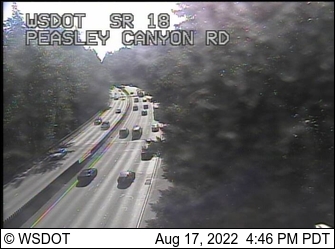 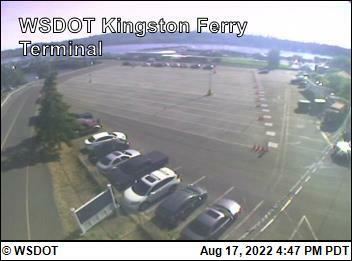 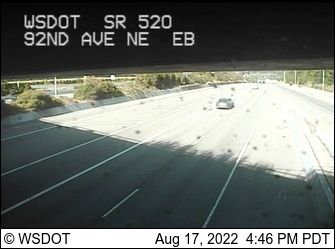 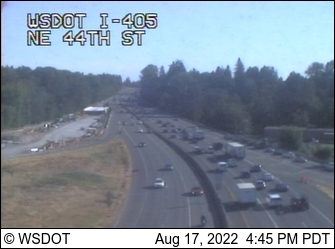 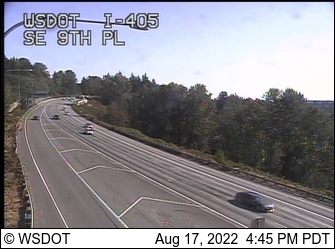 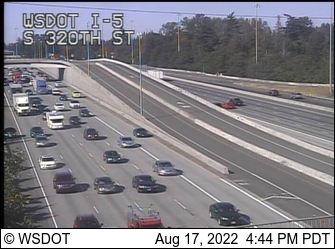 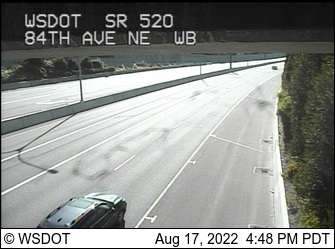 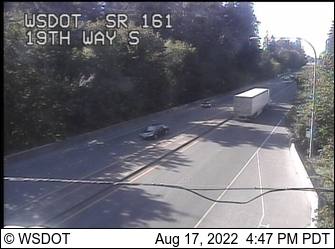 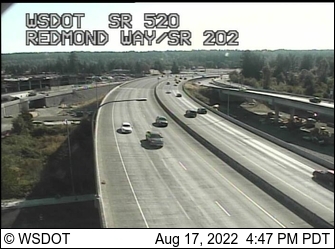 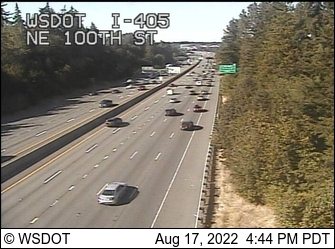 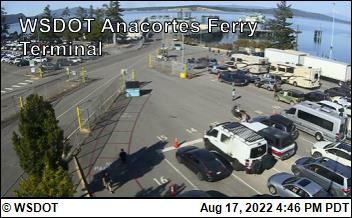 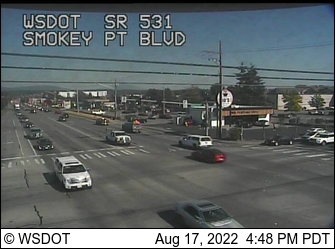 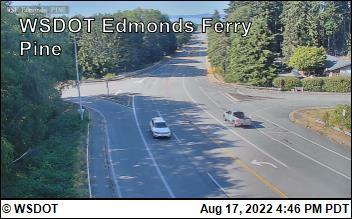 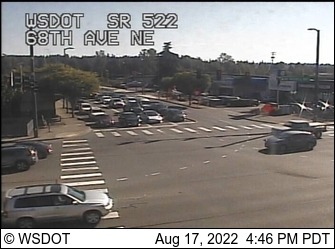 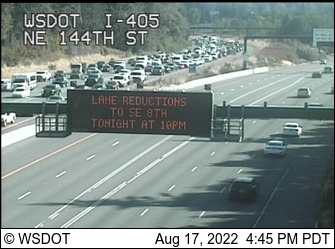 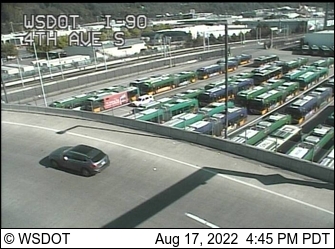 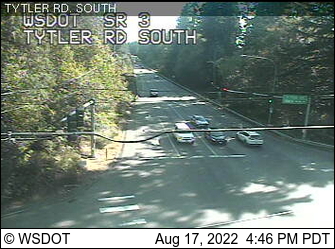 Covers the southern half of Whidbey Island to the ferry between Clinton and Mukilteo and continues south to Lynnwood. 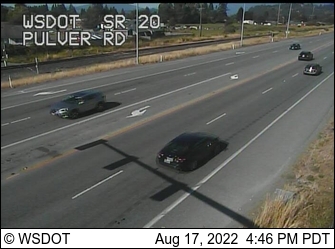 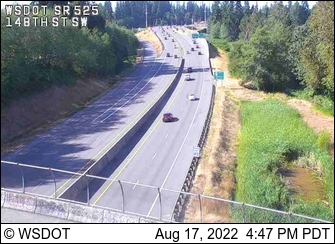 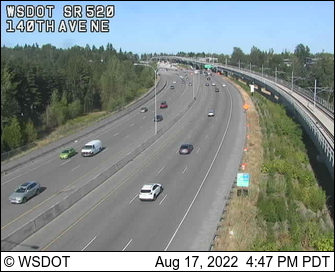 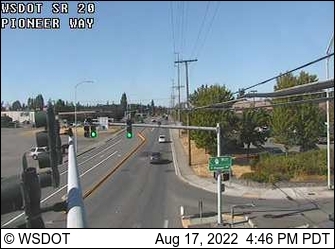 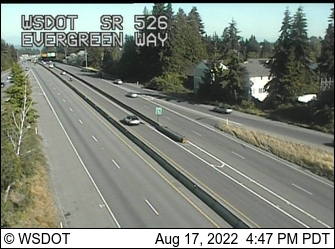 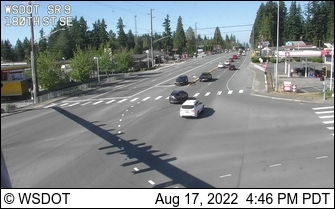 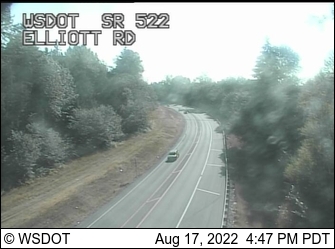 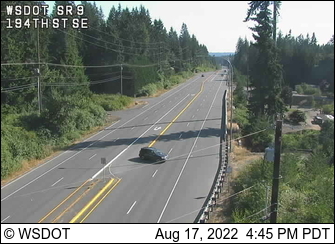 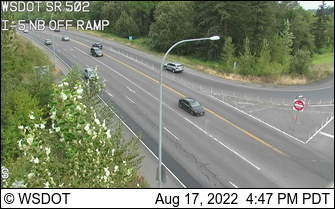 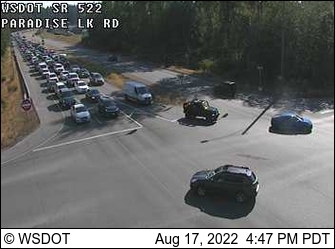 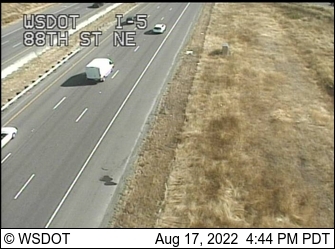 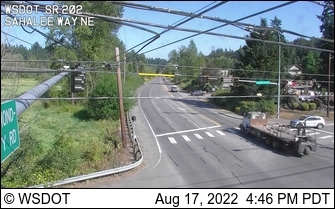 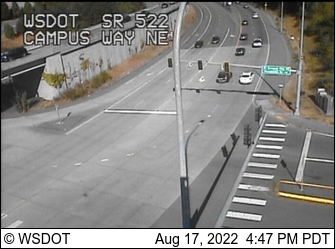 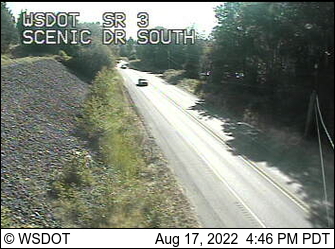 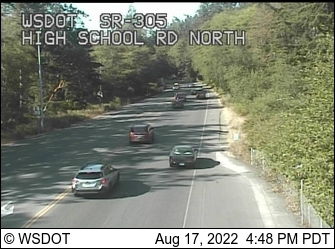 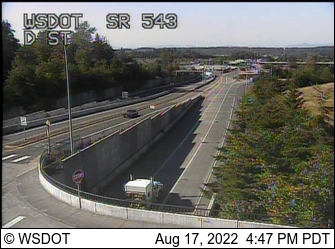 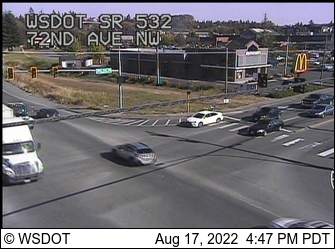 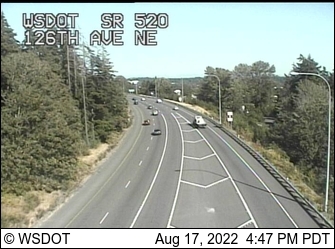 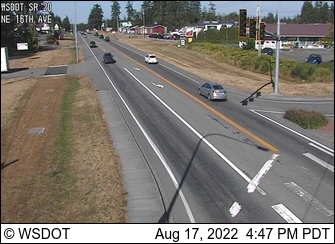 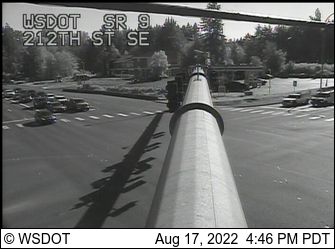 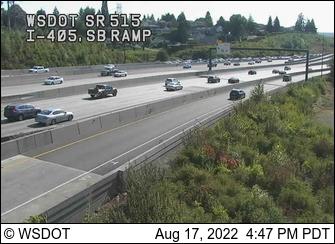 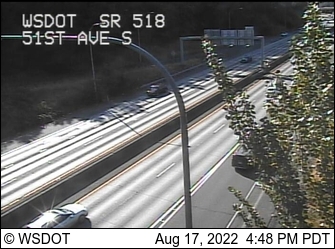 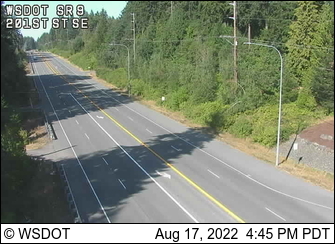 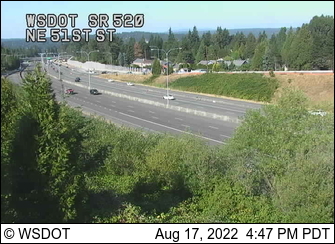 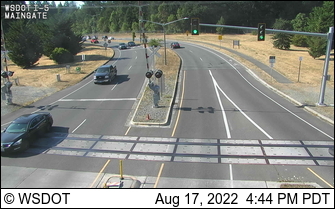 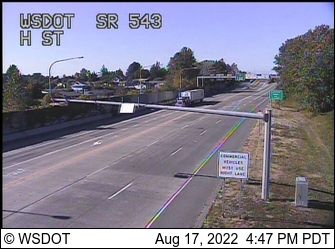 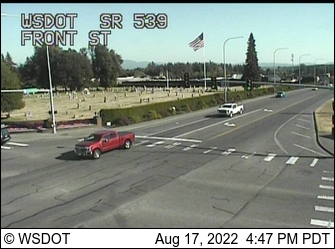 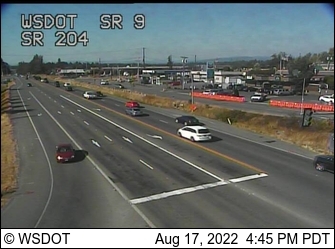 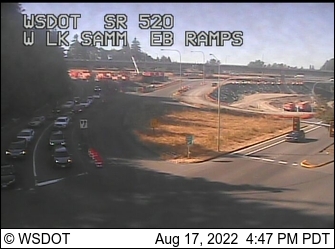 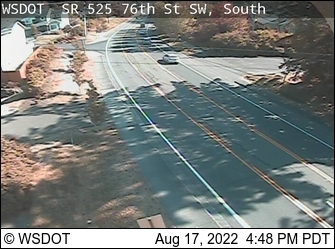 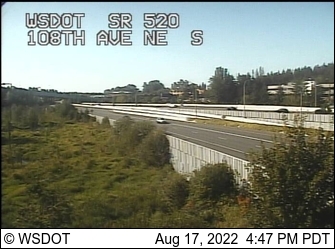 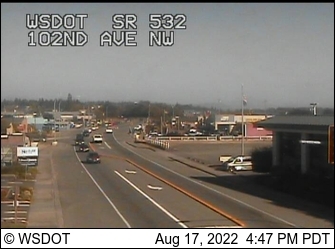 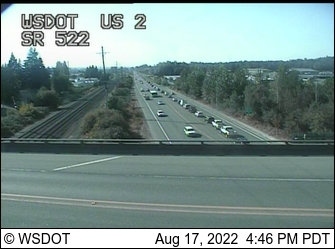 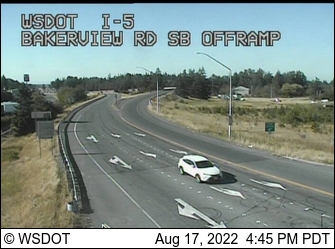 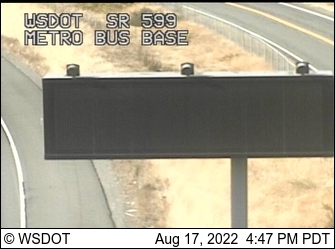 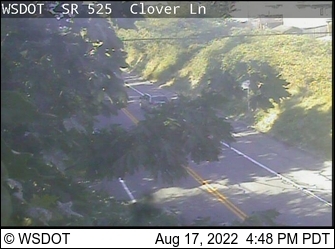 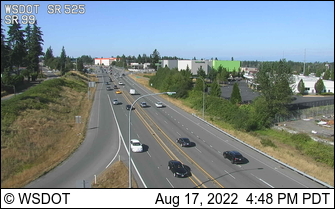 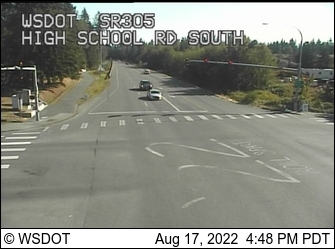 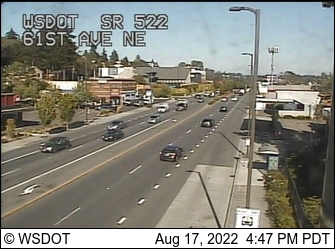 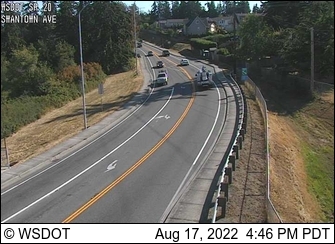 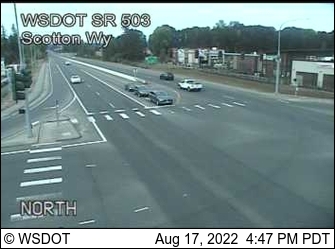 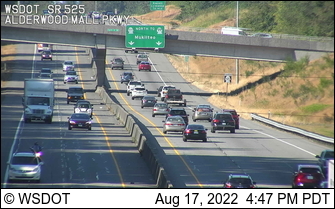 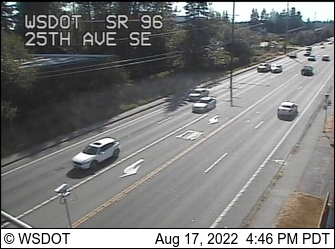 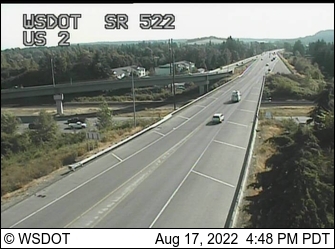 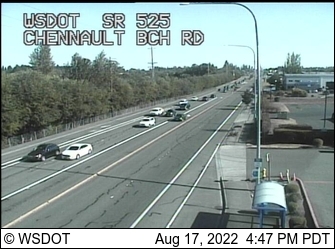 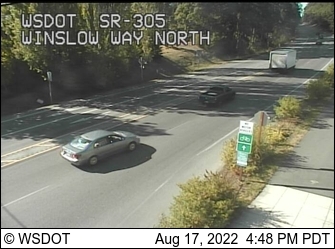 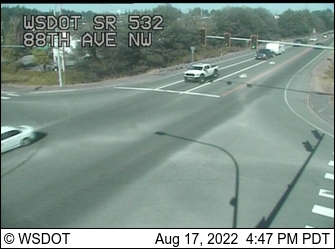 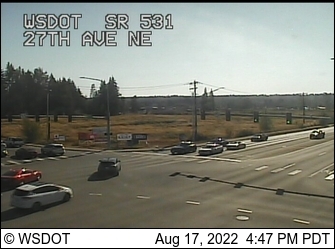 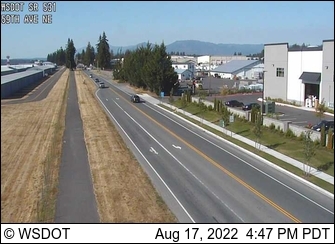 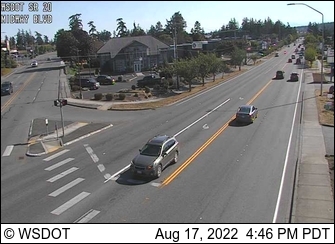 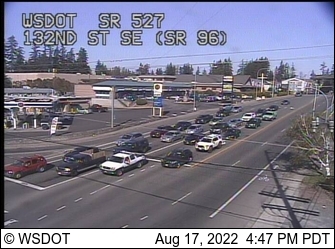 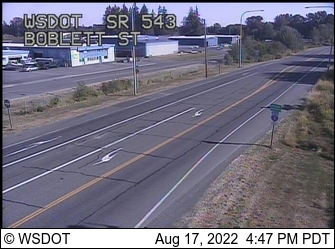 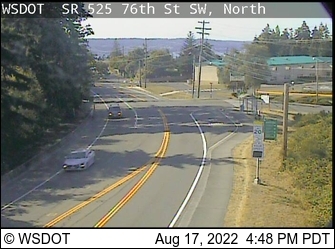 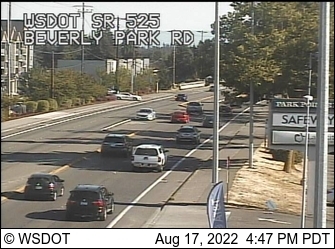 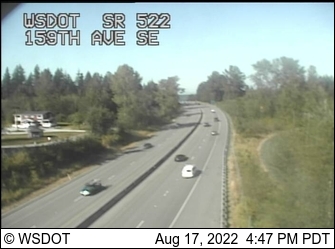 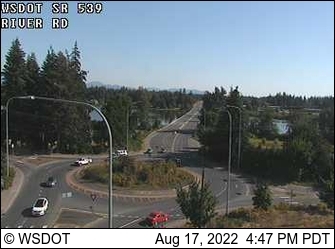 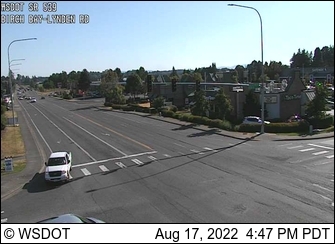 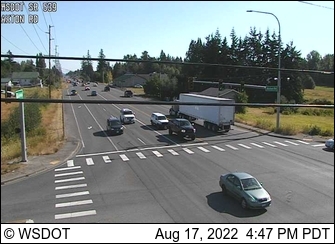 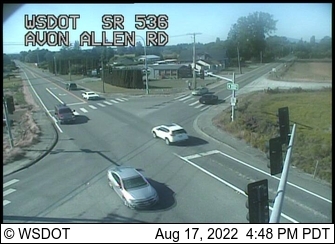 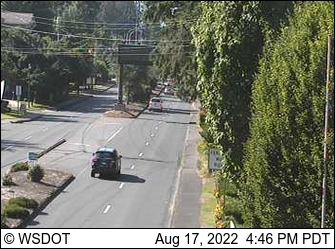 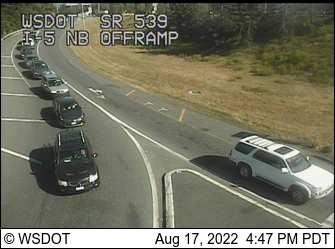 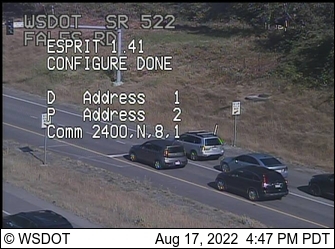 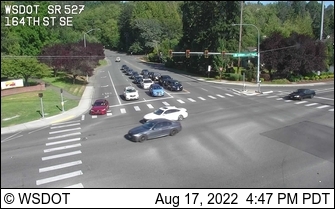 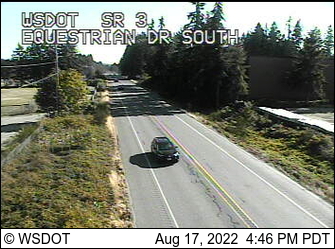 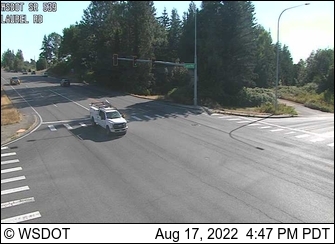 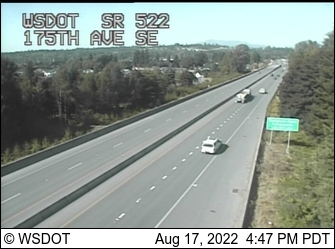 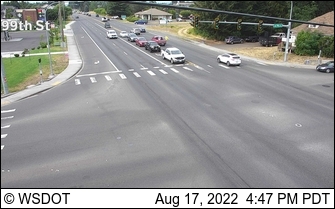 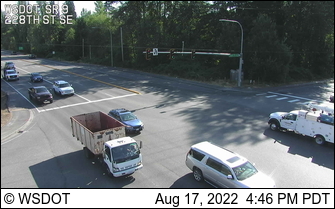 Runs south of Everett from SR 525 in Mukilteo and connects to I-5. 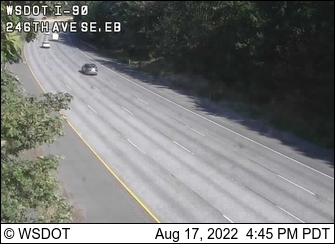 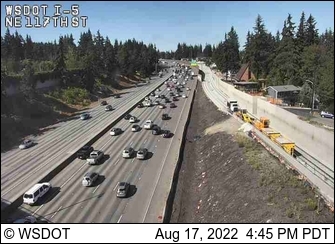 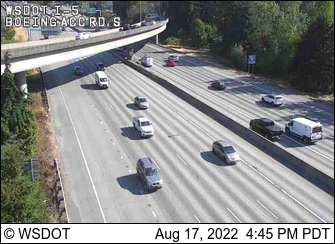 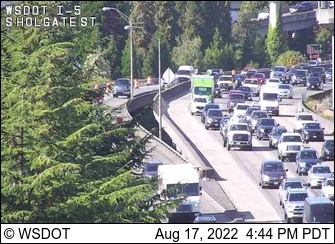 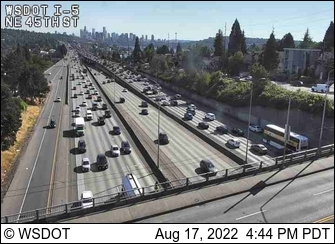 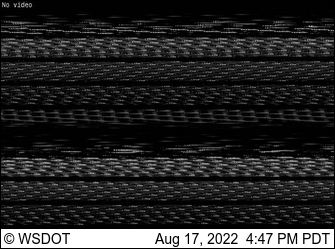 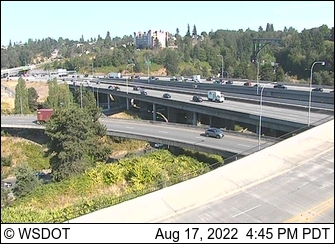 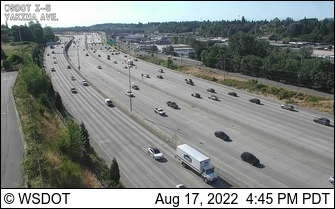 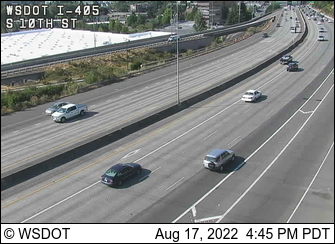 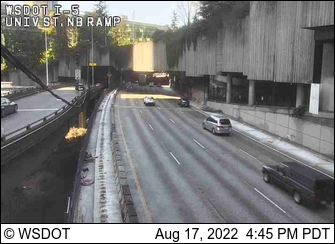 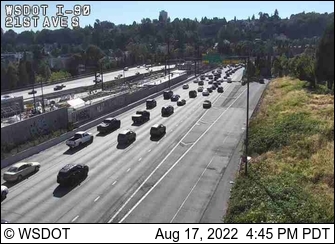 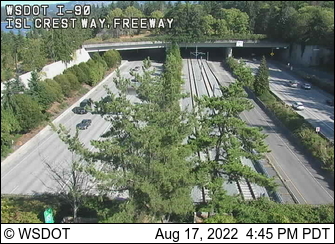 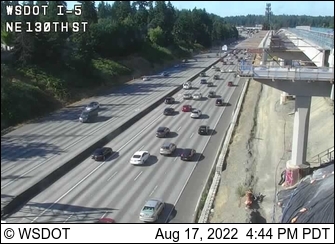 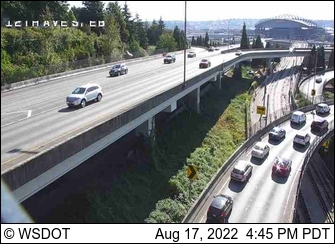 Connects Everett, Mill Creek and Bothell, paralleling I-5. 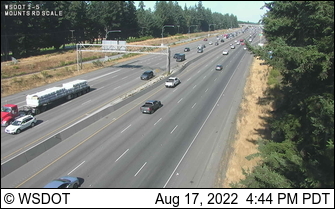 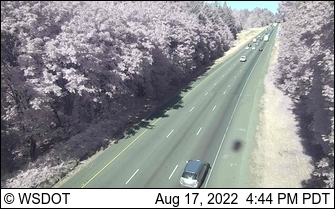 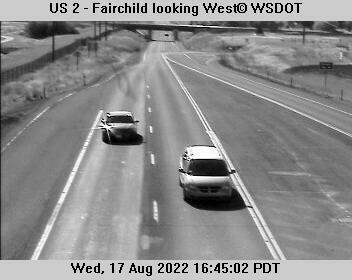 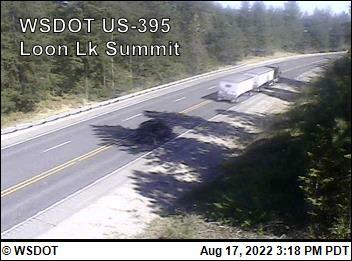 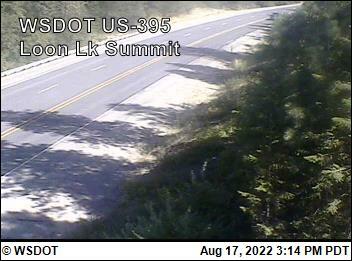 Runs from the Canadian border south to I-5 near Bellingham. 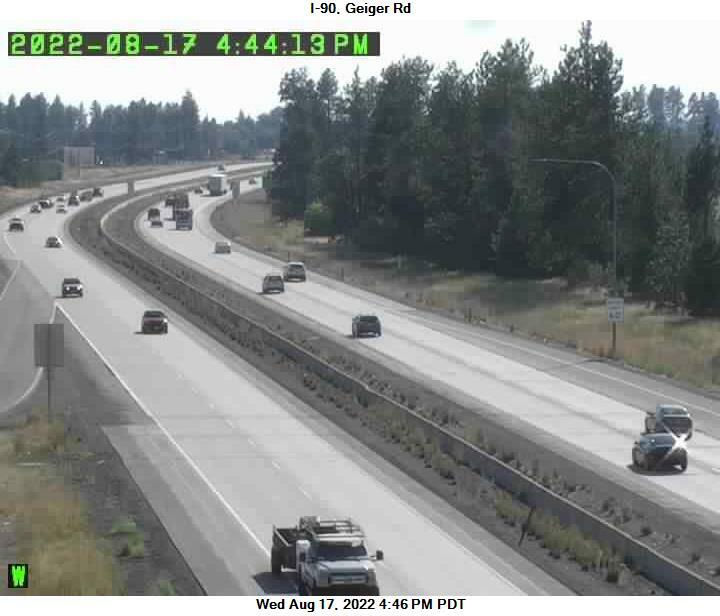 Connects from I-5 in Blaine, WA to Hwy 15 in Canada. 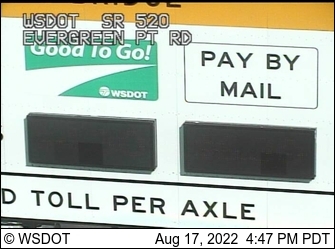 Border crossing for all busses and commercial vehicles. 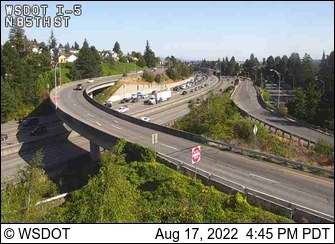 Connects I-5 to SR 99, just south of SeaTac. 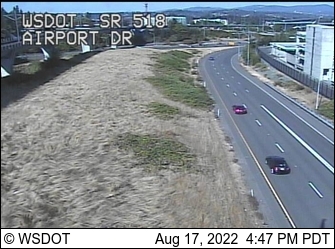 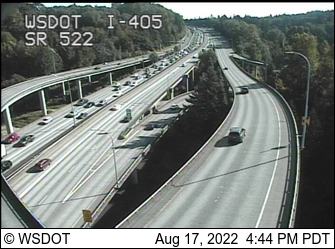 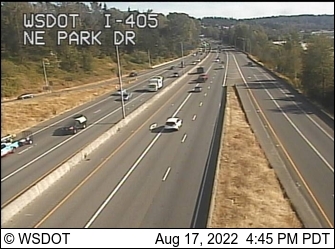 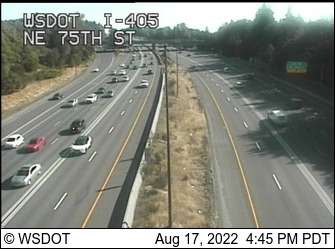 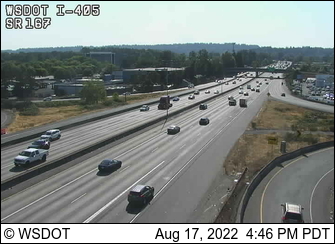 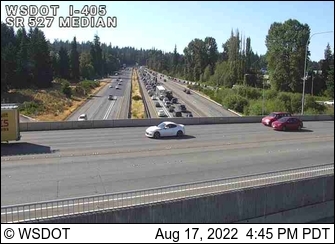 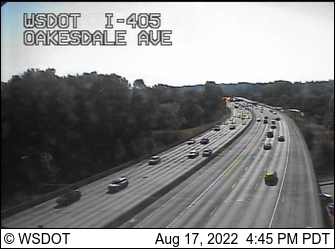 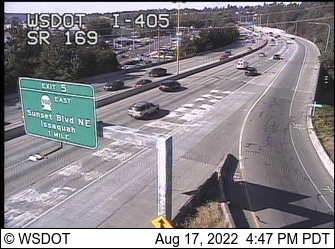 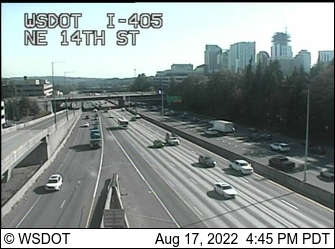 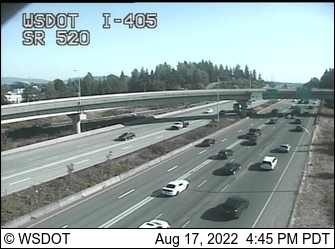 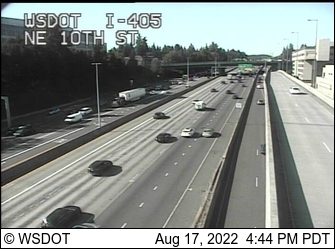 North of Tukwila, connects I-5 and I-405. 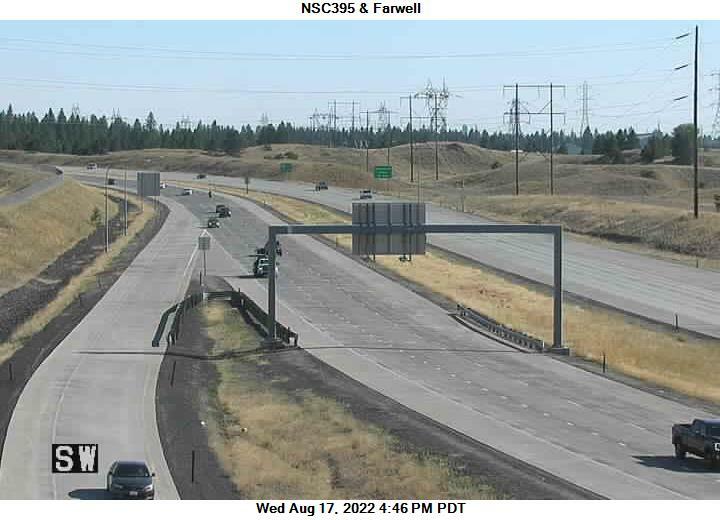 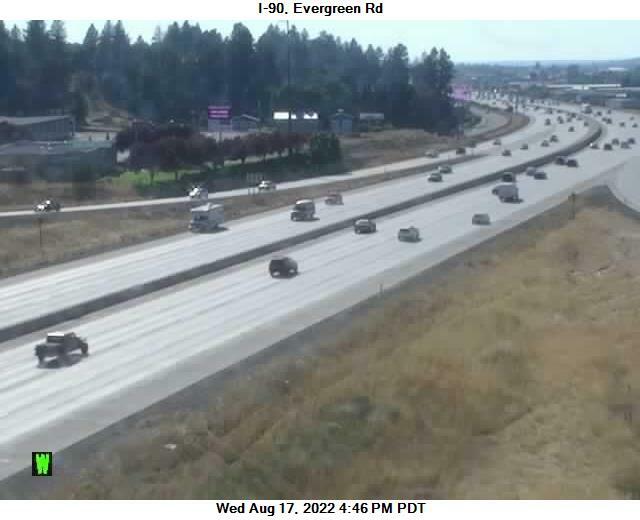 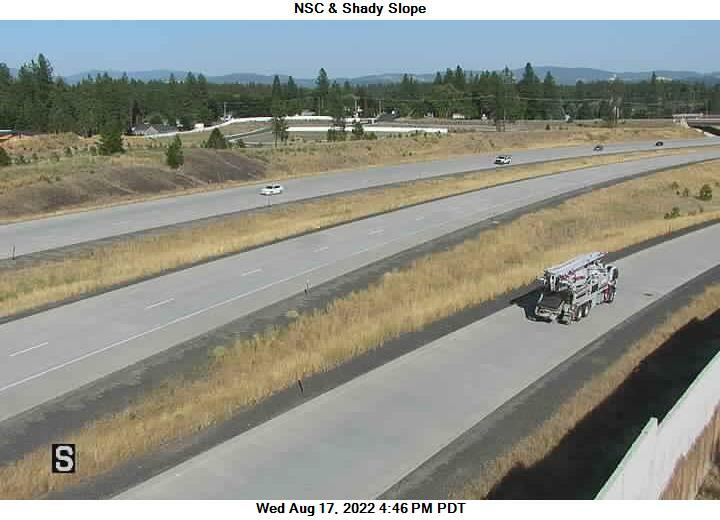 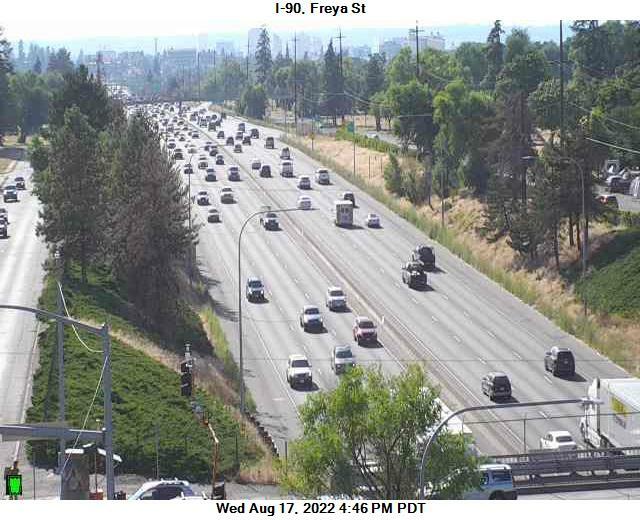 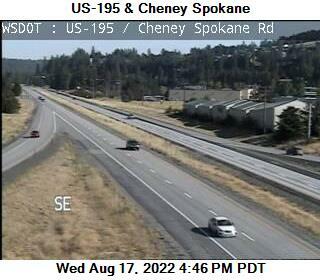 Connects Cheney to Interstate 90 near Spokane. 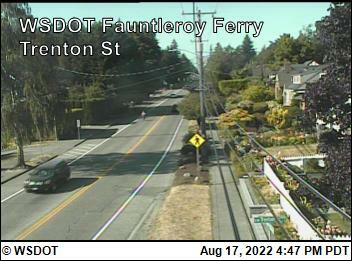 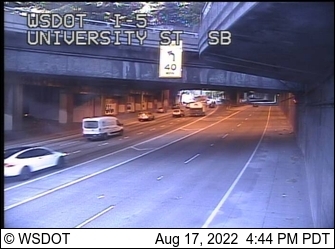 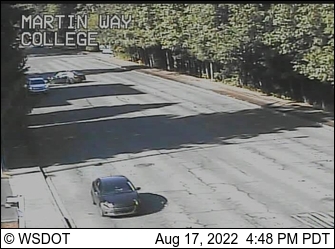 WSF Fauntleroy Way and Cloverdale St.